(ca. 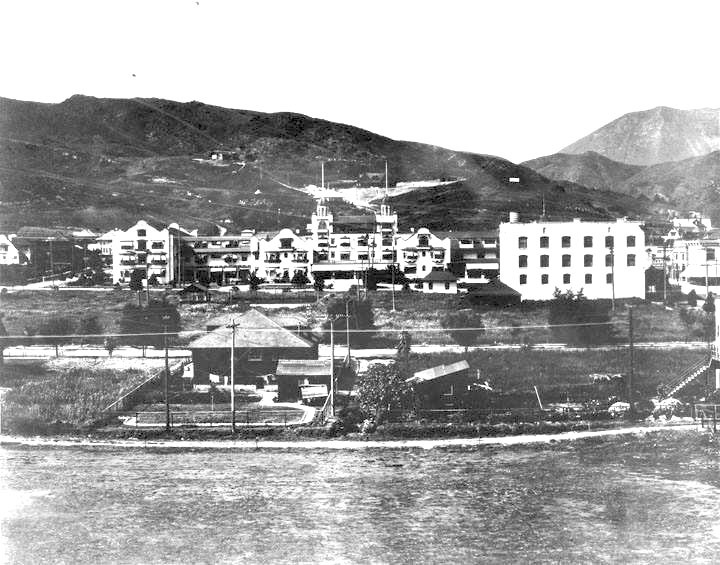 1902)^^ – View of Hollywood looking north from the future location of Hollywood High School, showing the Bonny Brae and Ocean View tracts. 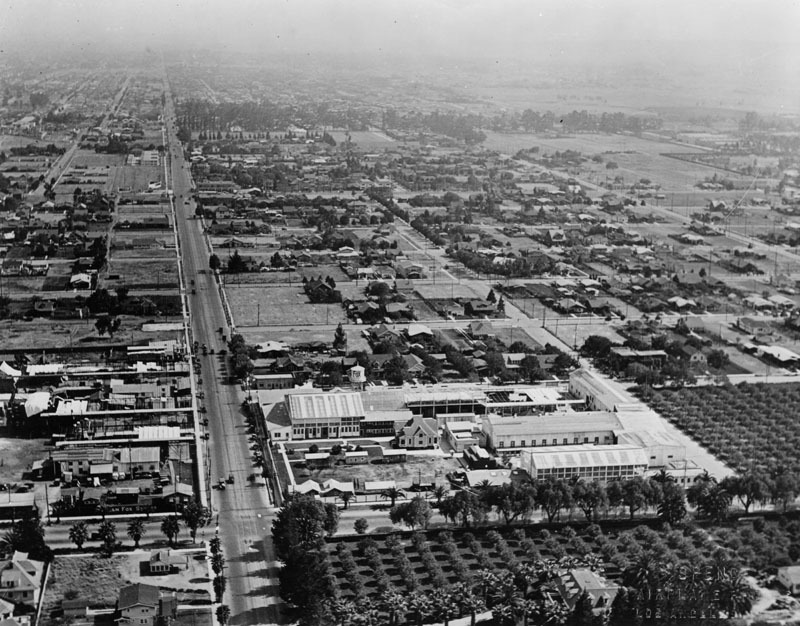 Prospect Avenue (later Hollywood Boulevard) runs horizontal across the center of photo with several buildings visible behind it. To the right is the Hollywood Hotel, shortly after it was constructed located on the N/W corner of Prospect and Highland (out of view). 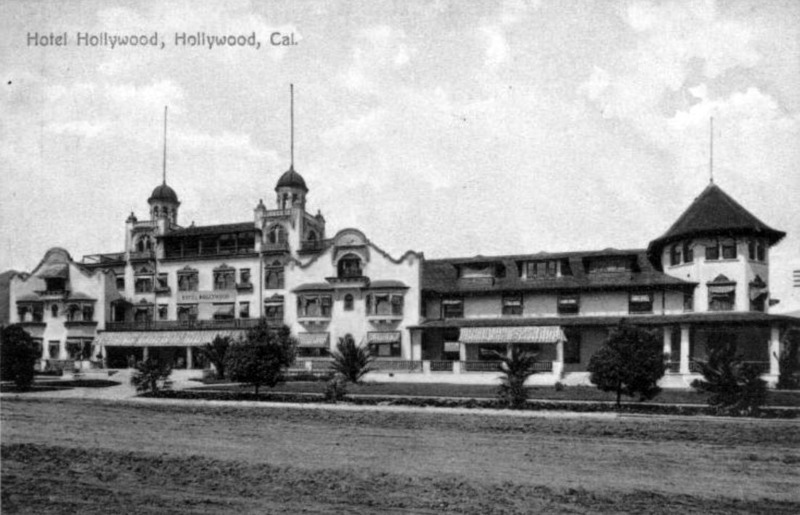 At center, Orchid Avenue runs north to the mountains away from Prospect Ave.
(1905)*^ - A closer view of the Hollywood Hotel. Guests can be seen standing on the front porch while horse-drawn wagons are parked in front of the hotel and along the curb of an unpaved Highland Avenue. (ca. 1904)^** – View of Eliza A. Otis, wife of Harrison Gray Otis, in horse-drawn carriage on dirt road with group of people; two ladies partially visible next to Eliza, three men in the rear of carriage and two men in front. The building to the left is the Hotel Hollywood located on the corner of Hollywood Boulevard and Highland Avenue. (1905)* - View of Hollywood Boulevard looking east from a point west of Highland Avenue. The large area on the right is a strawberry patch. A streetcar can be seen in the center of the photo in front of the Hollywood Hotel near the intersection of Hollyood and Highland. 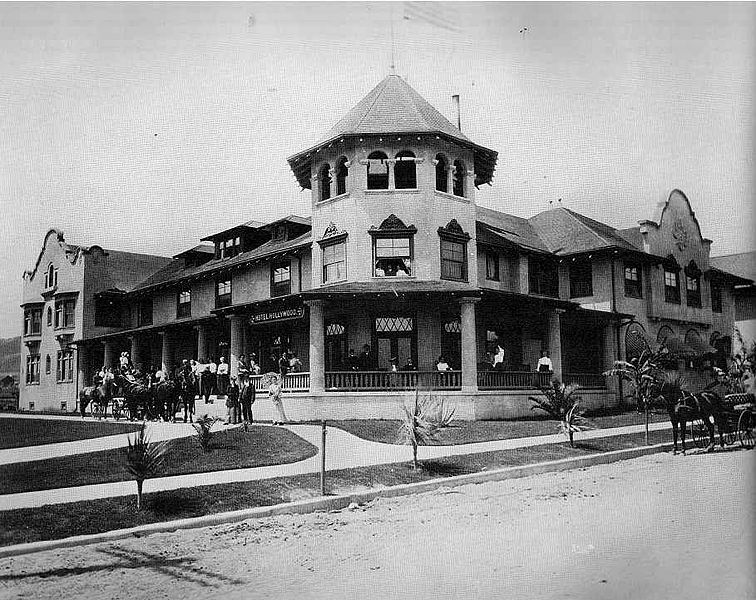 (1905)* - View of the Hollywood Hotel in 1905 just after it was enlarged to cover the entire block. The original building can be seen on the right. (ca. 1905)*^*^– Postcard view of the Hollywood Hotel soon after its new addition. Prospect Avenue (later Hollywood Boulevard) is still unpaved. (ca. 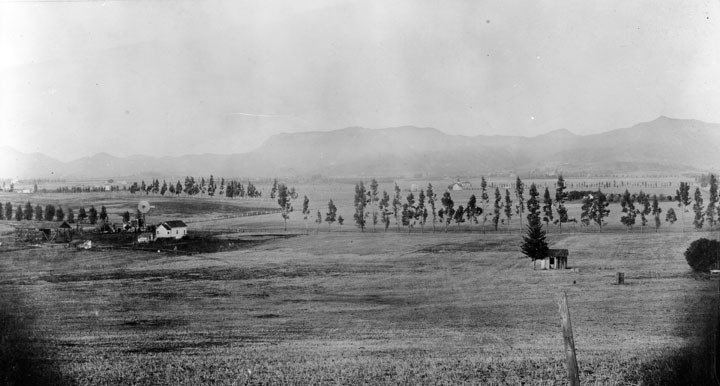 1907)#** - View looking north from the field behind Hollywod High School. The Hollywood Hotel is seen on the north side of Prospect Avenue (Hollywood Boulevard). In the far background are the Hollywood Hills. (ca. 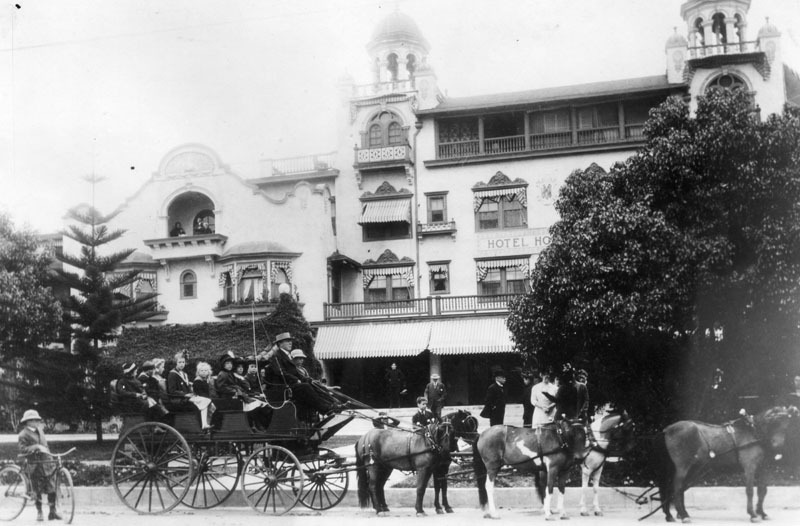 1910)* - Carriage drawn by six horses in front of the Hollywood Hotel. Thie is the year Prospect Avenue would become Hollywood Boulevard. (ca. 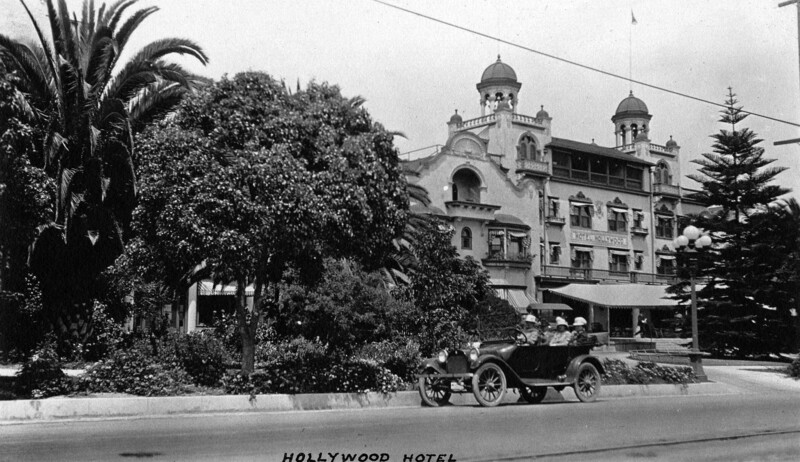 1915)^*# - View looking northeast showing a car full of people parked by the curb in front of the Hollywood Hotel. (ca. 1915)##^* - View showing a streetcar heading south on Highland Avenue in front of the Hollywood Hotel. In the background high on a hill sits the impressive Japanese Palace of brothers Charles and Adolph Bernheimer. (ca. 1920s)* - Corner view of the famous Hollywood Hotel, located on the north side of Hollywood Blvd, between Highland and Orchid Avenues. 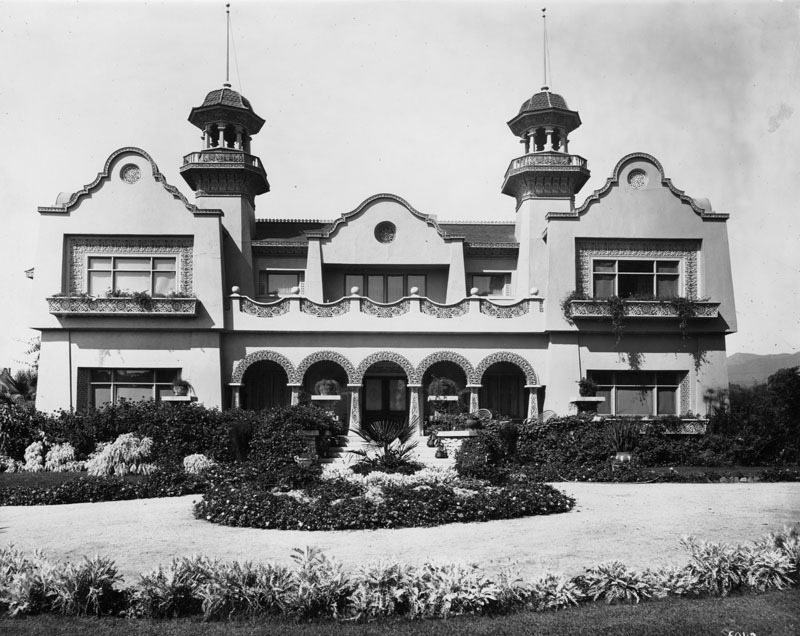 It shows a white, 2-story Spanish style structure with numerous windows throughout, a wrap-around porch, neatly manicured lawns, and several tall palms. A cupola can be seen peeking up from behind the arched façade on the left of the building. (ca. 1920)*^^ - View of the Hollywood Hotel circa 1920. Note how the trees have grown compared to previous photos. (ca. 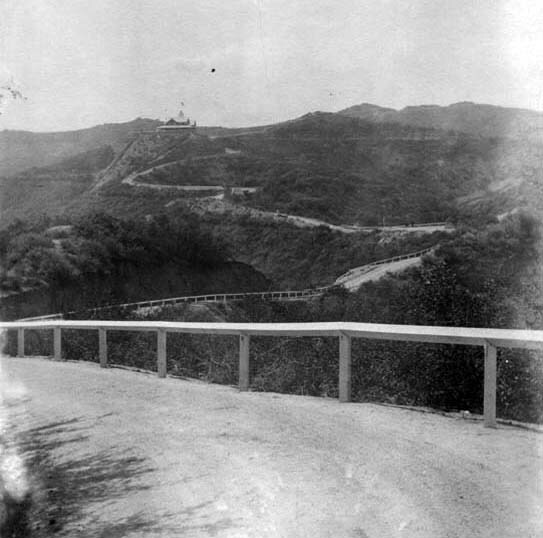 1903)* - Vine Street headed north into the hills from Hollywood Boulevard. George Hoover’s home is on the far left and the Bartlett residence is at the right. The empty field in right foreground is now where the Equitable Building and Pantages Theatre stand. 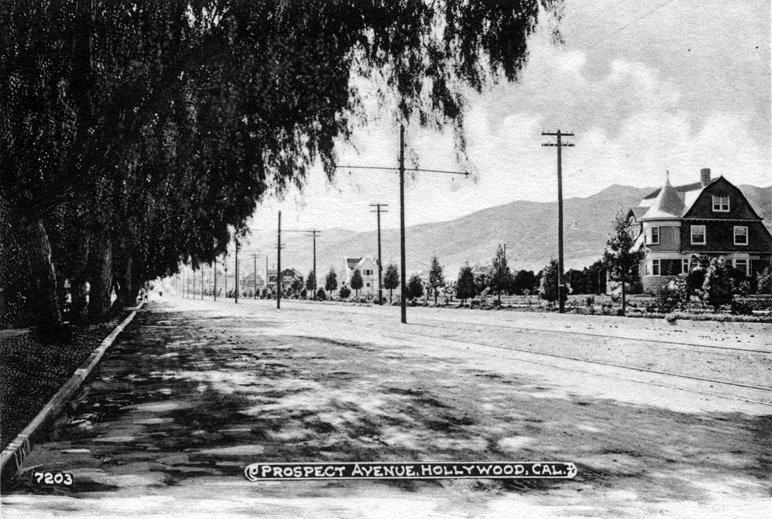 Prospect Avenue was the original name for Hollywood Blvd., and Weyse Avenue was the original name for Vine Street. (ca. 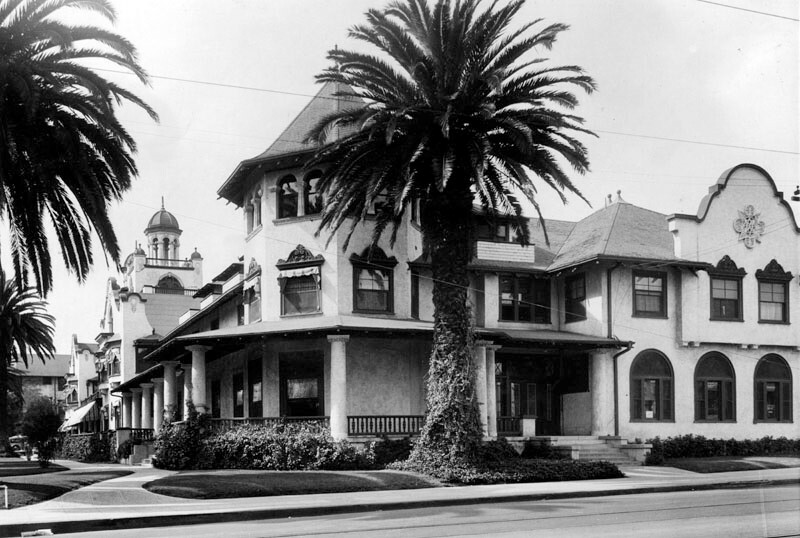 1905)* - Photograph of the residence of A.G. Bartlett on Hollywood Boulevard between Vine Street and Gower Street. A plowed field is separated from crop rows by a picket fence, behind which a mansion, next to which a windmill stands, is visible on a hill, overlooking the crops. To its left, steps with railing lead down the hill to a smaller house, possibly a barn. Beyond this property, divided by yet another fence, more houses can be seen in the distance in front of the mountains. (ca. 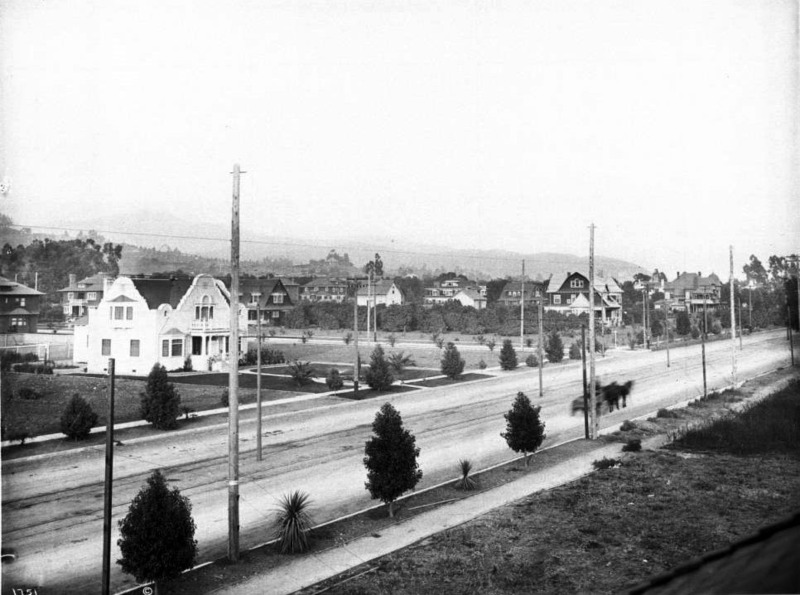 1904)*^^ – View looking west on Prospect Avenue (later Hollywood Boulevard) from near Wilcox Avenue. Note the streetcar tracks running down the center of the street. (1904)##^* – Postcard view looking northeast showing Prospect Blvd (later Hollywood Blvd) & Whitley. The Jane House, 6541 Prospect Blvd, can be seen in the center-right portion of the card. Whitley dead ends at a T-intersection at Prospect on the west side of the house. The Hurd Residence is also visible on the far right at Wilcox. Schrader Blvd (formerly Dae Ave) begins south of Prospect, and is out of frame, just east of Whitley. This photo was taken just east of Cherokee. (ca. 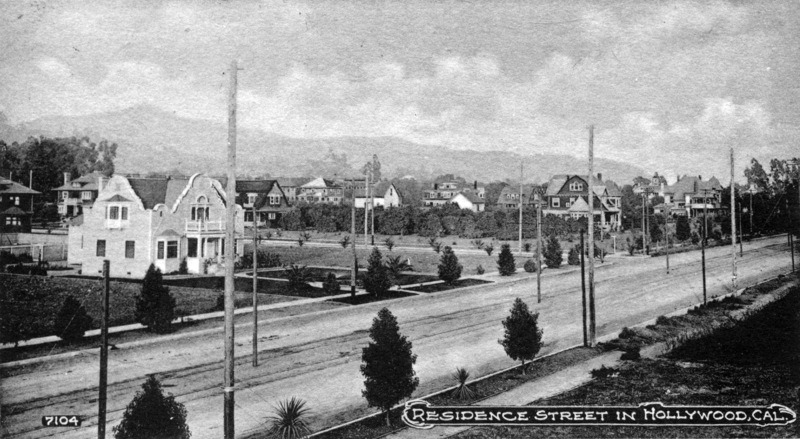 1905)^^ - View showing the northwest corner of Prospect (later Hollywood Blvd.) and Wilcox. In the foreground is a well-tended garden consisting of small pine trees, yucca trees, and patches of lawn. In the background at left, is the large Victorian mansion of banker H.J. Whitley (previously the Hurd Residence). The two-story home consists of a covered balcony and cylindrical section with a rounded rooftop. (ca. 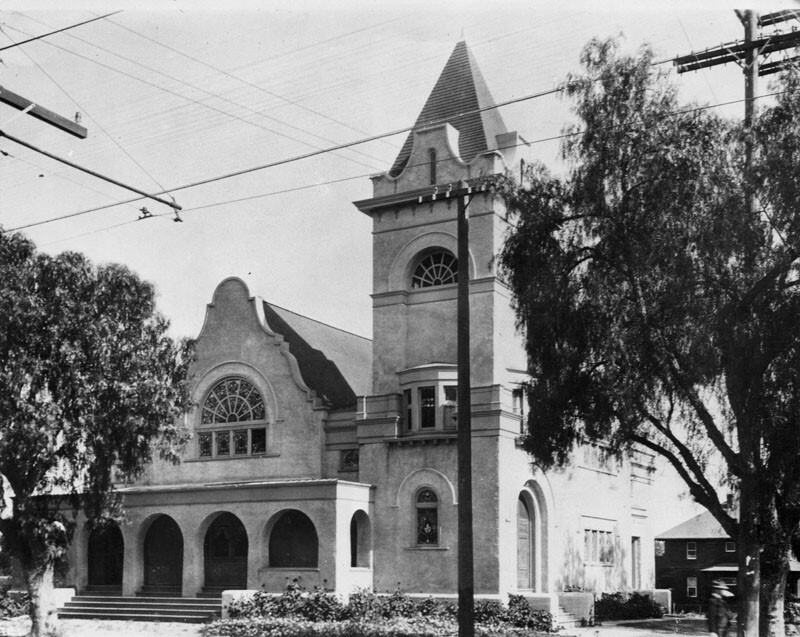 1905)* - View showing the first Hollywood Methodist Episcopal Church (Hollywood Memorial Church), located at the southeast corner of Hollywood and Vine (Prospect and Weyse avenues at the time). The Mission Revival style German Methodist Church was demolished in 1923 to make way for a new high-rise building, the 12-story Taft Building. (ca. 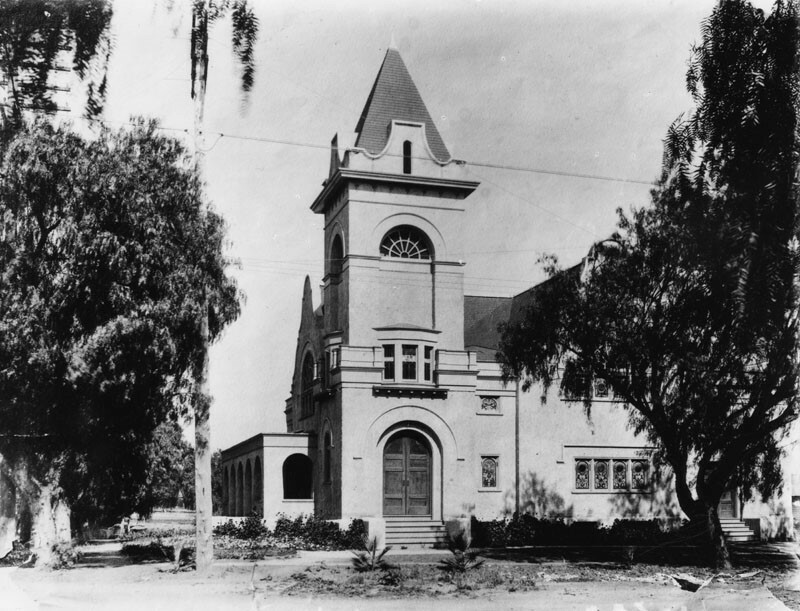 1905)* - View looking east showing the German Methodist Church (1st Methodist Church in Hollywood), located on the southeast corner of Hollywood and Vine. 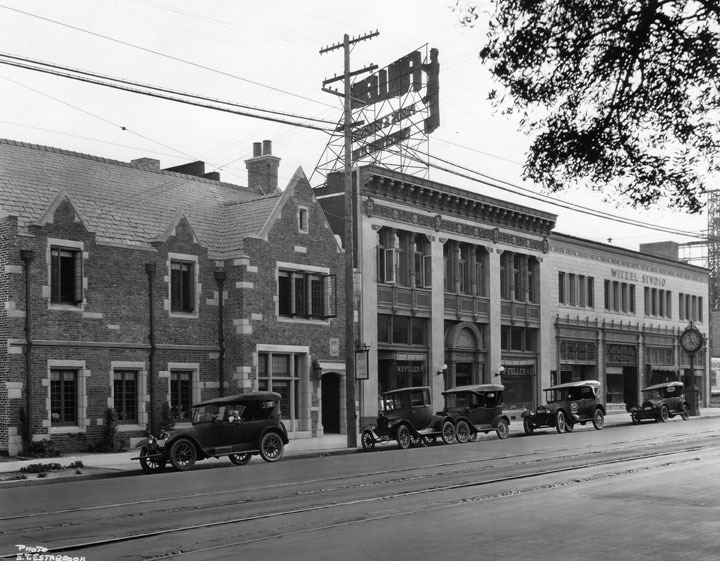 Today the Taft Building stands at this location. 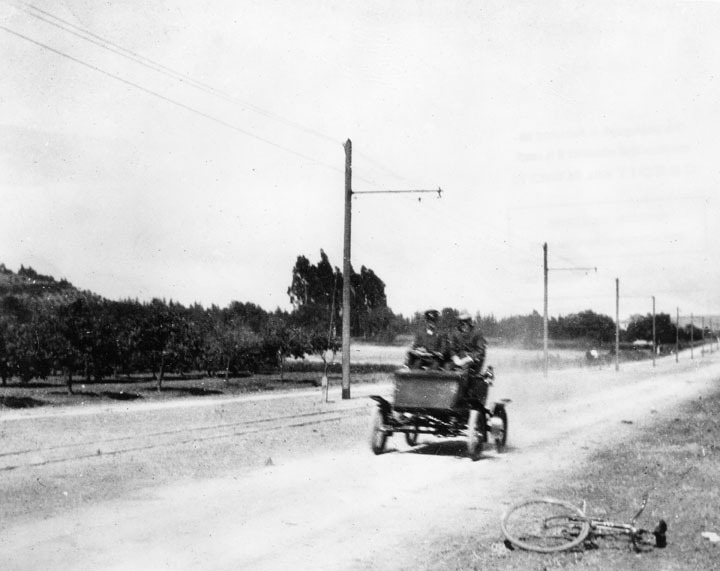 (1904)* - Two passengers in an antique car are diving on an unpaved Hollywood Blvd. near Sunset Blvd. alongside street car tracks. 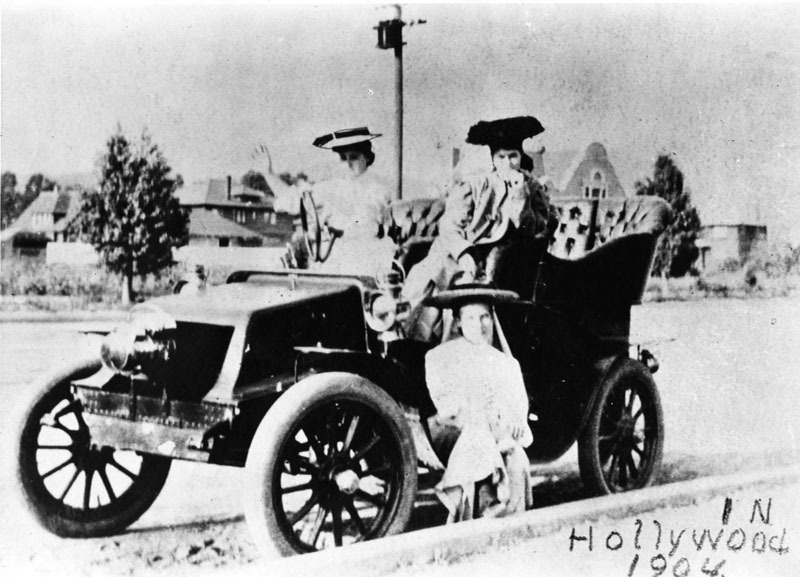 (1904)* - Photograph taken of three ladies in a 1904 Oldsmobile at a loction west of Sunset Boulevard and Vine Street, Hollywood. 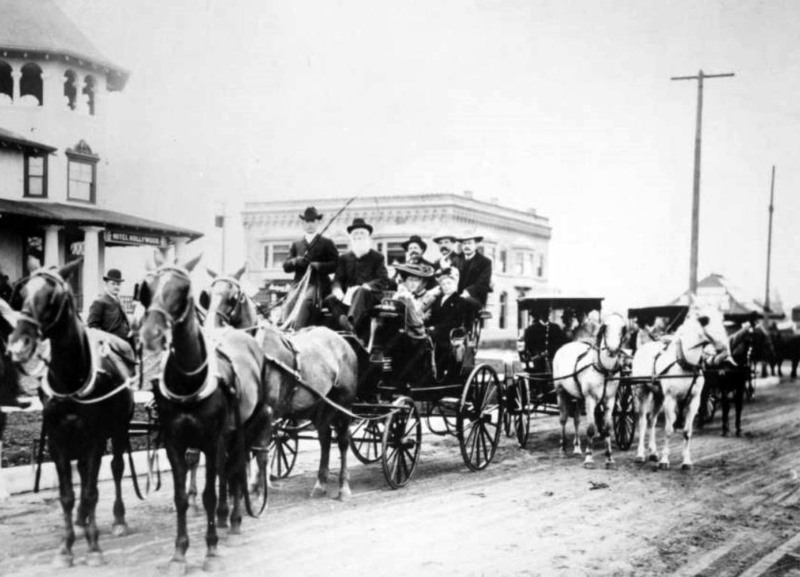 (1904)* - View of a horse-drawn carriage crossing a bridge on Franklin Avenue near Bronson Street, Hollywood. 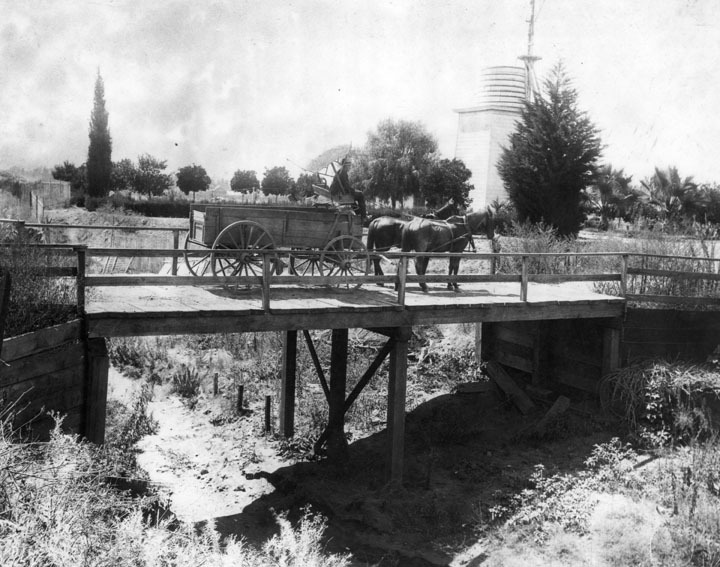 A man sits at the helm of a large plank wagon with spoked wheels pulled across a wooden bridge by two horses. The riverbed underneath him is dry and overgrown with weeds. (ca. 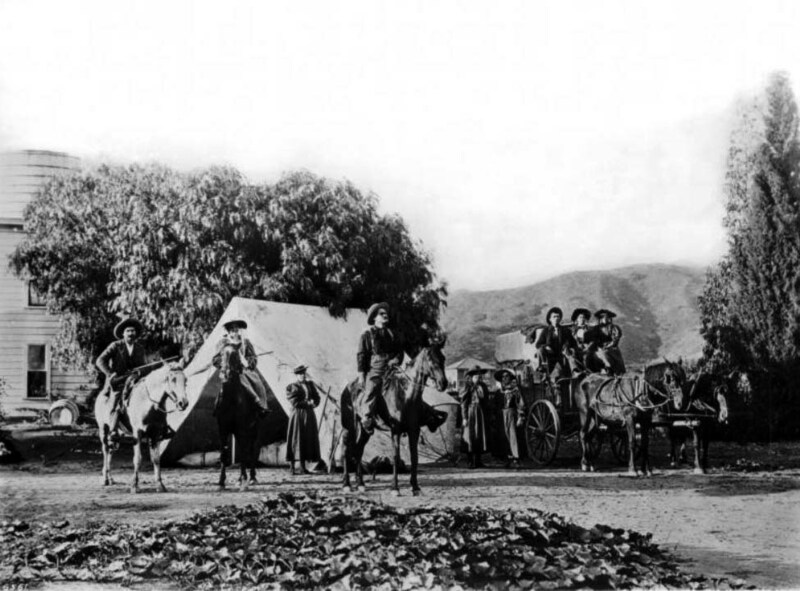 1905)^^ - Photograph of a group of campers on Franklin Avenue near Bronson Street in Hollywood. Nine campers, both male and female, stand outside the front of a house, a tent behind them. At left, a man and a woman both on horses, hold rifles across their laps. Next to them, a woman in a hat stands, in front of which a second man on a horse is centered, looking off into the distance. Two more women stand to the right of him, next to which three campers, two women and a man in a suit, are seated in a wagon drawn by two horses. (ca. 1905)* - Built by Don Urquidez in 1853 on an Indian burial ground, this adobe is located on the northwest corner of what is now Franklin and Sycamore. It is considered to be the first house built in Hollywood. (ca. 1905)^^ - Closer view of the Don Tómas Urquidez adobe, the first house in Hollywood. (ca. 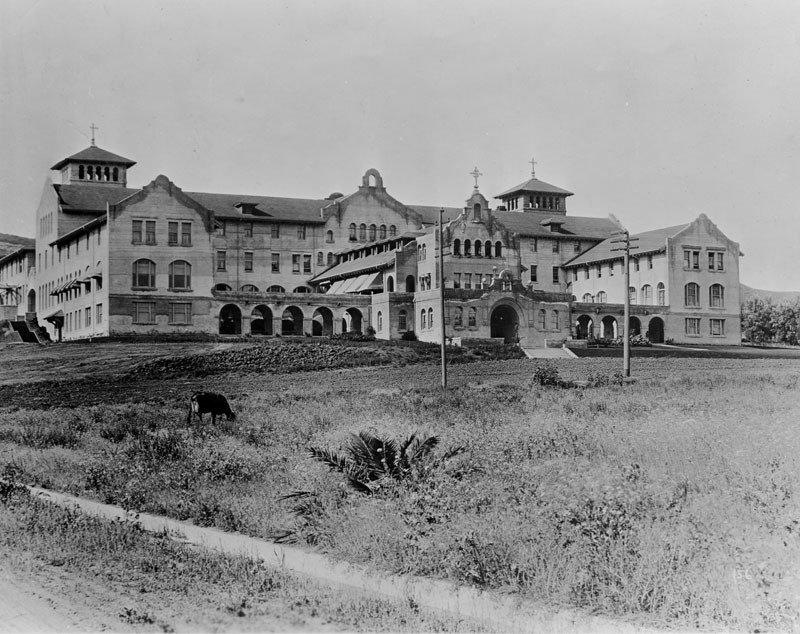 1905)* - Exterior view of the original Moorish/Mission Revival style building on the campus of Immaculate Heart College, located at 5515 Franklin Avenue in Hollywood. A cow can be seen grazing in the field in the foreground. (1905)^^ - View of the Immaculate Heart College, a Catholic girls school on Franklin Avenue at the head of Western Avenue, showing newly planted trees and lawn. 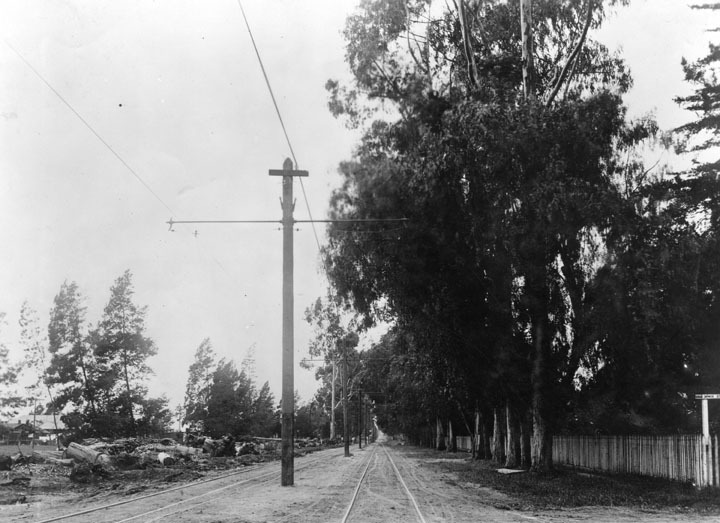 The dirt road in the foreground is lined with streetcar rails. (ca. 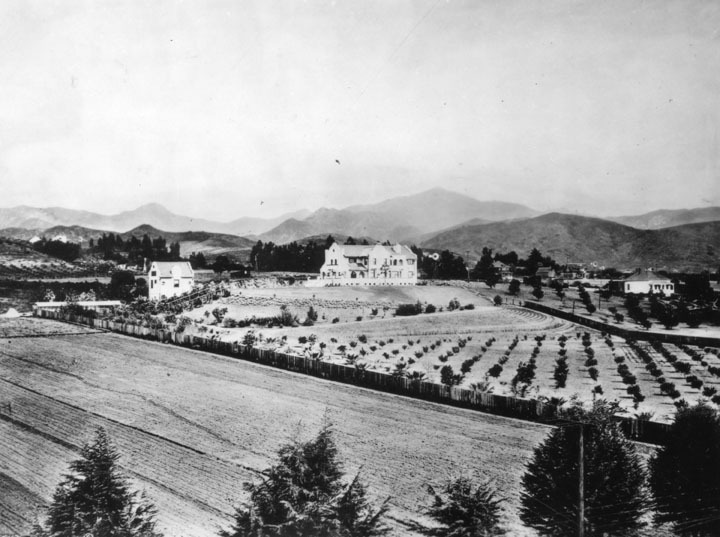 1907)* - View of the original campus of Immaculate Heart College, located at 5515 Franklin Avenue in Hollywood, as it appears in the early years of Hollywood when there were few homes (foreground) and large open spaces for agriculture, seen throughout this image. (ca. 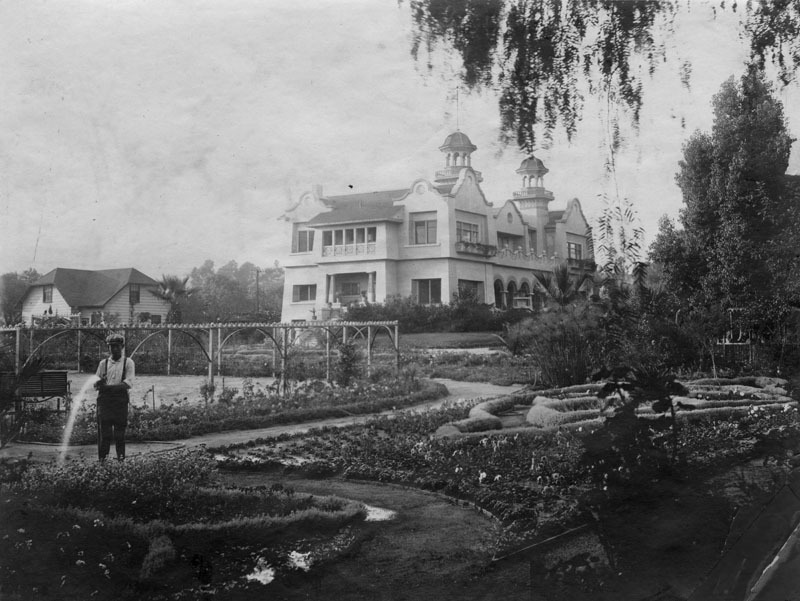 1905)* - Postcard view of the Tudor Revival Hollywood home and gardens of merchandiser Arthur Letts, located at 4931 Franklin Avenue, Hollywood. The residence was also known as the Holmby Mansion, the name loosely derived from Letts' hometown of Holdenby, England. Arthur Letts, Sr. was born in England. In 1882 he emigrated to Toronto, Canada, and found employment in a large dry goods store. When the Red River Rebellion broke out in the Northwest of Canada, he volunteered. He was awarded a silver medal and clasp for distinguished service, and a grant of land by the Canadian government. 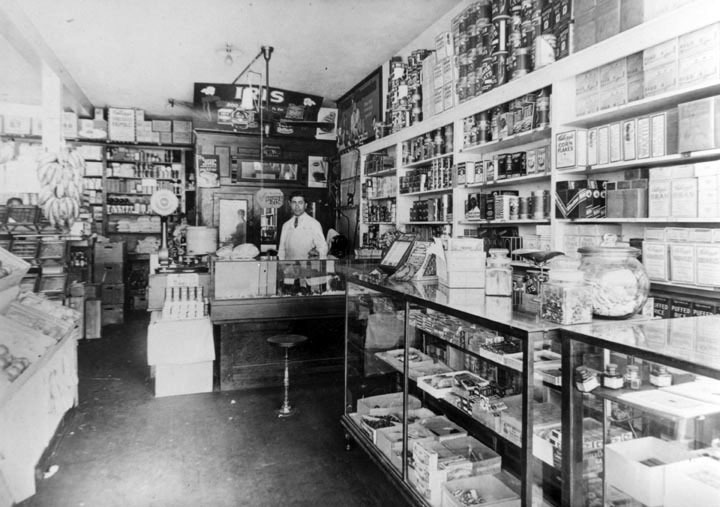 In the early 1890s he emigrated to the United States in Seattle, Washington and began retail employment in dry goods. Having little success, he then headed for L.A. in 1895. (ca. 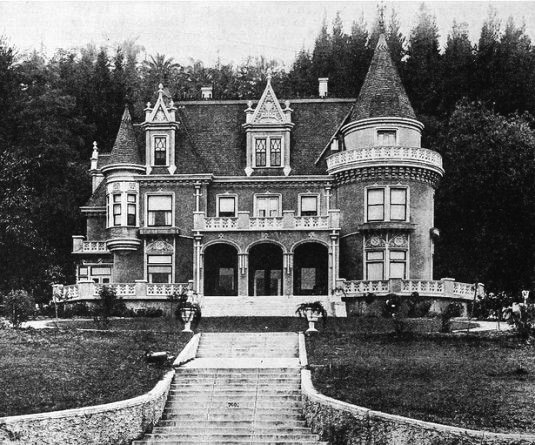 1905)^^ – View showing the three-story Letts residence. The house is situated on a hill and features dormer windows, cant windows, stone masonry walls, a covered porch, several chimneys and window awnings. An immaculate courtyard adorned with well-manicured lawns and gardens precedes the house. 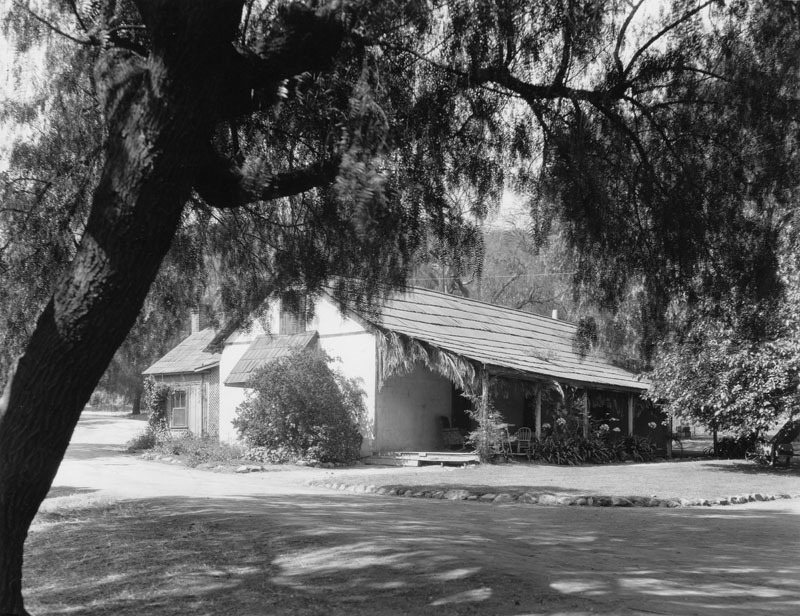 Click HERE to see more in early views of UCLA and Westwood. (ca. 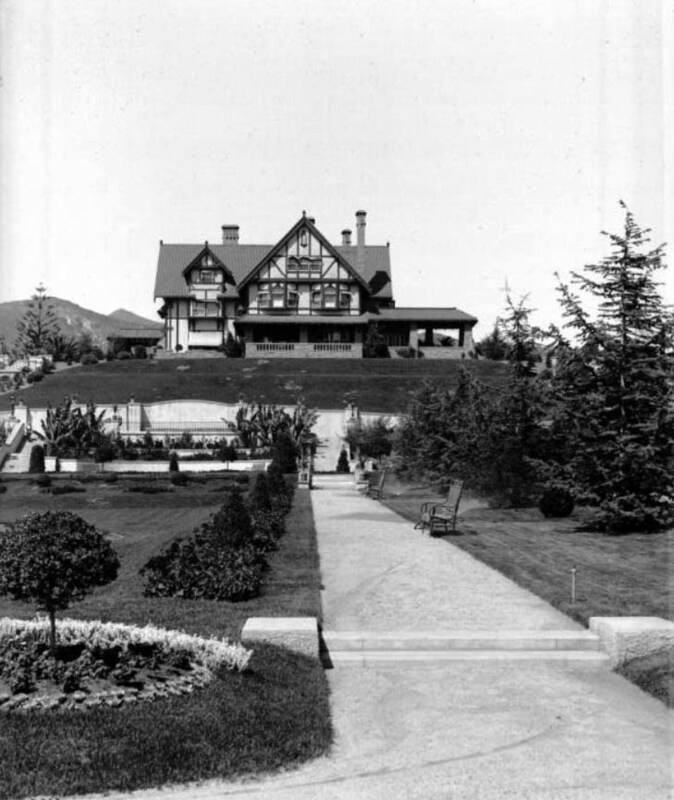 1905)* - Exterior view of the Tudor Revival Hollywood home and gardens of the Broadway Department Store founder Arthur Letts. 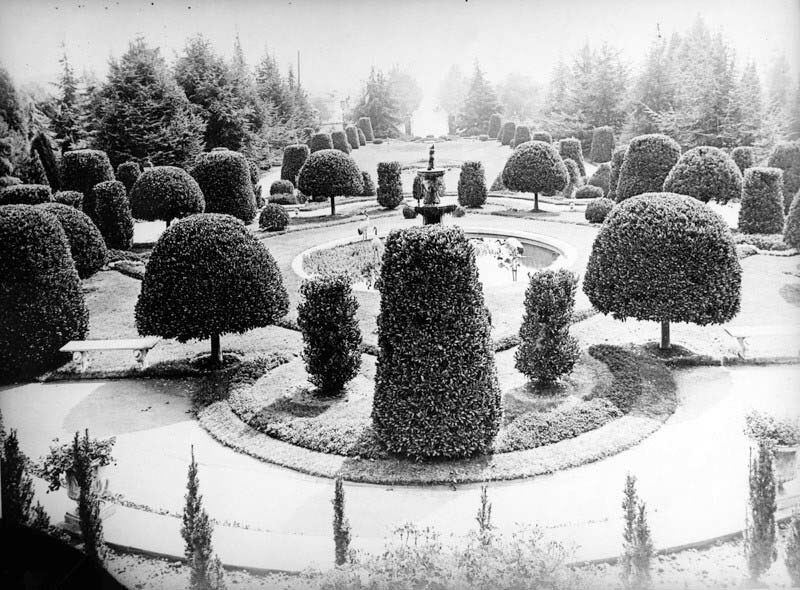 (Early 1900s)* - A fountain in the garden of Arthur Letts' home, located at 4931 Franklin Avenue, Hollywood, in which crane statues are seen. The shrubs and trees are carefully manicured and set in a balanced design. 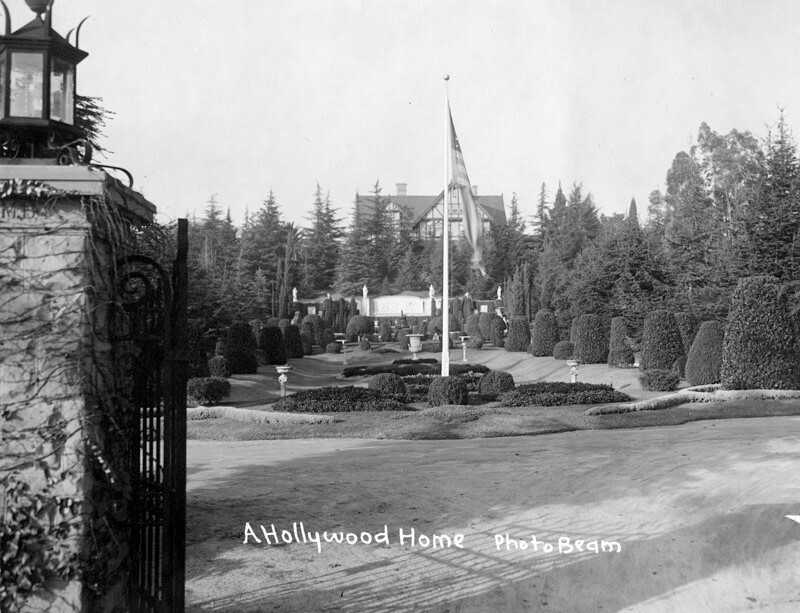 (Early 1900s)* - View through the front entrance gates of the Tudor Revival Hollywood home and gardens of merchandiser and philanthropist Arthur Letts, located at 4931 Franklin Avenue. He was the founder of the Broadway Department Store and other ventures and later developed the westside residential community of Holmby Hills. (1905)^*^# - View of Prospect Avenue near Cahuenga in 1905. 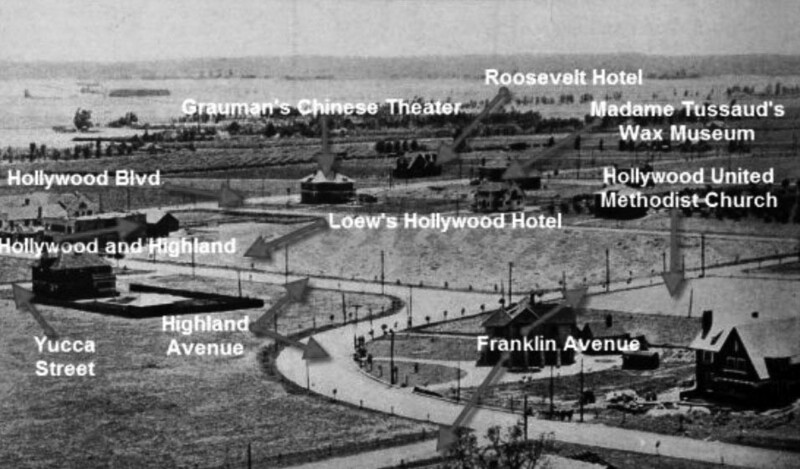 In 1910, Prospect Avenue became Hollywood Boulevard. 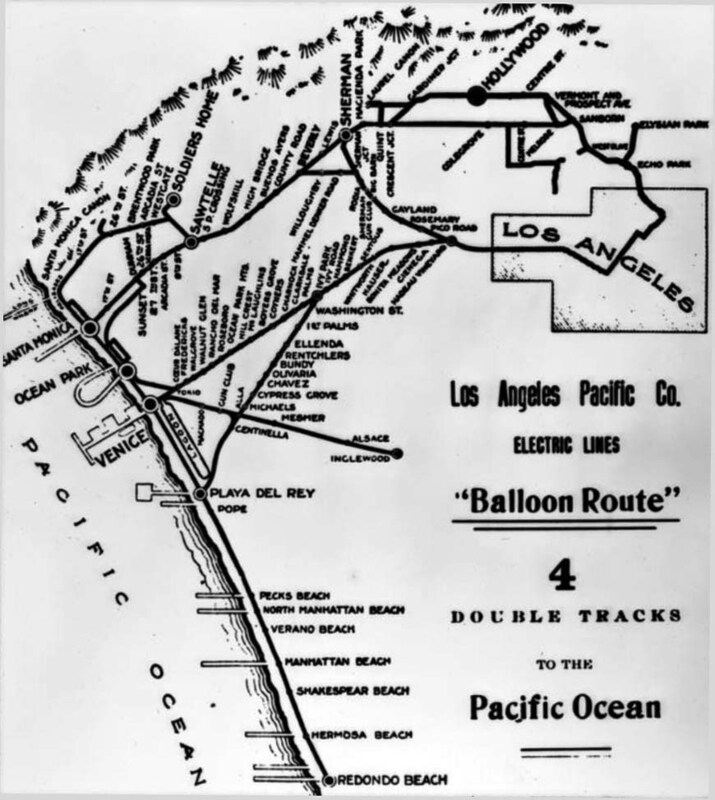 (1910)^^ - Map of the Los Angeles Pacific Company Electric lines around Los Angeles, including the "Balloon Route" which would bring flocks of tourists to Hollywood. (ca. 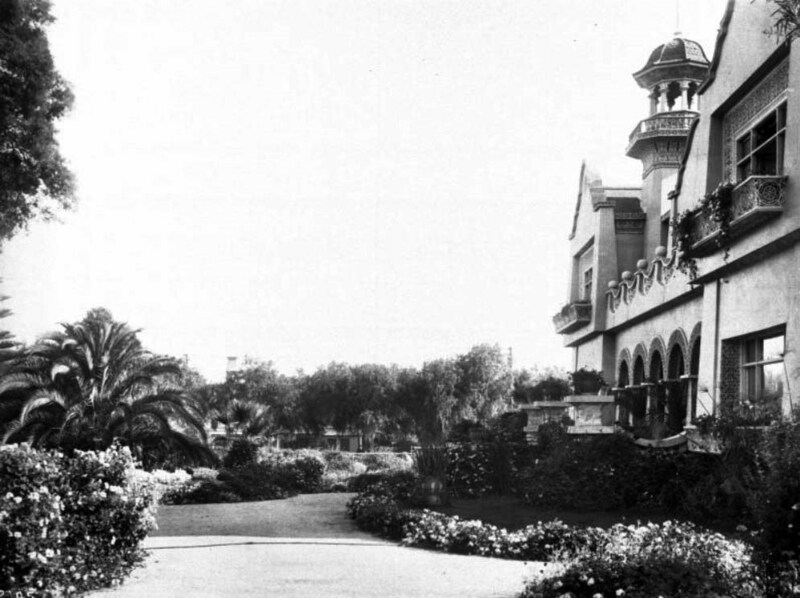 1905)* - Exterior view of the Mission Revival/Islamic style Hollywood residence once owned by artist Paul de Longpré. The home was located on the west side of Cahuenga Blvd. at Hollywood Blvd and became a big tourist attraction. (ca. 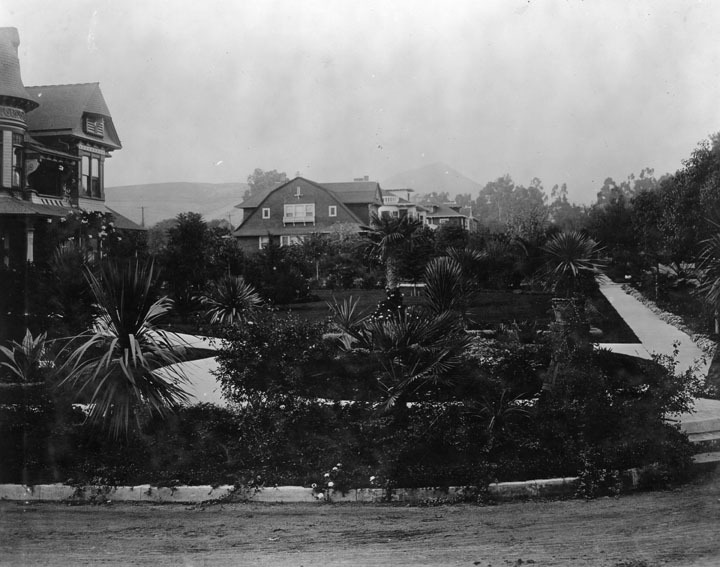 1905)^^ - View of Paul de Longpre’s residence and garden, Hollywood Boulevard and Cahuenga Avenue. The front of the two-story house, visible at right, includes a several balconies, an open tower, and a series of arches at the main entry. The well-cared-for garden and lawn abuts a paved area in the foreground. (n.d.)* - Frontal view of the Mission Revival/Islamic style Hollywood residence and gardens owned by artist Paul de Longpré. (ca. 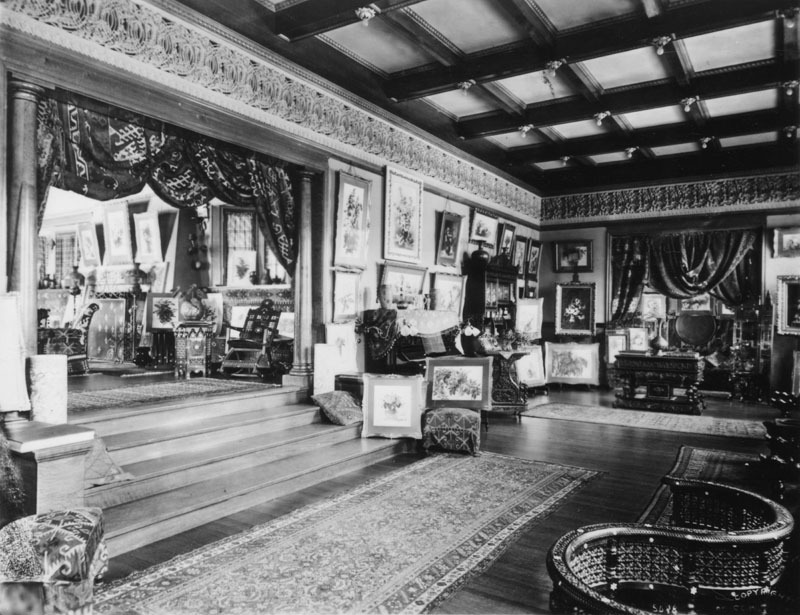 1905)* - Interior of the Mission Revival/Islamic style Hollywood residence and art gallery once owned by artist Paul de Longpré. Several of the artist's rose paintings are on display throughout the room shown here. The flowers depicted in the paintings came from his famed garden, which at one time consisted of approximately 4,000 roses. 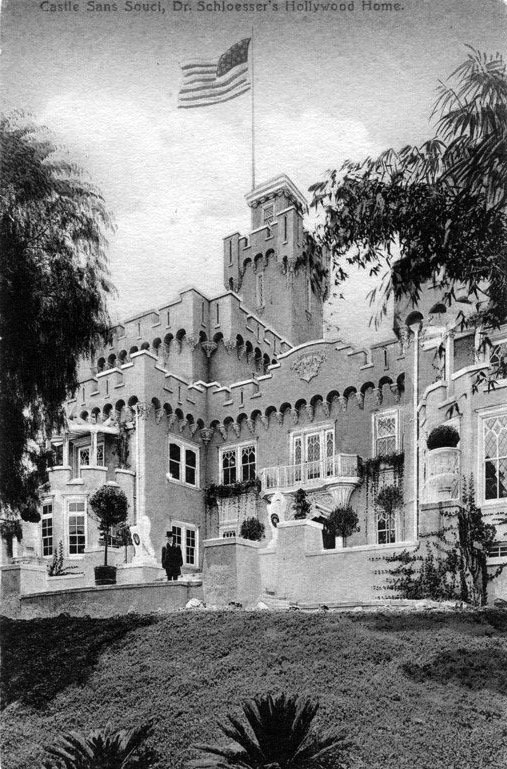 (1907)* - Exterior view of the Hollywood residence and gardens owned by artist Paul de Longpré. The home was located on the west side of Cahuenga Blvd. at Hollywood Blvd. 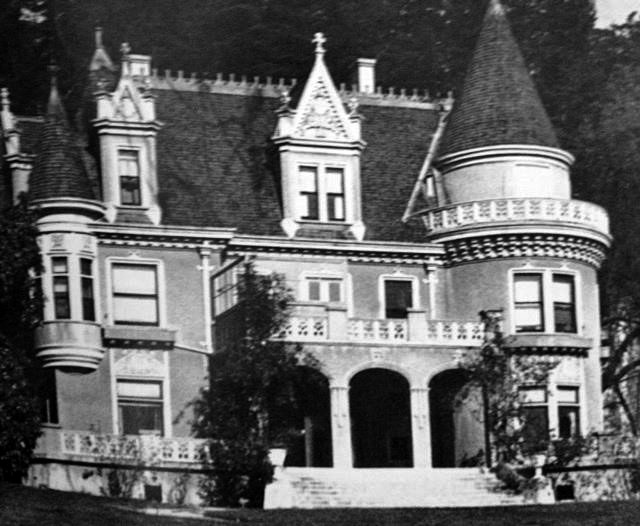 on property he obtained from Mrs. Wilcox Beveridge after he moved to Los Angeles in 1889. The French born artist desired the 65-foot-deep lots for a large flower garden. 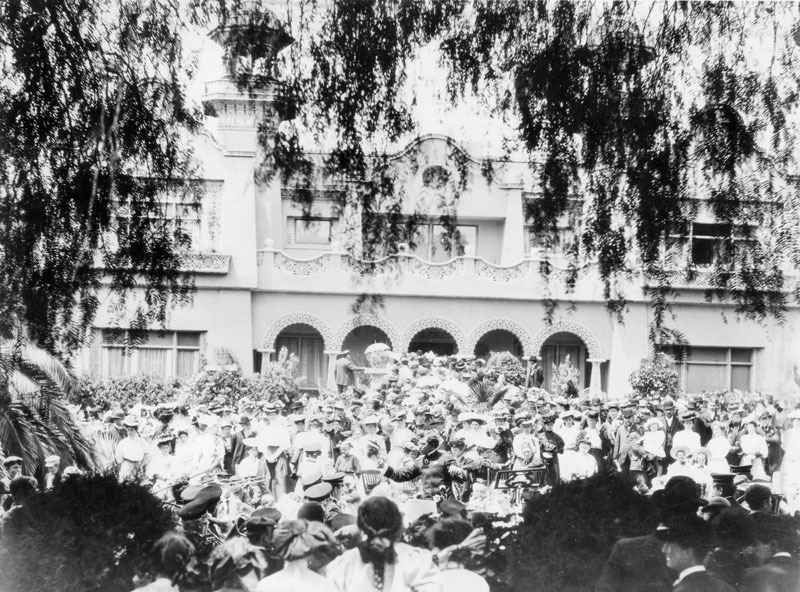 (1909)* - A conductor leads a musical ensemble playing to a large crowd of visitors outside the Mission Revival/Moorish style Hollywood residence of artist Paul de Longpré. This well attended event celebrated the completion of the Hill Street tunnel in downtown. Click HERE to see more Early Views of the Paul de Longpré Residence. 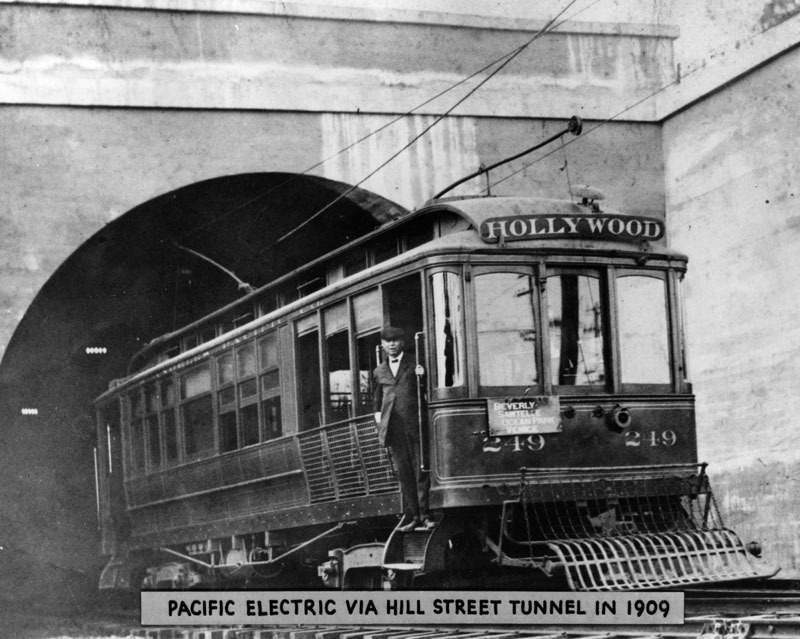 (1909)* - Pacific Electric Railway Hollywood car via the Hill Street Tunnel soon after the tunnel's opening. Its sign says, "Beverly, Sawtelle, Ocean Park, Venice." Click HERE to see more on the opening of the Hill Street Tunnel. (ca. 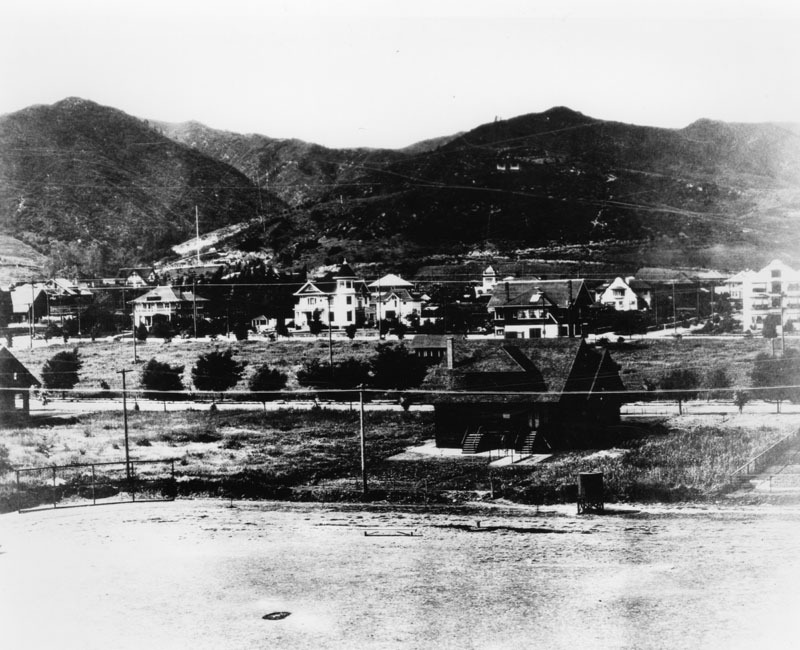 1905)* - Panoramic view of Hollywood circa the early 1900s, with scattered houses on the city blocks. 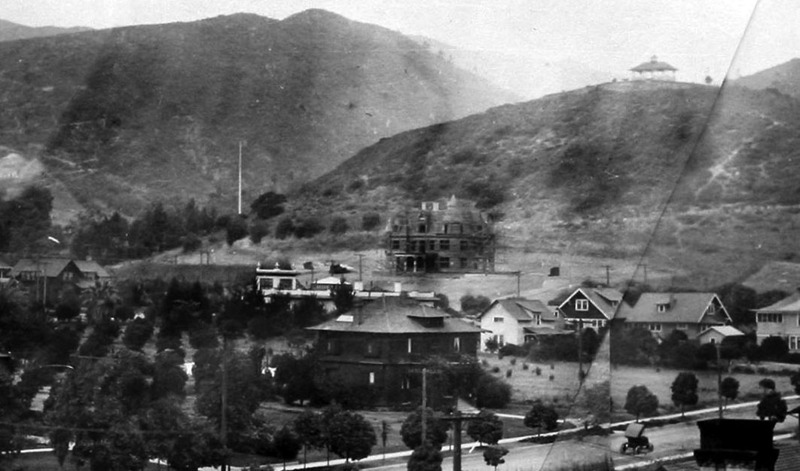 In the center of the photo with two towers is the rear of the Paul DeLongpre residence at Hollywood and Cahuenga Boulevards. Highland Avenue is in the foreground. (ca. 1905)* - Panoramic view of Hollywood, seen from Whitley Heights. A few houses are scattered about, and a winding street is seen. The curved configuration of Highland between the East and West sections of Franklin Ave still exists today. Whitley Heights is a residential neighborhood in the Hollywood district named for Hobart Johnstone "HJ" Whitley, the "Father of Hollywood". Whitley Heights was added to the National Register of Historic Places in 1982. 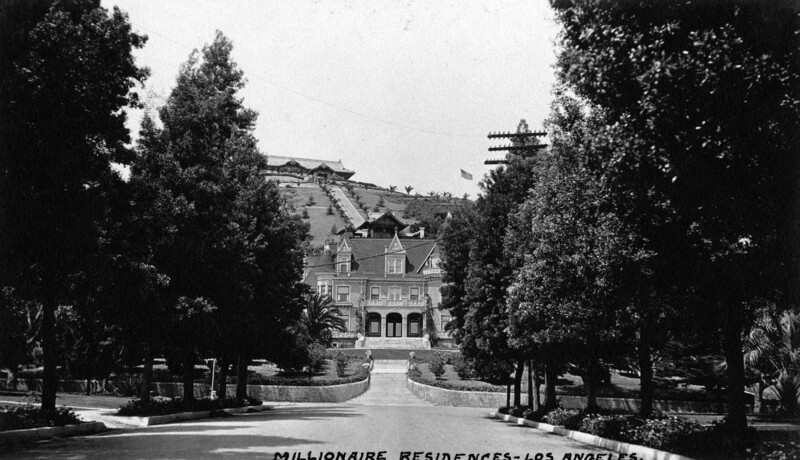 In 1918, HJ Whitley commissioned architect A.S. Barnes to design Whitley Heights as a Mediterranean-style village on the steep hillsides above Hollywood Boulevard, and it became the first celebrity community. The neighborhood is roughly bordered on the north and east by Cahuenga Boulevard, on the west by Highland Avenue, and on the south by Franklin Avenue. 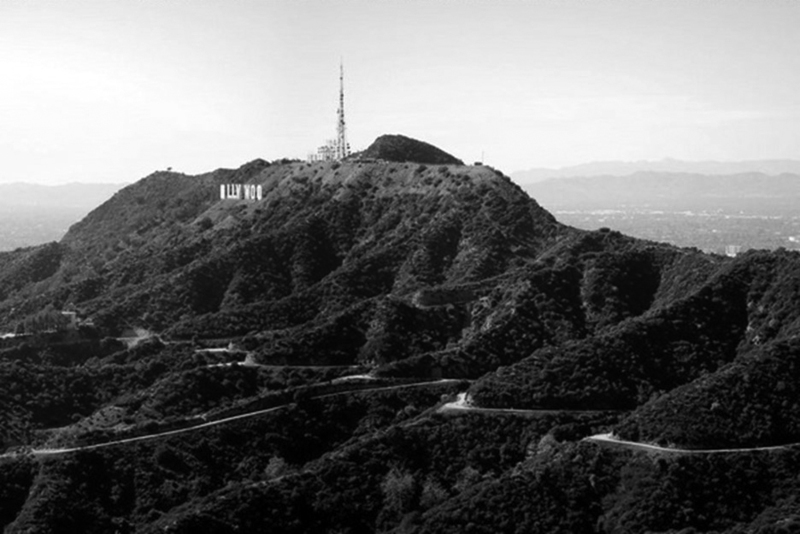 It overlooks the tourist district of Hollywood, including the Hollywood Walk of Fame and Grauman's Chinese Theatre, and the Hollywood Bowl amphitheater. The neighborhood was bisected and some landmark homes destroyed when U.S. Route 101, a.k.a. the Hollywood Freeway, was built after World War II. (ca. 1905)#^** – Same image as above but annotated to show street names and significant building locations. 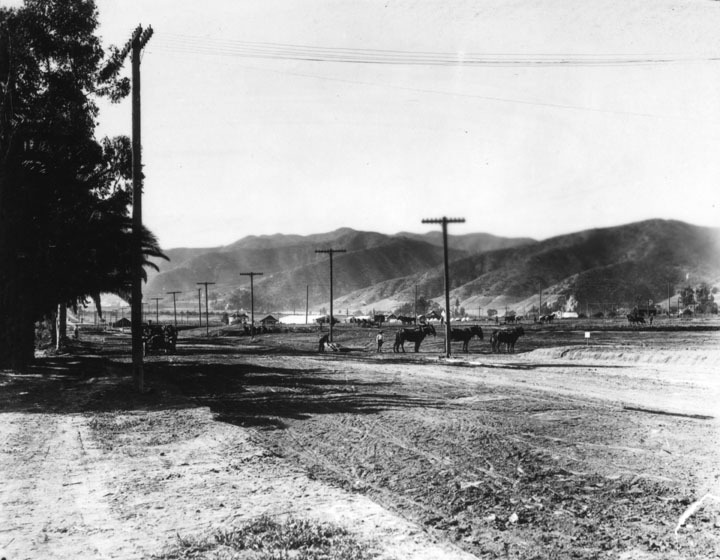 (1906)* - Early view of Highland Avenue north of Hollywood Boulevard in 1906. Some buildings are visible with hills in the background. (ca. 1900)^^^ - View of Mt. Hollywood with no houses. 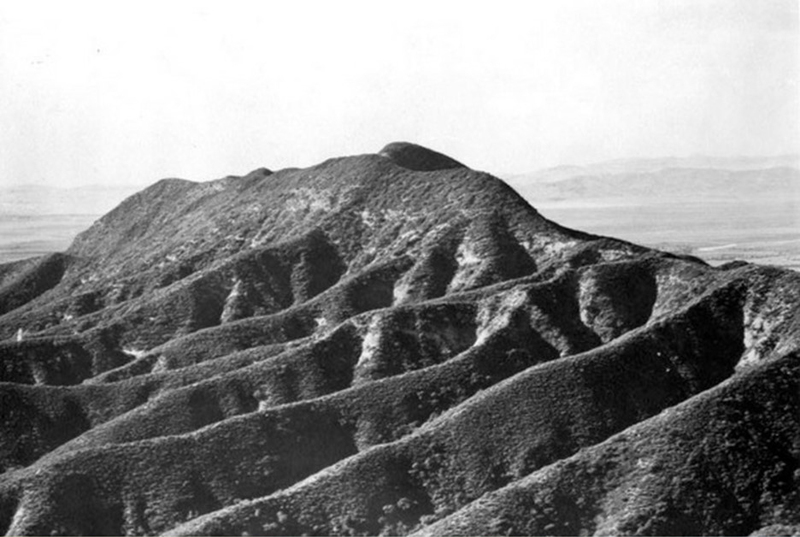 At an elevation of 1,640 feet, it is the tallest peak in Griffith Park. 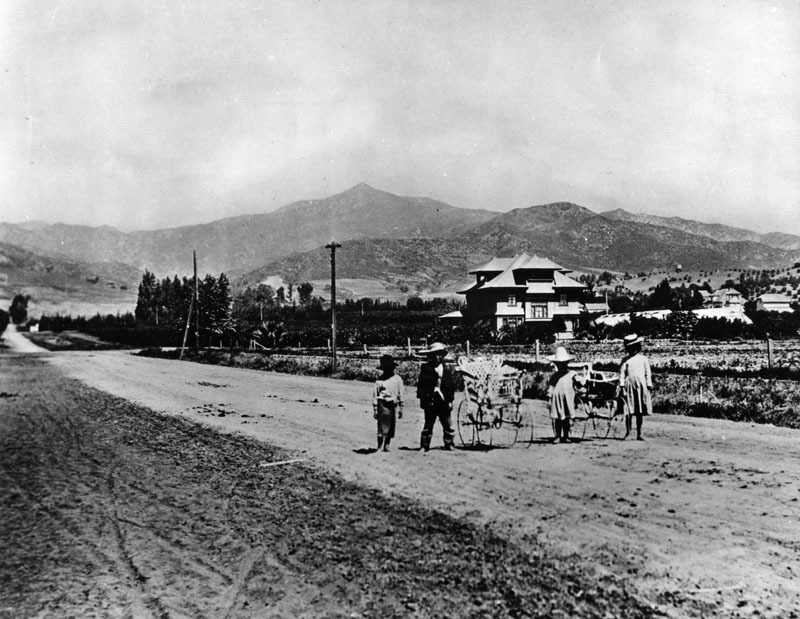 (1905)* - View of Western Avenue south of Sunset Boulevard. The ornamental house seen in the background belonged to the Hampton family. Four children, two boys and two girls, stand along the road (Western Avenue) posing for the camera with Mt. Hollywood seen in the background. Click HERE to see contemporary view. 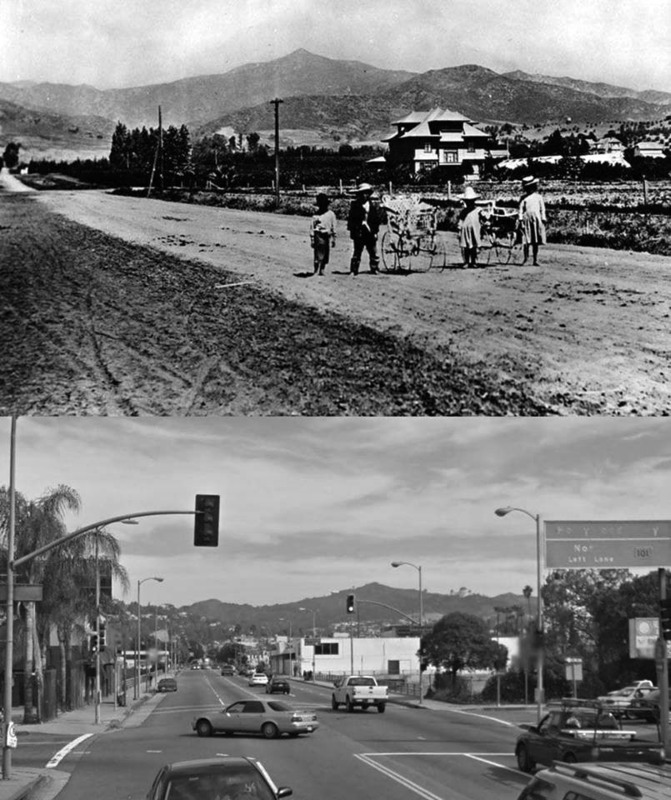 (1905)* vs. (2018)^.^ - View of Western Avenue south of Sunset Boulevard. (ca. 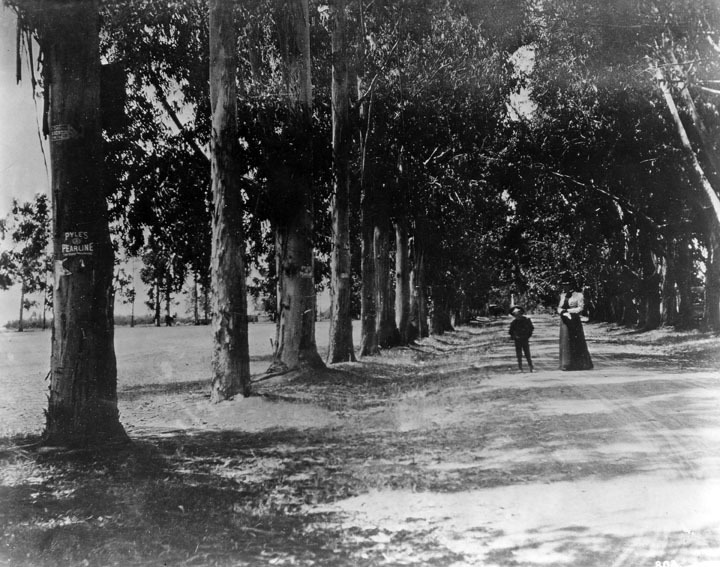 1905)* - View of an unpaved Santa Monica Boulevard, where it crosses Gower (foreground). Streetcar tracks running both east and west are visible in the center of the image. 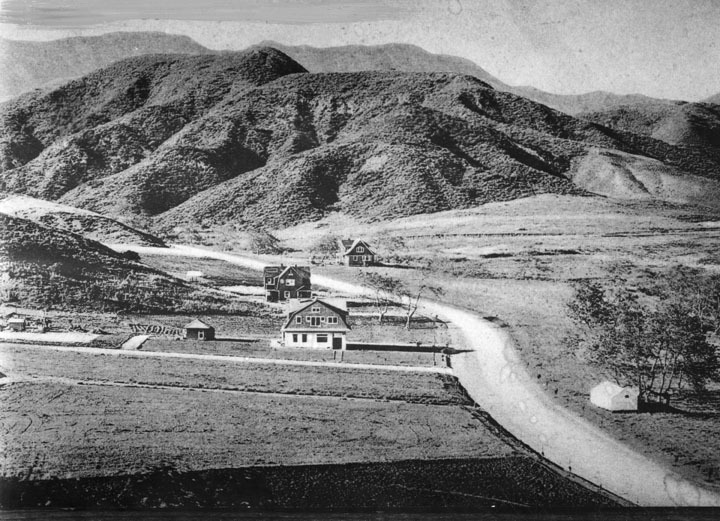 (1905)* - Early view of Sunset Boulevard as a dirt road with real estate tracts being developed alongside. A team of horses (?) is seen in the middleground and low hills are in the background. 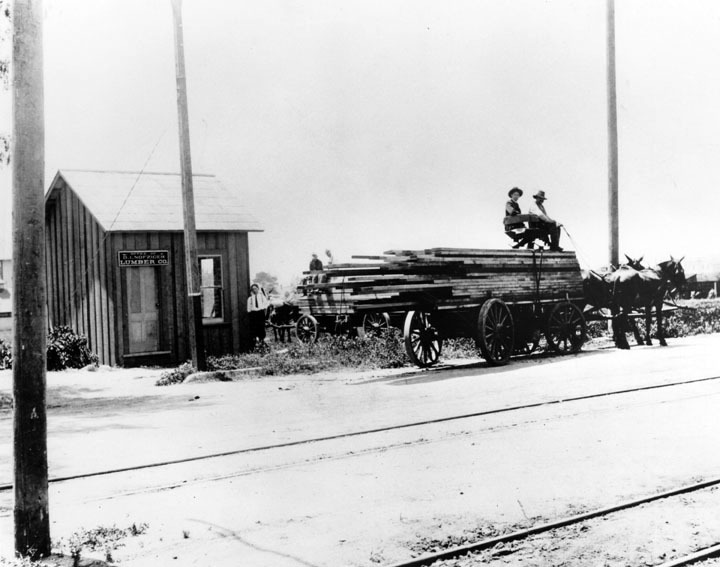 (1905)* - Two horse drawn wagons are ready to pull away from the Nofziger Lumber Co. located on the south side of Hollywood Blvd. between Hudson and Cherokee. (ca. 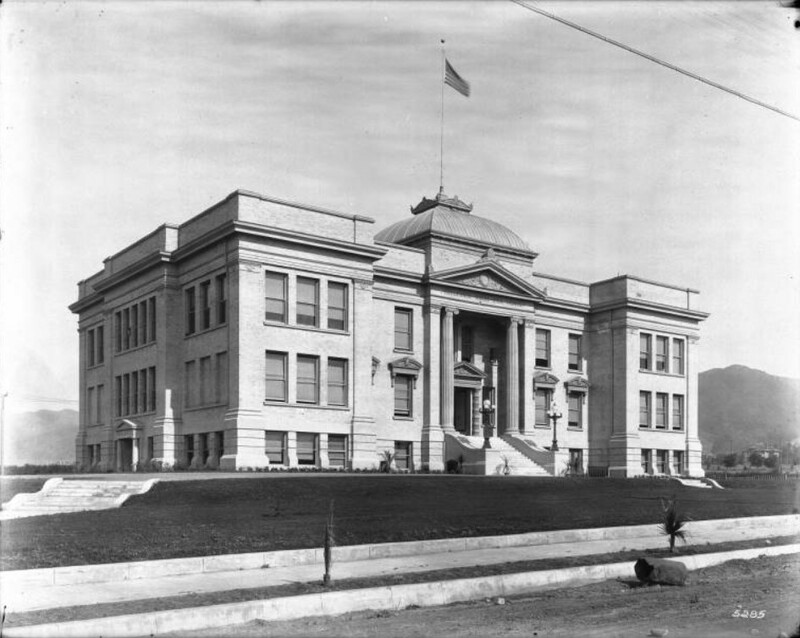 1905)* - Original building of Hollywood High School designed by Burnham and Bliesner in the "Ionic architecture" style. With two stories and a basement, it accommodated 400 students. 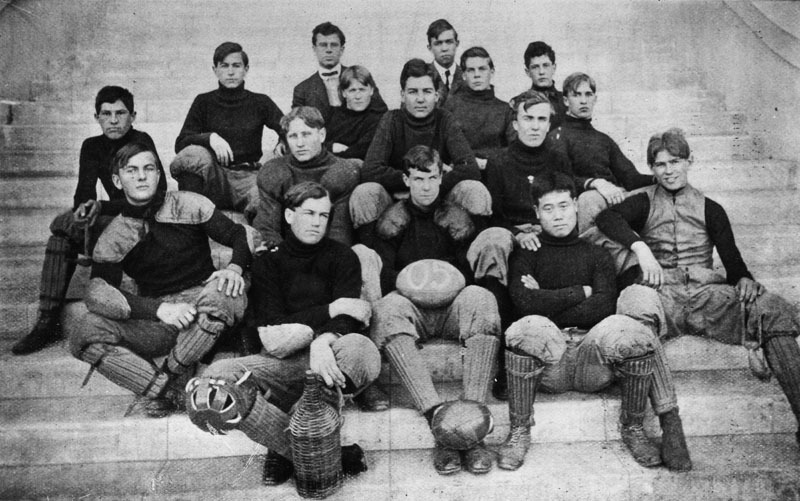 (1905)* - The 1905 Hollywood High School Football team pose in their uniforms on the steps of the high school. A player holds a football with "05" painted on it. A glass bottle in a wicker holder is on the step in front of the team. The caption reads "Mr. Nevius and football team". (ca. 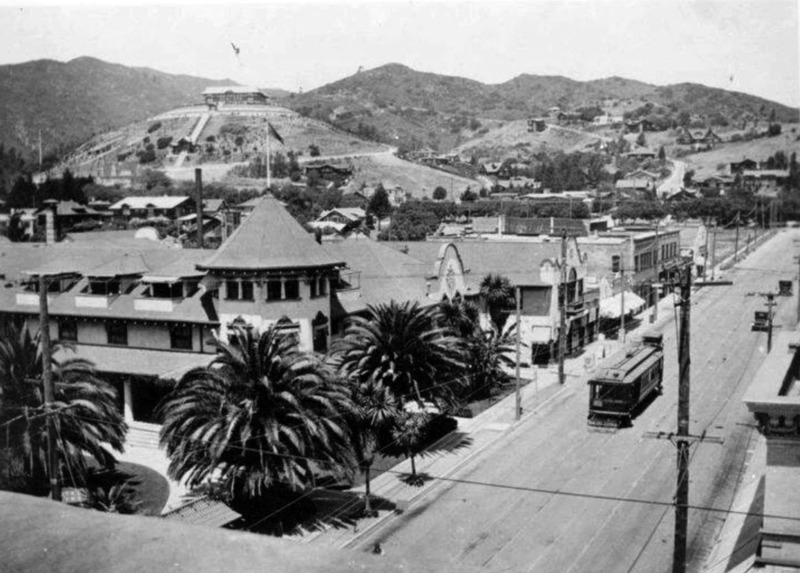 1905)^^^ – View looking southeast from Franklin Avenue toward the intersection of Hollywood Boulevard and Orchid Avenue (center of photo). The Hollywood Hotel is seen at center-left facing Hollywood Blvd. Hollywood High School, facing Highland, is at top center-right. (ca. 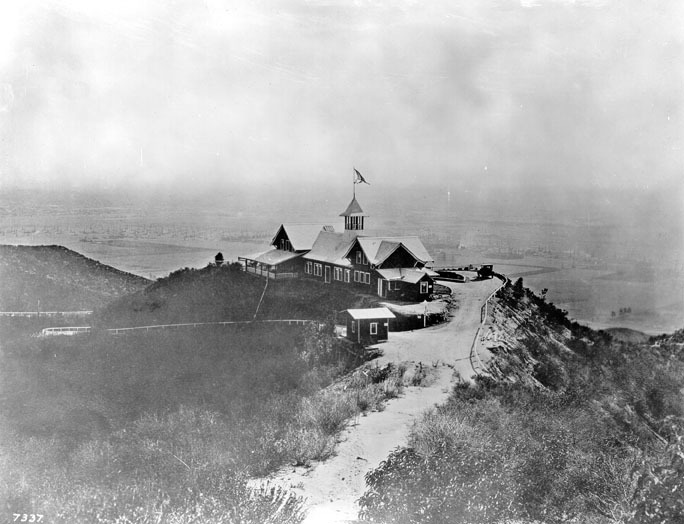 1905)* - Hollywood High School as seen from Highland Avenue (still a dirt road) shortly after the school was built in 1905. (ca. 1905)^^ - Exterior view Hollywood High School looking northwest, with the Hollywood Hills in the background. The three-story building has a tall portico supported by proto-ionic columns where inside is smaller portico supported by two Doric order columns. Both porticos have decorated pediments. "Hollywood Union High School" is displayed below the pediment of the large portico. The façade of the building is symmetric. Two lampposts flank the stairs leading to the front entrance. A flagpole stands on top of the dome-like roof above the porticos in the center of the building. The lawn around the building is well manicured. Newly planted palm trees line the dirt portion of the sidewalk. Rocks and a large boulder lay on the dirt road in the foreground. 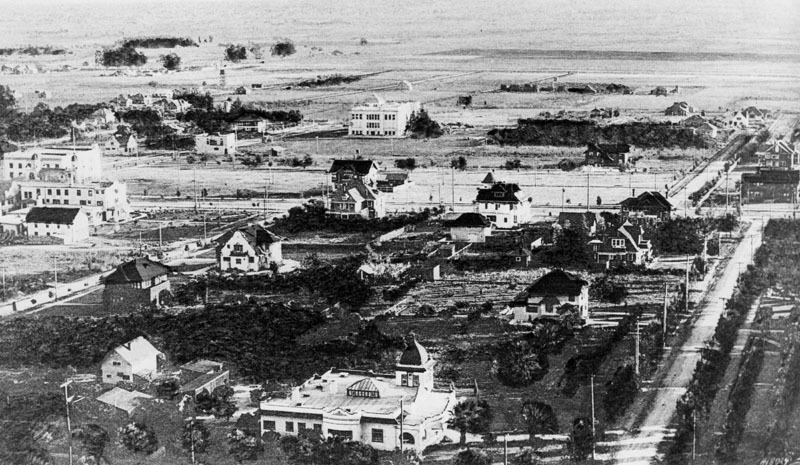 (1906)*^ - View looking south of Hollywood showing Hollywood High School (at center), 1906, one year after it opened. Orchid Avenue is on the left while Orange Drive runs south, dog-legs at Hollywood, and then continues south again. Note the vast open land south of the school. (ca. 1913)^^ - Panoramic view of Hollywood looking south from the head of Orange Street. Note how many more structures have been constructed since the last photo was taken (see previous photo). Also, note how much Hollywood High School has expanded. It is now comprised of several buildings. In the distance can be seen numerous oil fields in the vicinity of the La Brea Tar Pits, near Wilshire and Fairfax. 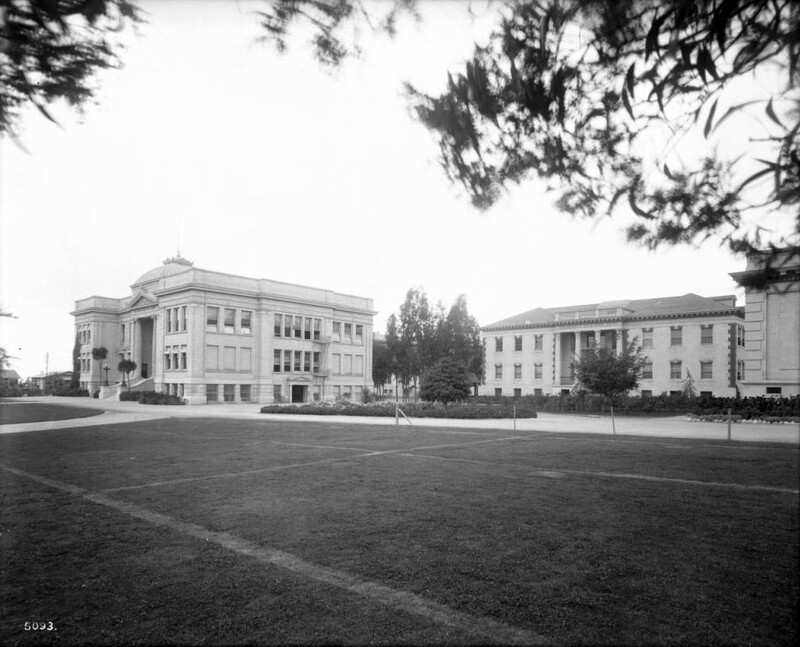 (1916)^^ - View of the campus of Hollywood High School, located north of Sunset and West of Highland Avenue. Overlooking a well-groomed courtyard are two clearly visible buildings. The left building is the original school building built in 1905. It has embossed letters that reads "Hollywood Union High School" directly above its portico. A flight of stairs leads up to the portico. On the side of the building, there is a fire escape ladder near the side entrance. Two bicycles are leaned up against the wall near the side entrance. The right building has embossed letters above its portico, which reads "Household and Fine Arts”. (1905)* - Hollywood Blvd. looking east from Gower Avenue. There are residences to the left and right and a streetcar is seen in the middleground. Barely visible in the background are the Silver Lake Hills. (ca. 1905)^^ - View from a rooftop looking northeast along Prospect Blvd (later Hollywood Blvd) toward Whitley Ave, which dead ends at a T-intersection with Prospect. The Jane House, 6541 Prospect Blvd, can be seen at center-right directly above the horse-drawn carriage, on the east side of Whitley. The Hurd Residence is also visible on the far right at Wilcox Ave. Schrader Blvd (formerly Dae Ave) begins south of Prospect, and is out of frame, just east of Whitley. This photo was taken just east of Cherokee. (ca. 1905)^^ - View of the J.A. Grass Block, southwest corner of Hollywood Boulevard and Las Palmas Avenue. This was later the site of the Egyptian Theater. A horse-drawn carriage sits parked at the curb. Another carriage, without horses, is parked behind it. Streetcar rails are visible in the dirt street. (ca. 1906)* - View of the entrance to the Hollywood Police Station. 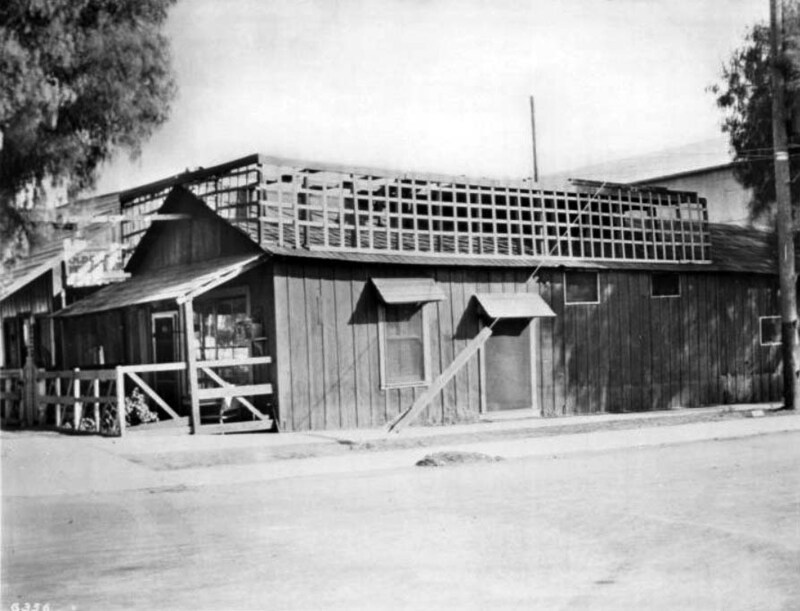 The entrance is on the west side of Cahuenga Boulevard between Hollywood Boulevard and Selma Avenue* on what is now the 1600 block of Cahuenga. Two posts support a roof structure where vines with flowers and leaves grow abundantly. The address number "131" is visible on the right post. 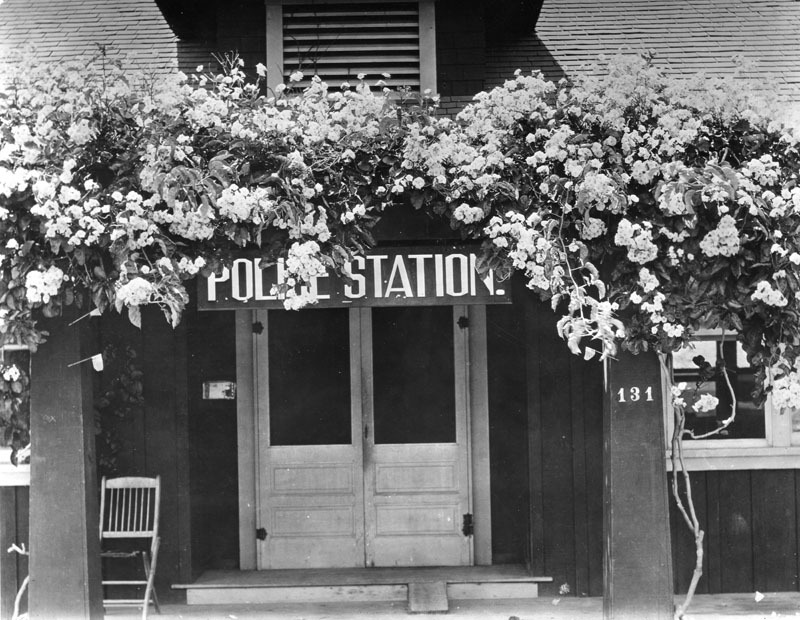 A sign, which reads "Police Station", is displayed above the double-door entrance, while a chair can be seen under the porch at left. *Selma Avenue was named after Selma Weid, daughter of Ivar Weid. Ivar Weid, one of the early pioneers and owner of the Weid Ranch, is given credit by some for coming up with the name “Hollywood”. Ivar Street is named after him. (ca. 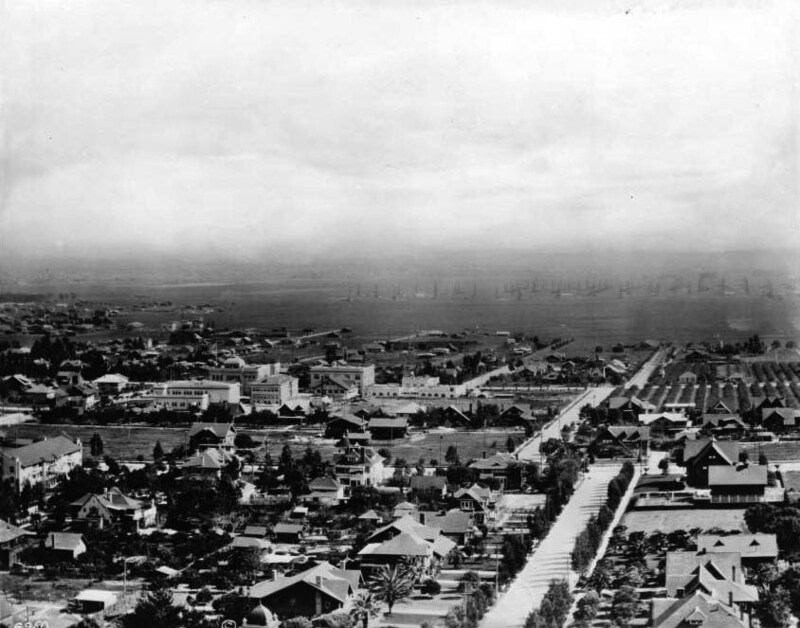 1906)* - Panoramic view of Hollywood looking northeast from the Hollywood High School campus. The highest peak in the distance is Mt. Hollywood. Large houses are seen throughout. 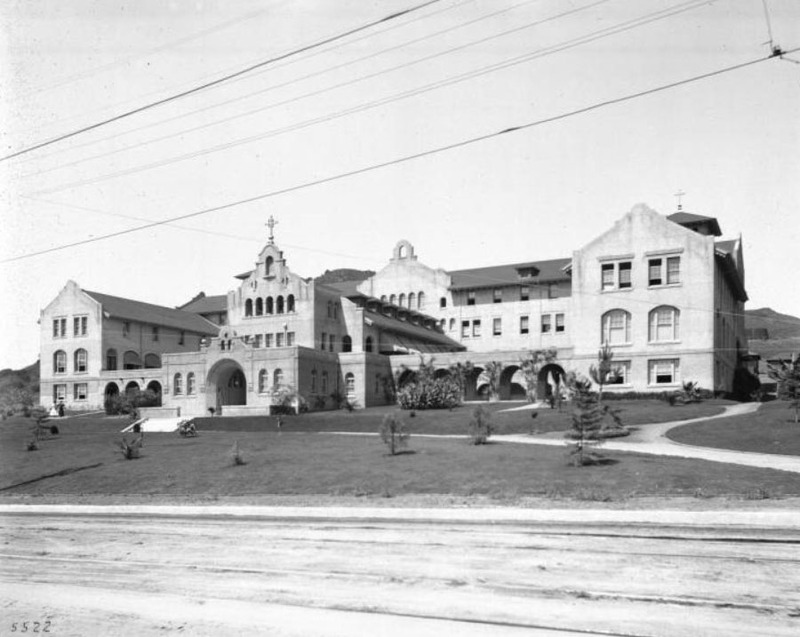 A church building (Blessed Sacrament) can be seen at center right, which stood at the southwest corner of Prospect Avenue (Hollywood Blvd.) and Eulalia Street (now Cherokee). It later moved to Sunset Blvd. 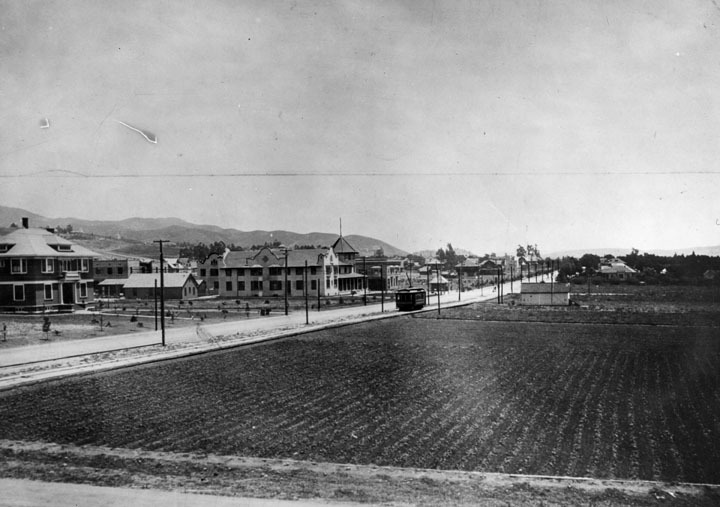 (1907)* - Panoramic view of Hollywood looking north from the Hollywood High School campus. A number of houses are seen as well as electric power poles. 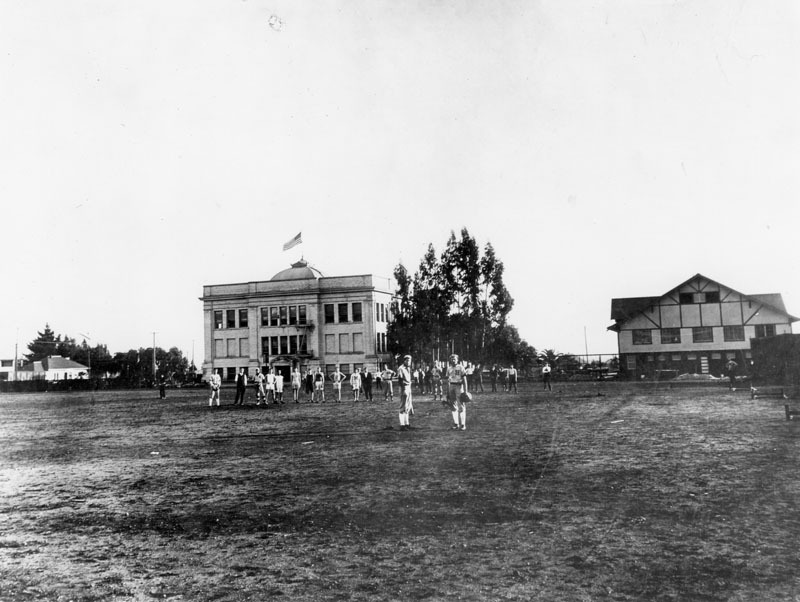 (1909)* - Hollywood Union High School athletes, both baseball and track, are in their uniforms on the field in back of the high school. An English half-timbered style house is next to the school. 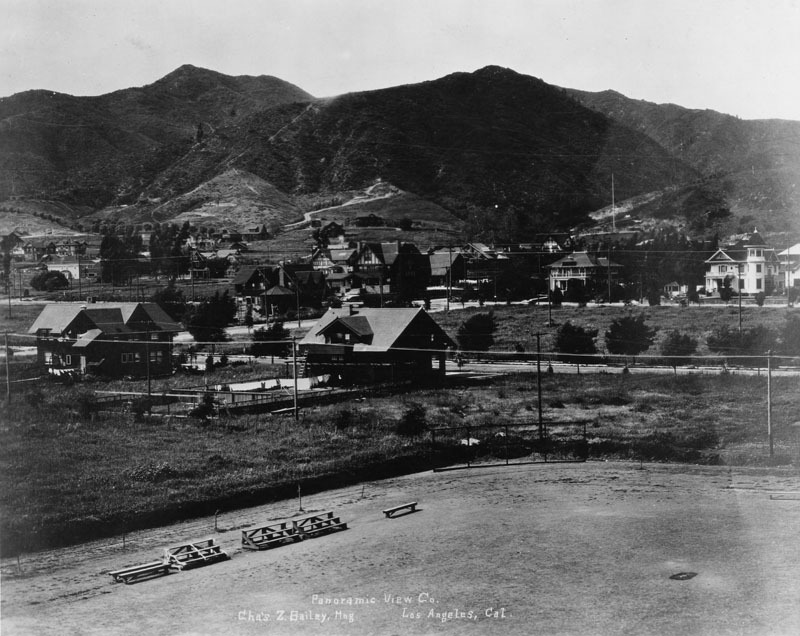 (1908)* - Panoramic view of Hollywood, looking toward the hills from the Hollywood High School campus, the later site of the Roosevelt Hotel. An athletic field is in the foreground. A number of houses are seen, and electric power poles are visible. The Hollywood Hotel is out of view on the right. (1909)^.^ – Panoramic view of Hollywood looking northwest as seen from the top of the Hollywood Hotel. 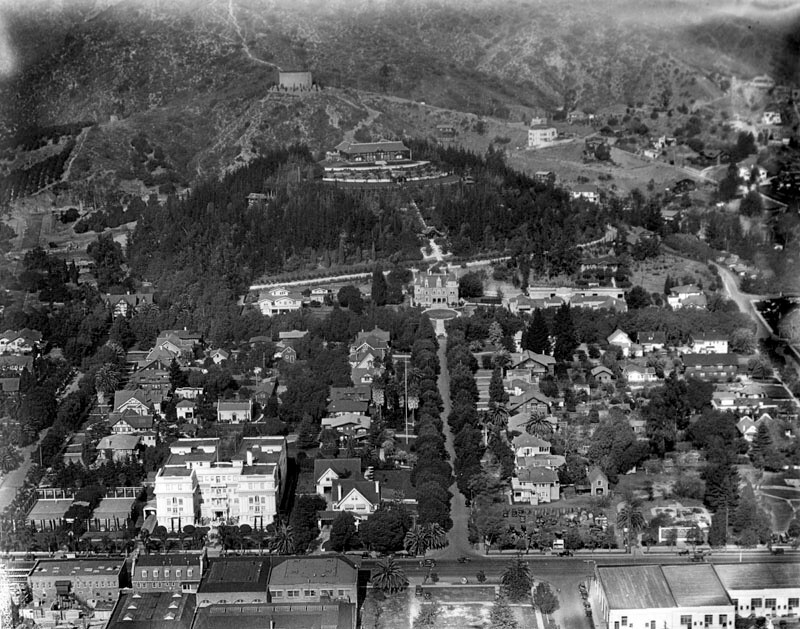 The yet to be completed Lane Mansion (aka Holly Chateau and currently the Magic Castle) is seen in the foothills just above Franklin Avenue at center-left. Orchid Avenue is the street that runs diagonally from bottom-left to middle-right (note the early model car). A large home sits on top of the hill behind the Lane Mansion. It will soon be torn down to make room for the 1914-built Bernheimer Estate and Gardens (currently Yamashiro Restaurant). 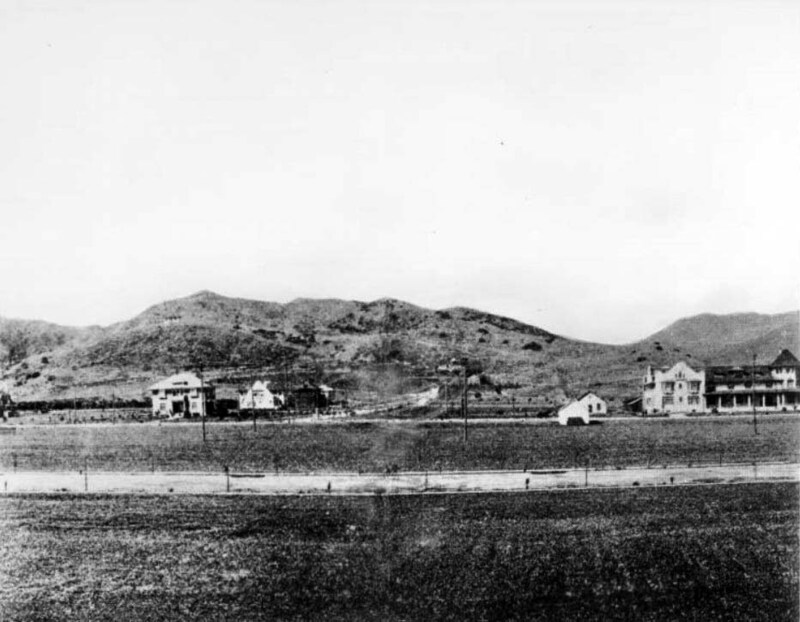 (Early 1900s)* - Early view of Franklin and La Brea Avenues with residential buildings in the foreground and hills in the background. (ca. 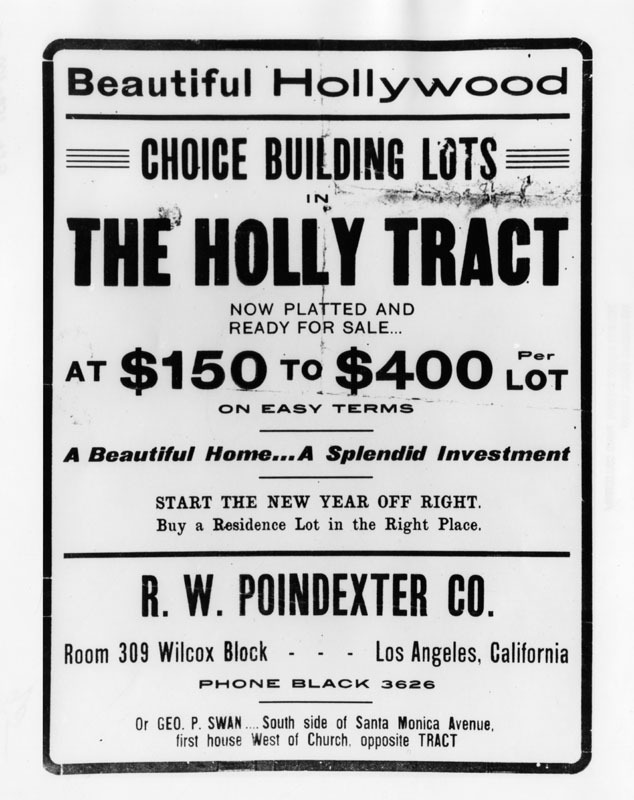 1908)* - A photo of a flyer advertising real estate: "Choice building lots in the Holly tract, now platted and ready for sale at $150 to $400 per lot." These residential lots are being sold by R.W. Poindexter Co. and George P. Swan. Their addresses are given on the flyer. Photo dated circa 1908. (ca. 1909)^** – Motoring on Hollywood Boulevard, west of Highland. 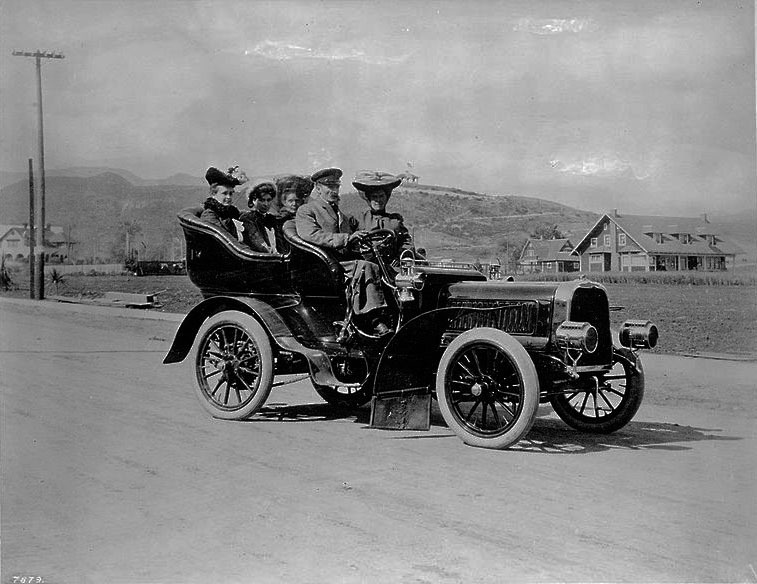 View shows a portrait of five people seated in a car with houses in background. 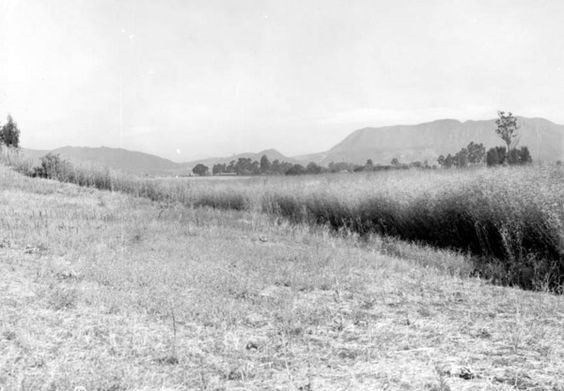 (1918)* - View of a casaba field near the corner of Sunset and Harper, in West Hollywood. 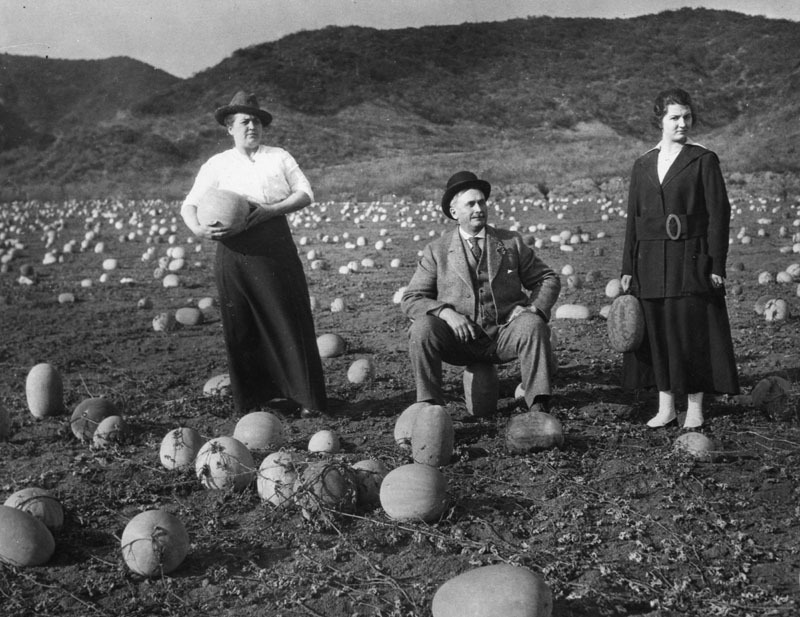 Two women are each holding a melon while a man sits on one. (ca. 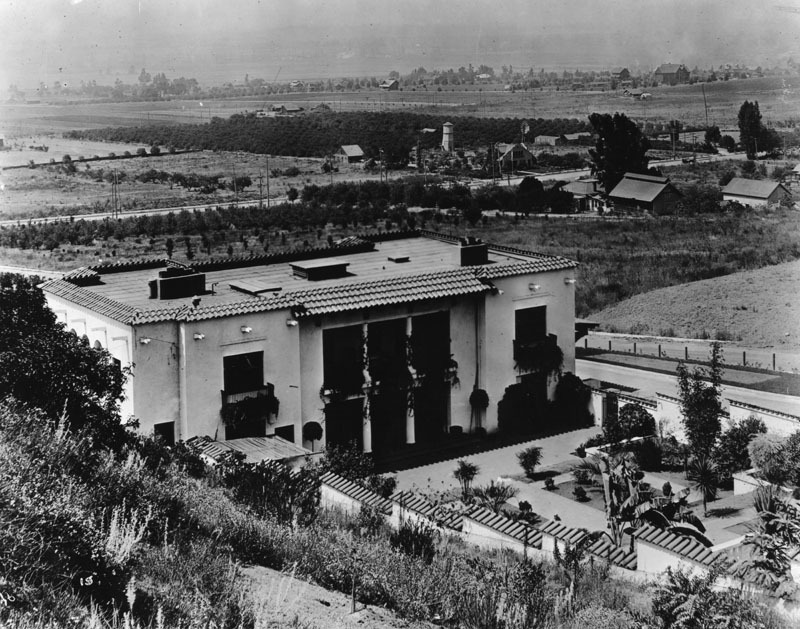 1910)* - Exterior rear view of the Spanish Revival Wattles Estate, looking southwest towards smaller homes, farms and orchards in Hollywood and what is now West Hollywood. 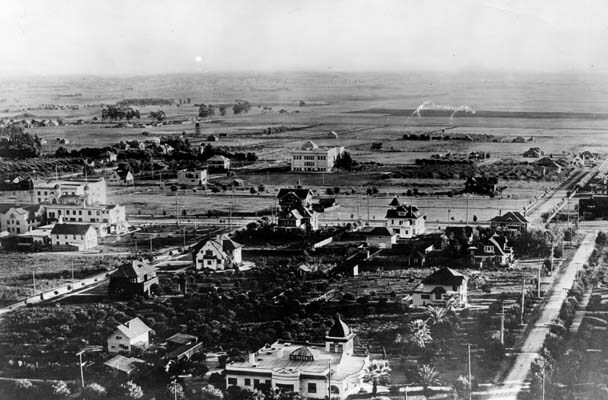 (1909)* - Panoramic view of West Hollywood, showing a few houses and much open space in 1909, when much of the area was agricultural. The view is from the rear of Wattles Gardens. 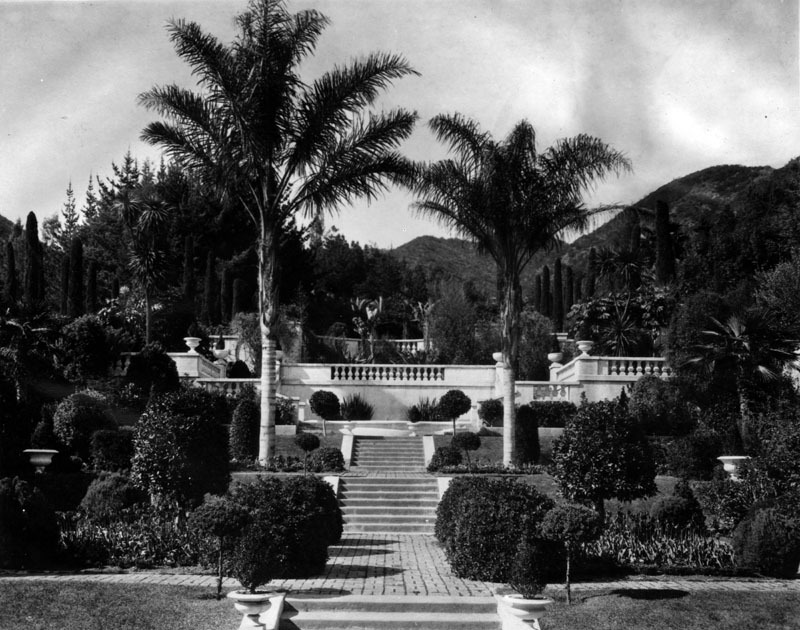 (n.d.)* - View of the manicured and terraced garden of the Wattles Estate in Hollywood, looking towards the hillside. 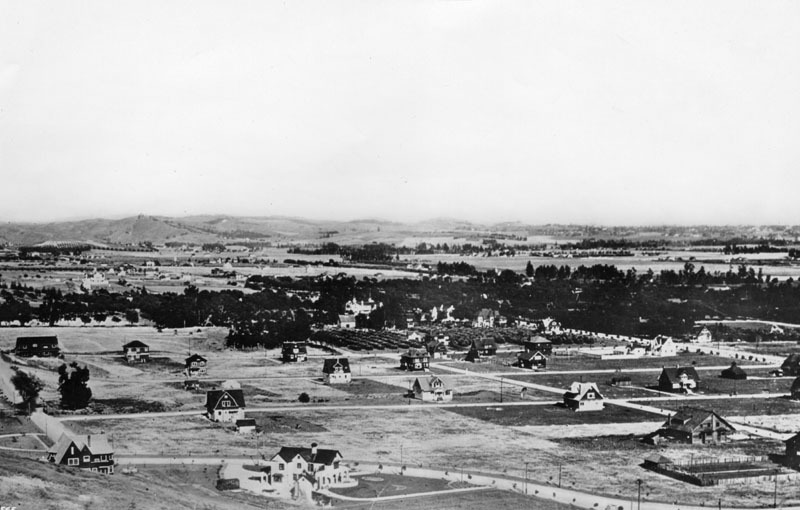 (1909)* - Panoramic view of Hollywood in 1909, taken from Laughlin Park at Franklin and Western Avenues. 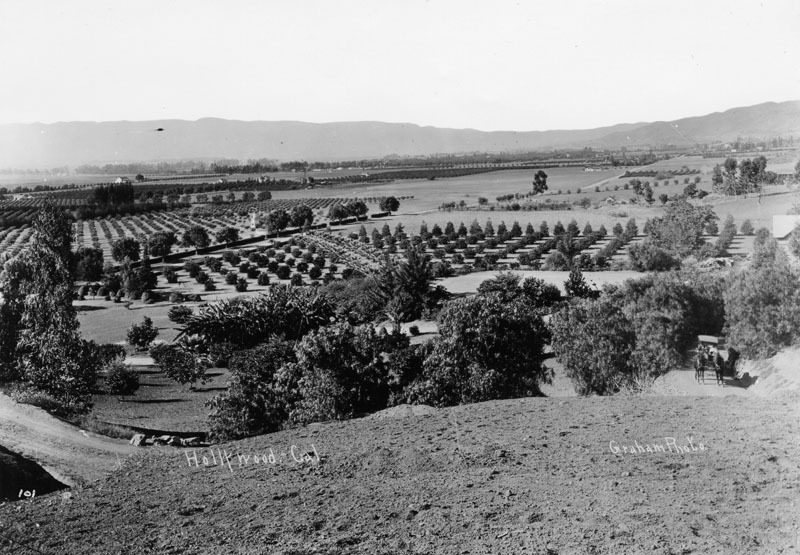 Numerous orchards are seen, and a horse-drawn carriage is at right. (ca. 1900)* - View looking west on Melrose Avenue from Western Avenue. 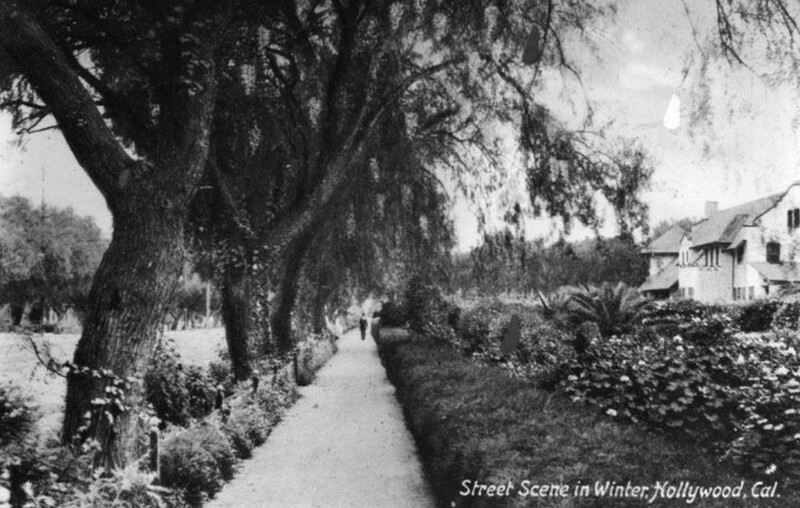 Trees were planted in the early 1880's and felled on the right side in 1922 and on the left side in 1923. (ca. 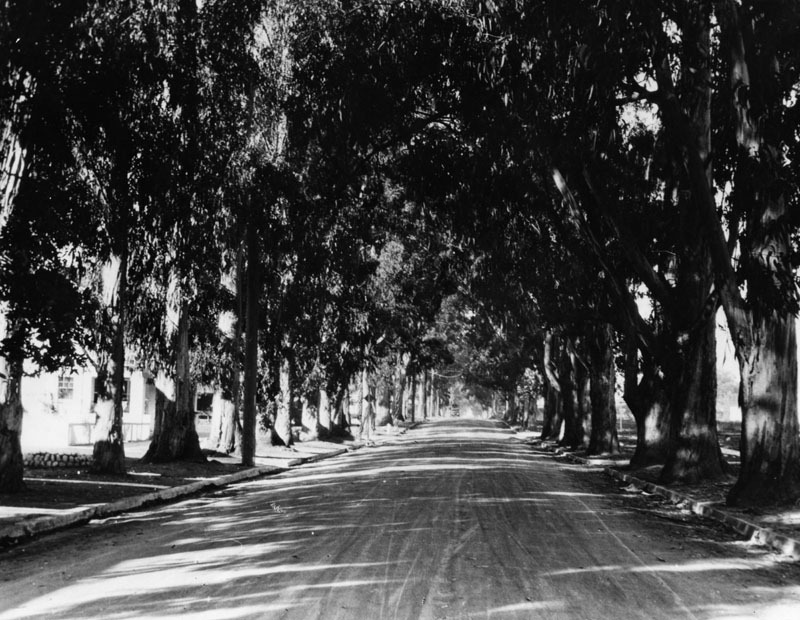 1910)* - Tree-lined Melrose Avenue at Western Avenue. Houses and street curbs can now be seen. This was a favorite street for horse and buggy rides on Sundays. 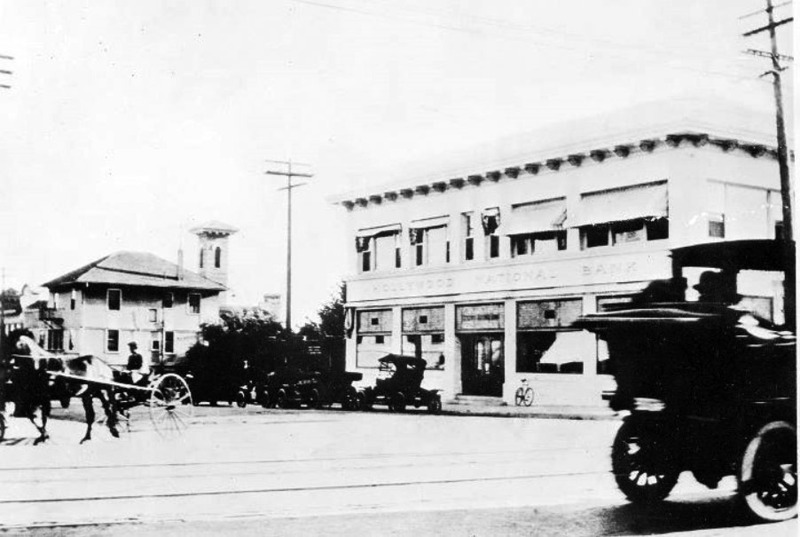 (1910)^^ – View showing the Cahuenga Valley Lemon Exchange Building (originally Colegrove Lemon Exchange) on Santa Monica Boulevard at Cahuenga Avenue. Two men in aprons look off the back porch of the two-story depot, under the overhang of the roof, to which a lightning rod is attached. A tree with peeling bark is pictured in front at left, just behind the rail tracks that are visible beneath the sparse grasses on the ground. The men are surrounded by crates stacked along the porch. (ca. 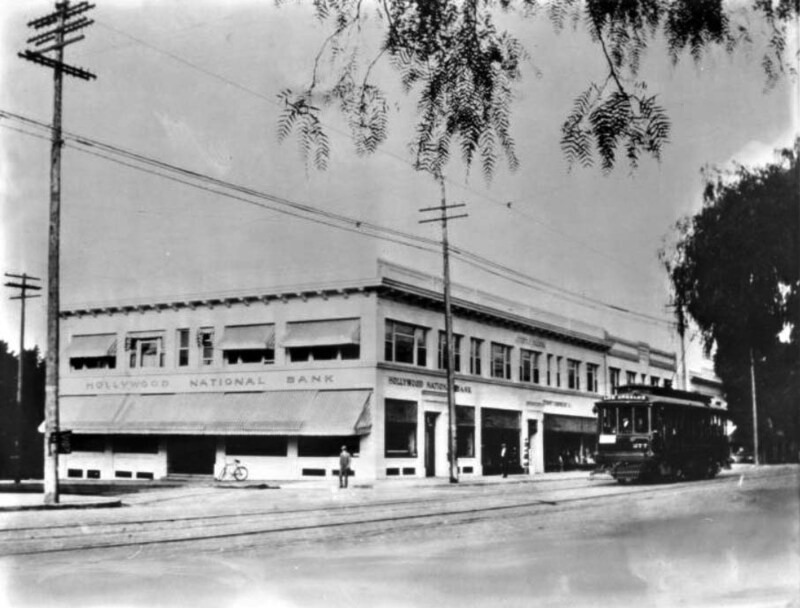 1910)^^ - Exterior view of the first store built in Hollywood, at the corner of Sunset Boulevard and Cahuenga Avenue. The store, built circa 1887, has exterior plank walls, a covered patio with railing visible at left on the narrow side of the house, and both a doorway and a window on the wide side shaded by small overhangs. The roof of the building is topped by a grid of wooden framework. Trees are visible in the background, and what appears to be a telephone pole is visible to the extreme right. A sidewalk runs the edge of both of the store's street-side walls. (ca. 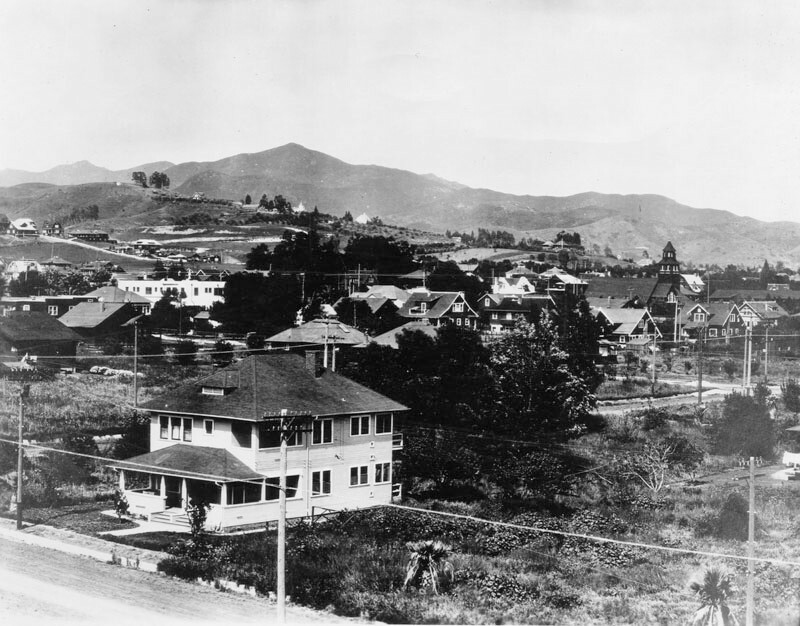 1905)* - View showing the Sackett Hotel, facing Cahuenga Blvd at the southwest corner of Hollywood Blvd. and Cahuenga. The hotel was built in 1888 by Horace Sackett. A post office was added in 1900, and the hotel stood until 1910 or 1911. 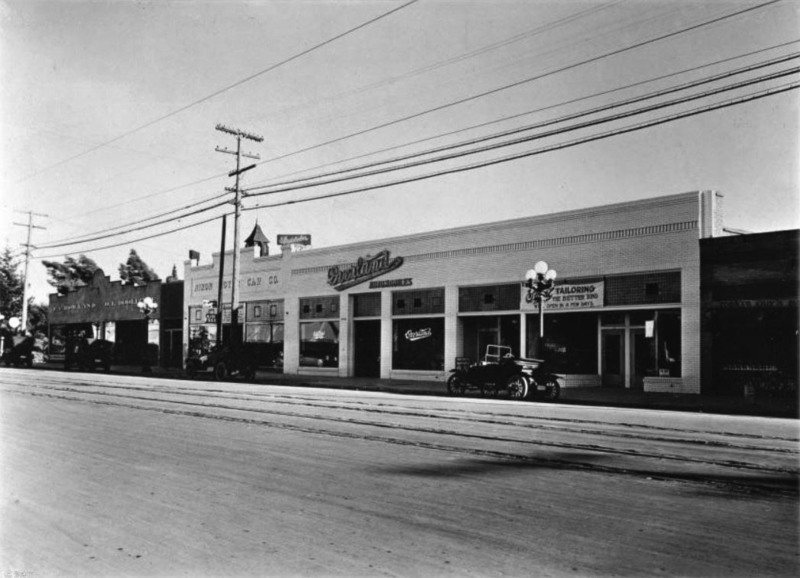 Here the Sacketts ran the first hotel in the Cahuenga Valley and the second general merchandising establishment within the corporate limits of Hollywood. He also kept a few horses for his clientele and to work the blocks east and south of the store, where he had a garden to sell produce in his store. Due to competition from the new Hollywood Hotel, built two years earlier at the northwest corner of Prospect and Highland, Sackett closed his hotel in 1905. He sold the property to Henry Gillig, but it remained unoccupied for the next five years except for one store room on the first floor. Click HERE to see more Early Views of the Sackett Hotel. (ca. 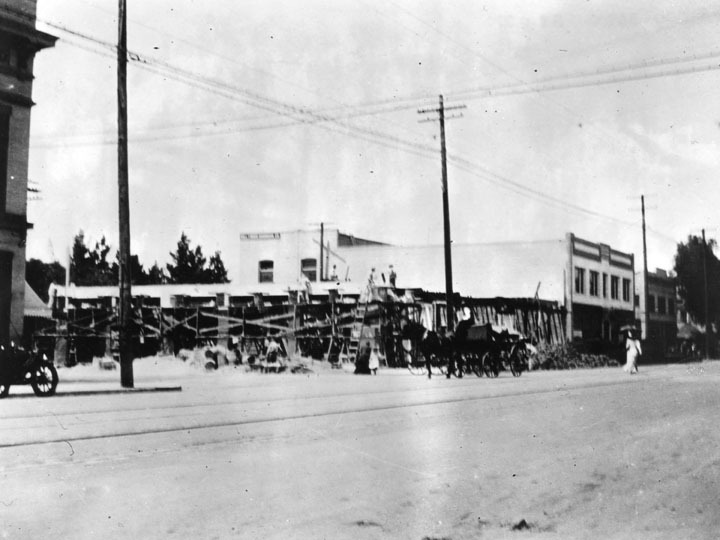 1911)* - View showing the construction of the Creque Building on the southwest corner of Hollywood Blvd. and Cahuenga, where the Sackett Hotel once stood. (ca. 1911)^**- View of a completed Creque Building housing the Hollywood National Bank on the main floor (S/W corner of Hollywood Blvd. and Cahuenga). 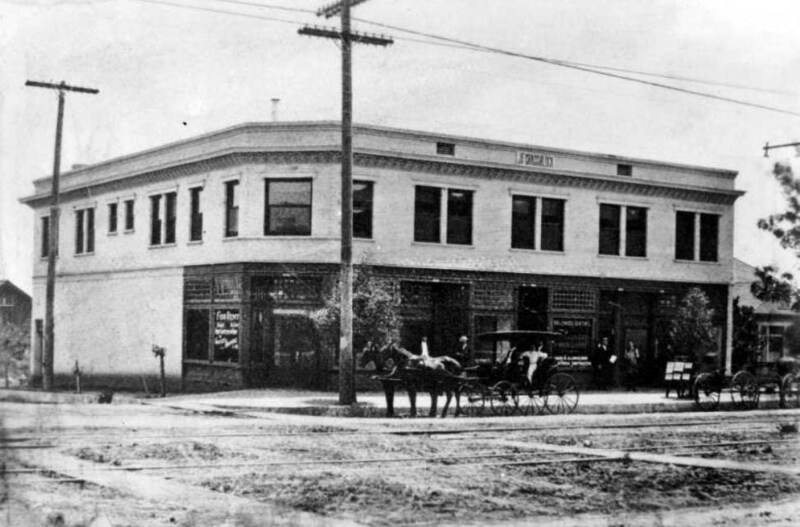 Horse-drawn wagon is seen on the left with early model cars parked in front of the new building and on the right. (ca. 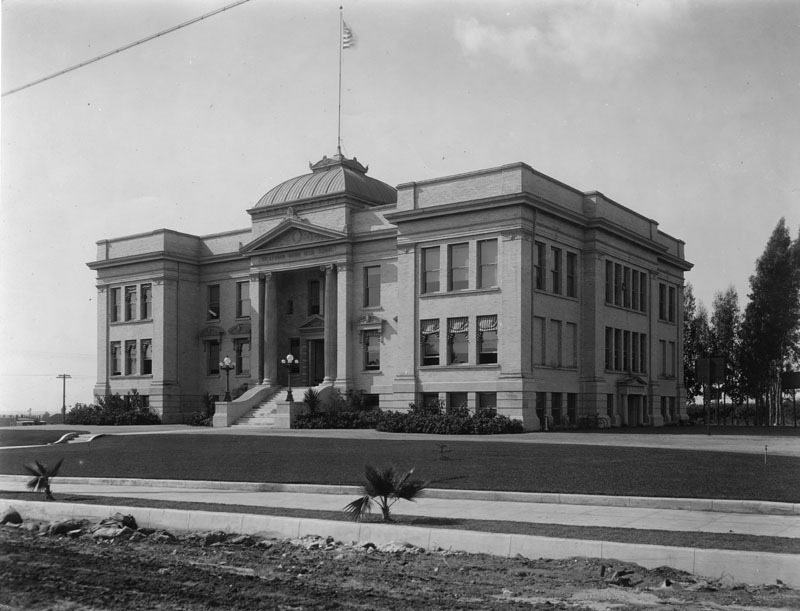 1911)^^ - View showing the Hollywood National Bank in the Creque Building (S/W corner of Hollywood and Cahuenga). The simple, two-story building has striped cloth canopies extending from most of the windows, both top and bottom, on the left side. A bicycle has been leaned against the outer wall. A man stands near it on the corner in front of the bank while at right, a cable-car makes its way across its tracks. (ca. 2016)*. 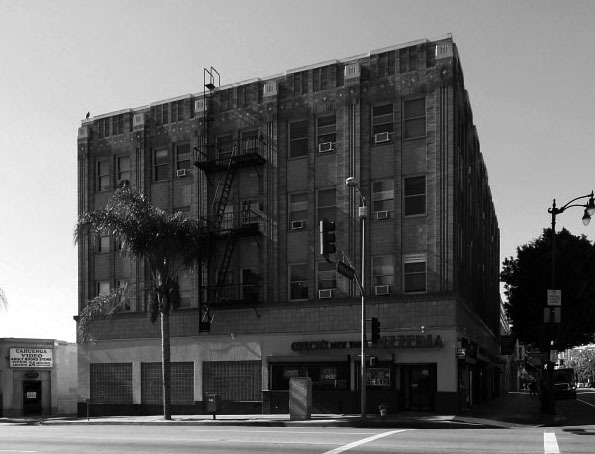 * – View showing the Creque Building (6400-6408 Hollywood Blvd) located on the SW corner of Hollywood and Cahuenga, now a four-story building. In 1934, the Creque Building was enlarged by adding two stories and given its current Art-Deco brick-and-tile redesign. It is now called 'The Hollywood Building'. Click HERE for a more contemporary view. (ca. 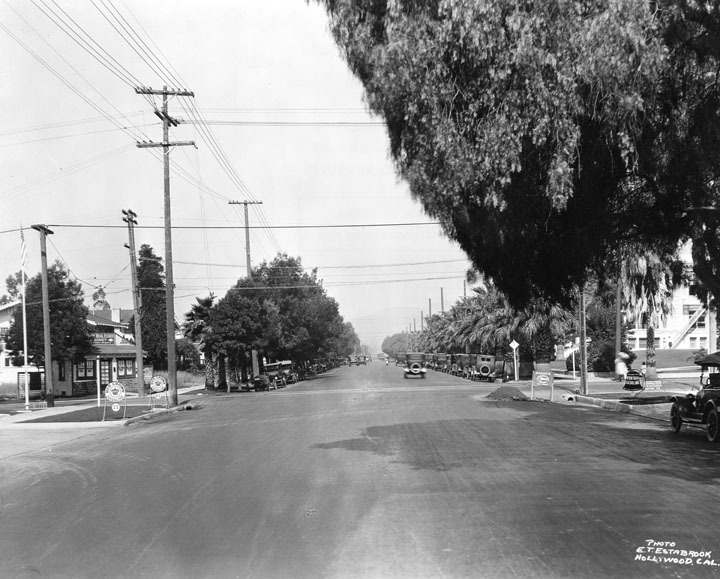 1912)^^ - View looking west on Hollywood Boulevard between Las Palmas Street and Cherokee Avenue. A row of long, adjacent one-story commercial buildings is pictured back off the unpaved road that cuts across the frame from left to right. Along the sidewalk, four early automobiles have been parked. At the center of the shops, "Overland Automobiles" is pictured, to the left of which is "Nixon Motor Car Co." and "F.C. Howland O.L. Doolittle". To the right, a tarp sign on the front of the commercial shop reads "[...] Tailoring. The better kind. Open in a few days". Street car rails can be seen embedded in the road close to the sidewalk. Utility poles line the street. In the background, a Catholic church can be seen beyond the shops. 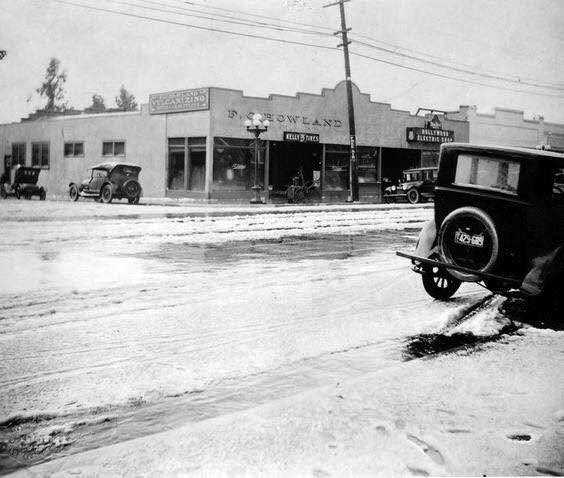 (1921)^.^ - Snow on Hollywood and Cherokee. View is looking at the NE corner. Sign on the corner building reads “F. C. Howland”. (1911)* - View of the Blondeau Tavern building on the northwest corner of Sunset Boulevard and Gower Street. Behind the building can be seen the first motion picture stage in Hollywood. 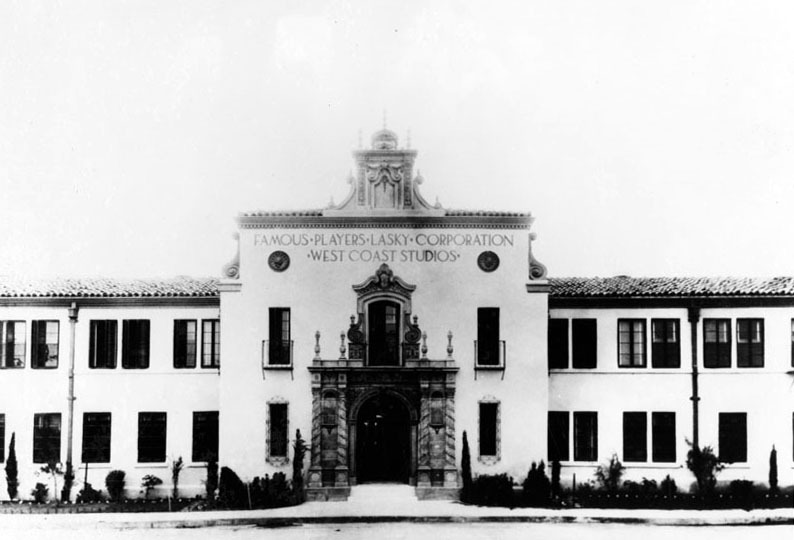 (1913)* - The first motion picture studio in Hollywood was built by David Horseley for Christie Film Co. Automobiles are lined up at Sunset Blvd., with Gower Street at right. The sign above the building reads "Christie Film Co.", and "Nestor Comedies, Universal Films." Carl Laemmle, who formed Universal Pictures, absorbed the Nestor company and others in 1912. Director Al Christie continued to make many films at the expanded studio under the banner "The Christie Comedies" until the early 30s, when the facility became a rented lot. (1909)^.^ - View looking northwest from a rooftop near the Hollywood Hotel showing the Lane Mansion (aka Holly Chateau) under construction in the foothills just above Franklin Avenue. Orchid Avenue, with early model car on it, is seen at lower right. (ca. 1910s)^x^ - View showing the Holly Mansion (aka Holly Chateau) built by Rollin Lane in 1909. 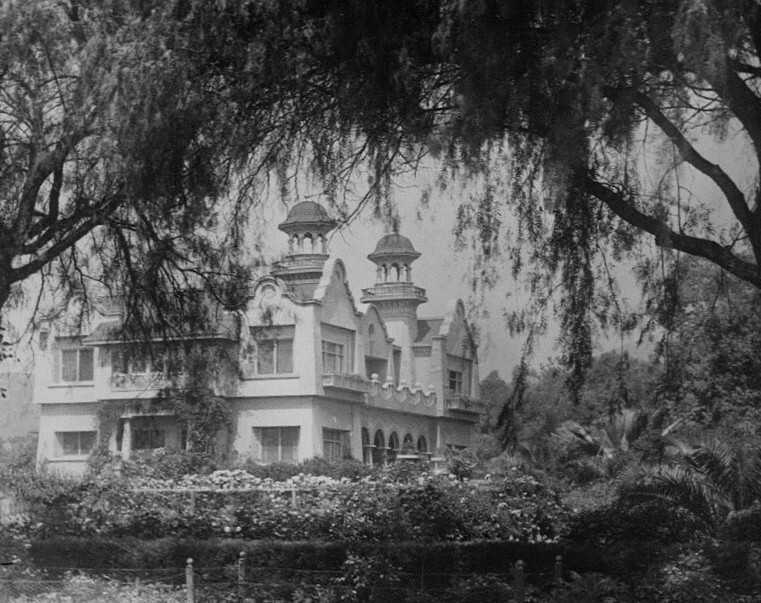 This house became the Magic Castle in 1963. (1936)^x^ – View showing a man walking down the front stairs of the Lane Mansion (named Holly Chateau) built by Rollin B. Lane. Now home of the Academy of Magical Arts and the Magic Castle. (Early 1900s)^x^ – Close-up view of the Victorian-style Rollin B. 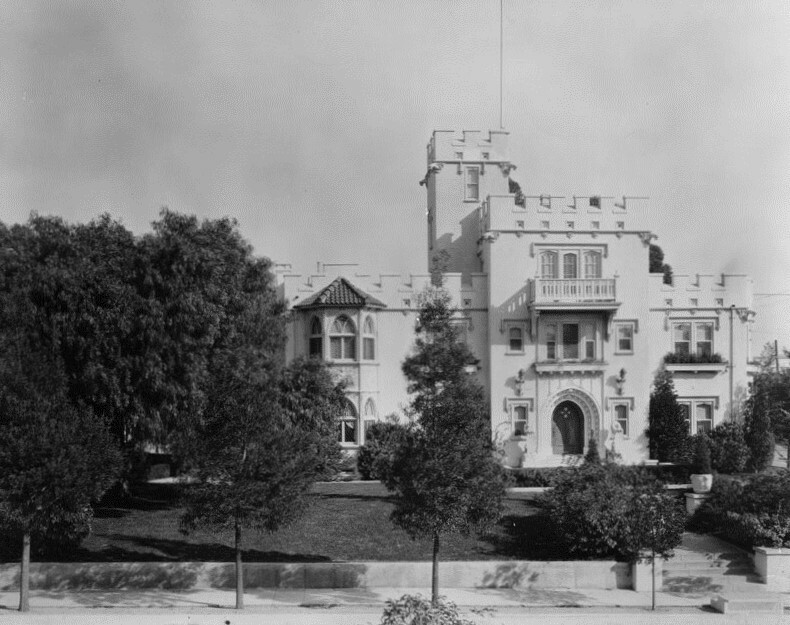 Lane Mansion (aka Holly Chateau) located at 7001 Franklin Avenue in Hollywood. (ca. 1915)*^^ – View looking north on Orange Drive showing the Lane Mansion (later Magic Castle) at the T-intersection with Franklin Avenue. The Bernheimer Estate and Gardens (built in 1914) is seen at the top of the hill in the background. (ca. 1924)* - Aerial view looking north on Orange Drive toward Franklin Avenue. The Rollin B. Lane Estate (now Magic Castle) is seen on the north side of Franklin at the end of the T-intersection (center of photo). Hollywood Boulevard runs horizontal in the foreground. The white building at lower-left is the Garden Court Apartments. The building at the top of the hill behind the Lane Estate is the Japanese estate and gardens of brothers Charles and Adolph Bernheimer (Bernheimer Estate and Gardens). After the Lanes passed away in the 1940’s, the mansion was divided into a multi-family home. It then became a home for the elderly and was finally transformed into a maze of small apartments. By 1960, the fate of the Mansion was uncertain. Then Milt Larsen met the owner, Thomas O. Glover. Milt was a writer on the NBC-TV show Truth or Consequences. His office was on the ninth floor of a Hollywood office building that overlooked the Lane mansion. Milt’s late father, William W. Larsen Sr., was a renowned magician and had long dreamed of building an elegant private clubhouse for magicians. 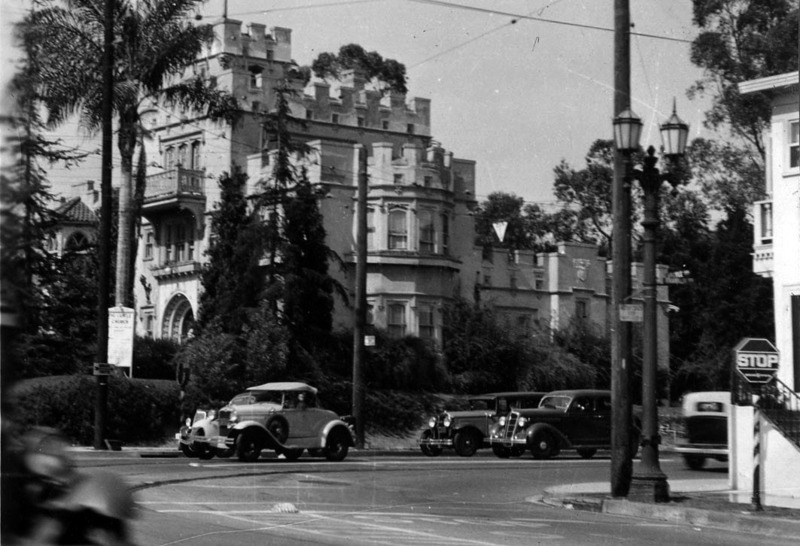 Click HERE to see more Early Views of the Magic Castle. (ca. 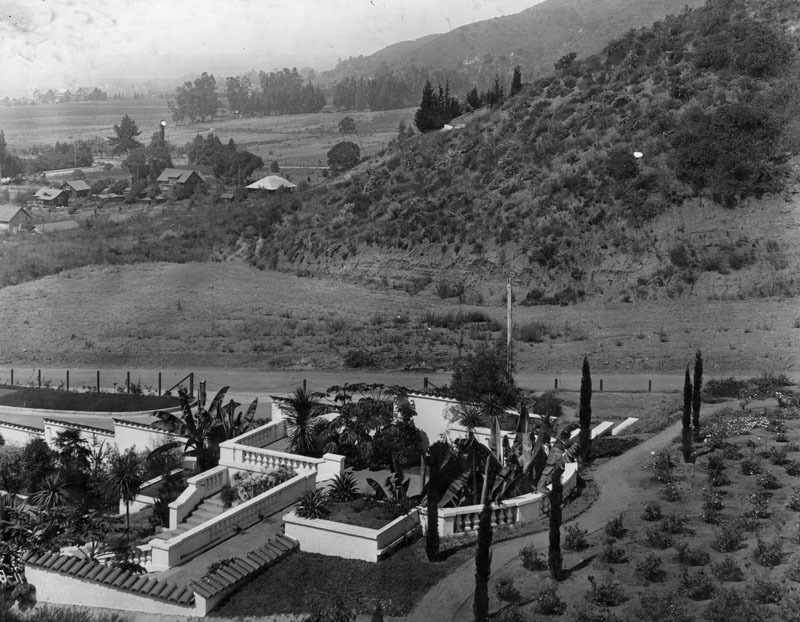 1912)^^ - View of Glengarry Castle, the residence of Dr. Schloesser in Hollywood. The three-story castle-like building can be seen at center with a tower visible on the roof at center. A balcony is visible on the third story, while a long staircase leads to the arched front entrance. Statues can be seen on either side of the archway, while grass is visible in the front yard. (ca. 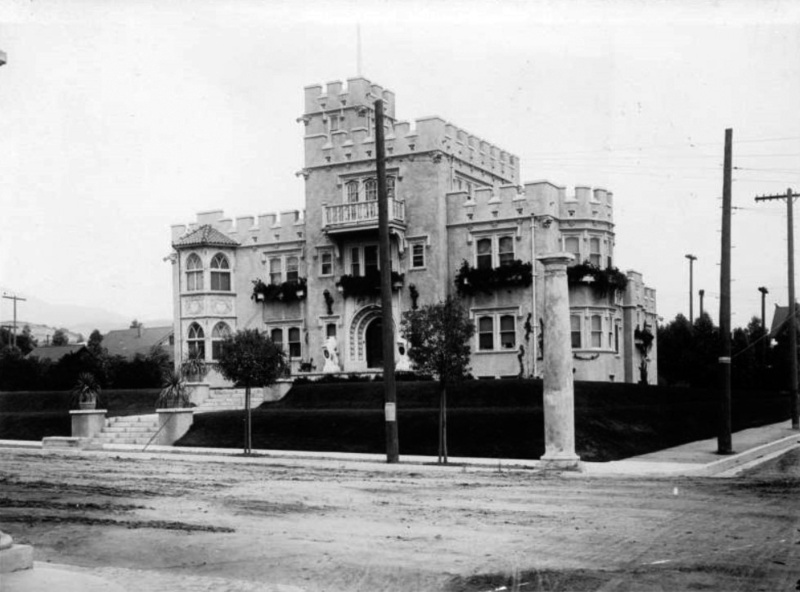 1913)* - Exterior view of Glengarry Castle (also known as Schloesser Terrace) located on the eastern side of Argyle between Franklin Avenue and Dix Street in Hollywood. He was originally called Dr. Alfred Guido Rudolph Schloesser, but during World War I, due to anti-German sentiment, he changed it to Castles, a direct translation from the name Schloesser. (1934)*^^ - View showing Glengarry Castle located on the northeast corner of Franklin and Argyle avenues. Click HERE for contemporary view of the NE corner of Franklin and Argyle. Dr. Castles originally lived in Glengarry Castle (NE corner of Argyle and Franklin). But that 'home' soon proved too small for his burgeoning social life and medical practice. 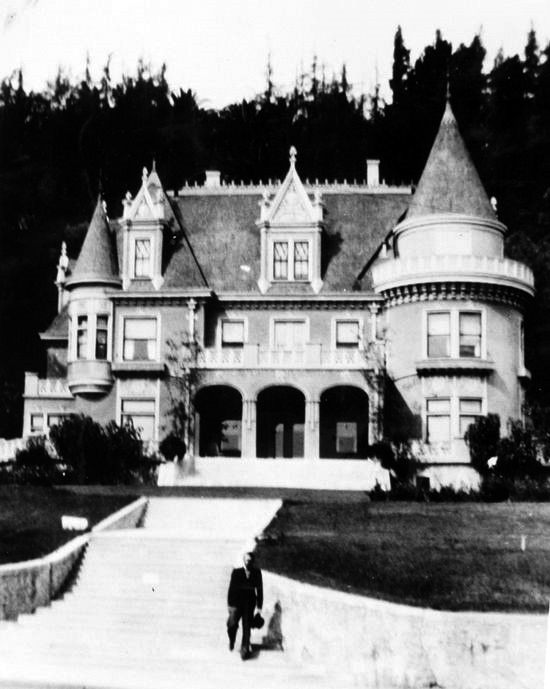 So in 1912, he built Castle Sans Souci on a three-acre plot across the street (NW corner of Argyle and Franklin). (1921)^^^ – Postcard view of Dr. A. G. Castles’ Mansion Sans Souci, Hollywood. 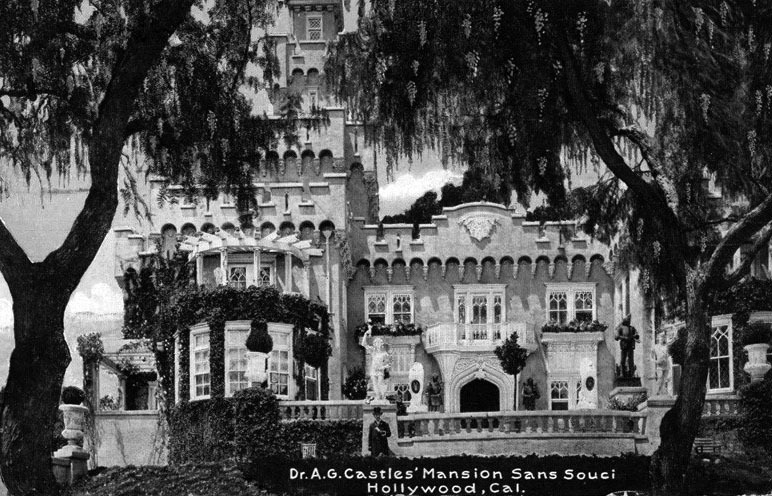 (1920s)^^^ – Postcard view showing Castle Sans Souci, Dr. Schloesser’s (Dr. Castles) Hollywood home. 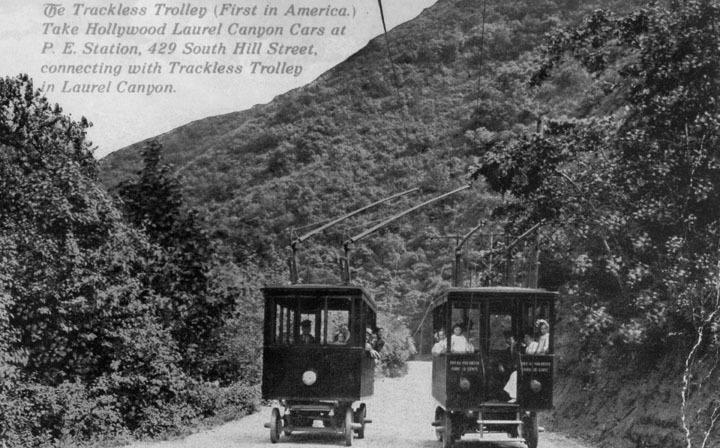 The Laurel Canyon "Trackless Trolley"
(ca. 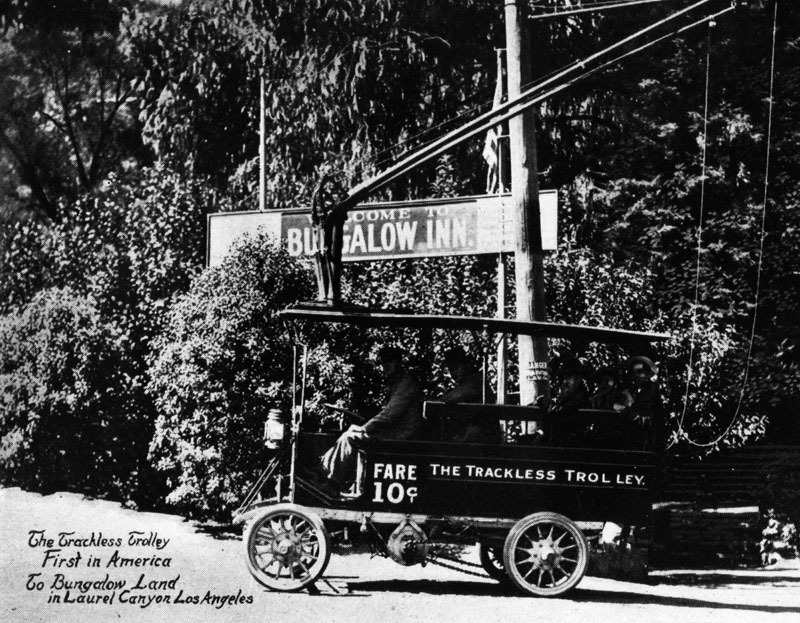 1912)* - A trackless trolley, "The First in America," traveling to and from "Bungalow Land" in Laurel Canyon, Hollywood. Fare was 10 cents. (ca. 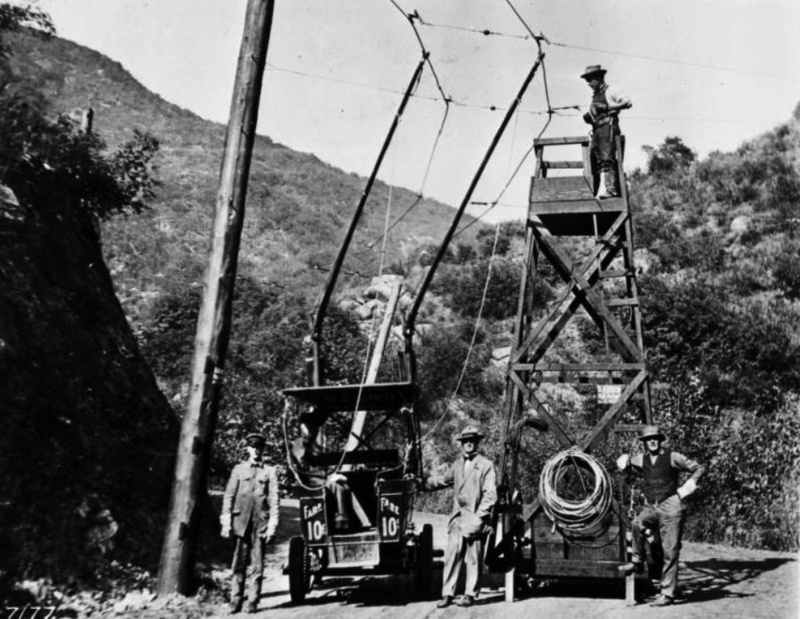 1912)#* - View showing a maintenance crew working on the overhead wires of the nation's first trackless trolley on Laurel Canyon. The trolley was actually a large automobile (1912 Oldsmobiles) converted to run on an electric engine connected to overhead wires, which frequently dislodged. It had an approximate 10-passenger capacity. After about 5 years of traveling up and down the treacherous narrow road, the poor old trolley buses fell apart. (ca. 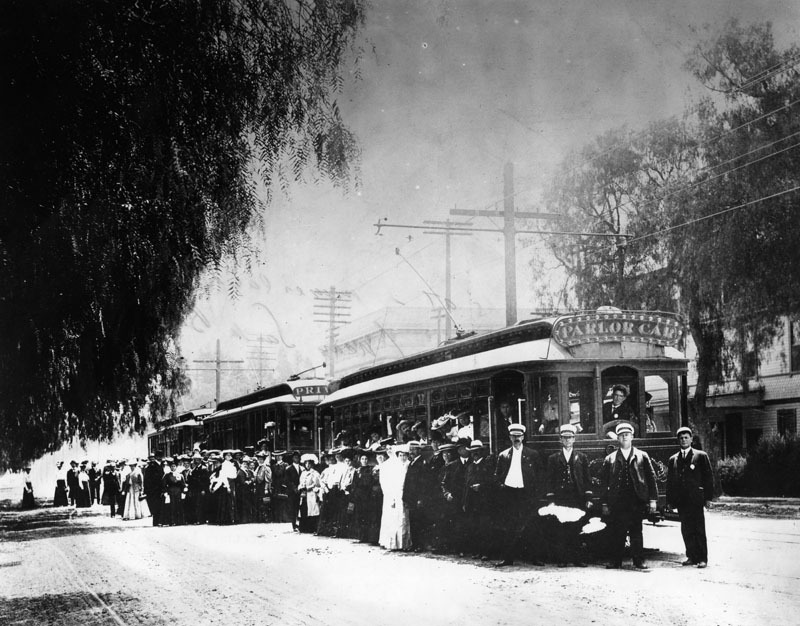 1912)* - View showing two trackless trolleys passing each other on Laurel Canyon. (ca. 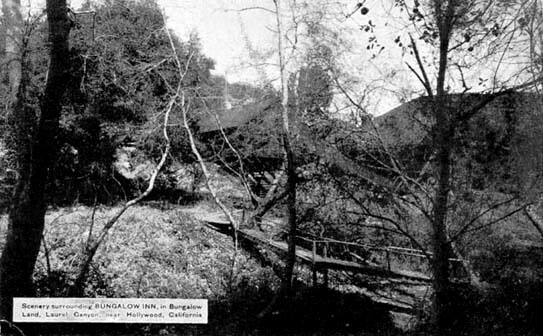 1912)#^* - View showing Charles Mann’s Bungalow Inn nestled in the lowland valley across a little spring fed stream near the present day intersection of Laurel Canyon Blvd and Lookout Mountain Avenue. 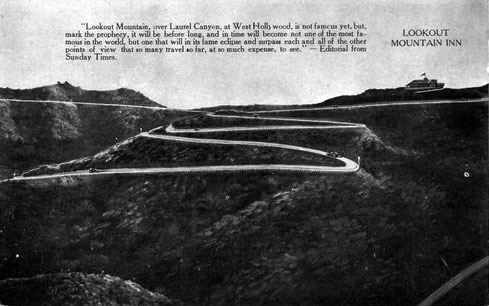 In 1910, Charles Mann and his partners built a narrow road leading up to the crest of Lookout Mountain. 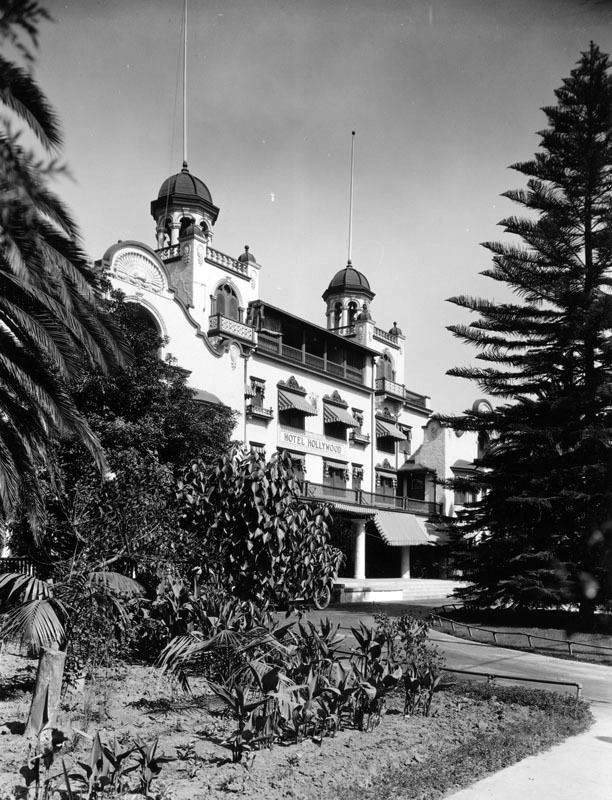 Upon that crest they constructed a lavish 24-room inn with sweeping views of the city below and the Pacific Ocean beyond. 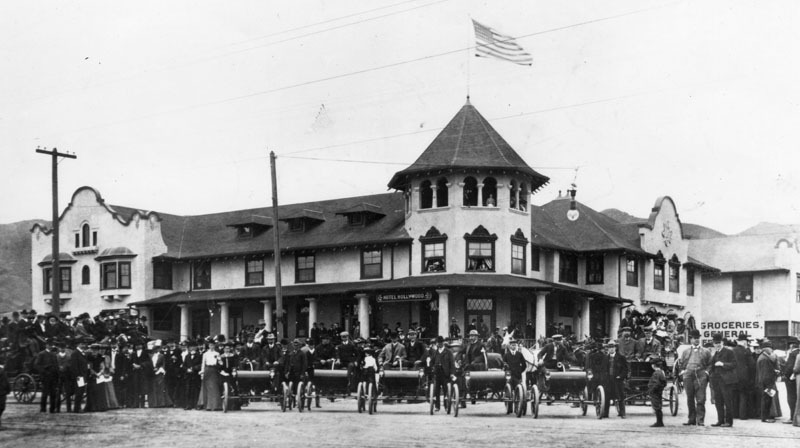 The Lookout Inn featured a large ballroom, riding stables, tennis courts and a golf course, among other amenities. (ca. 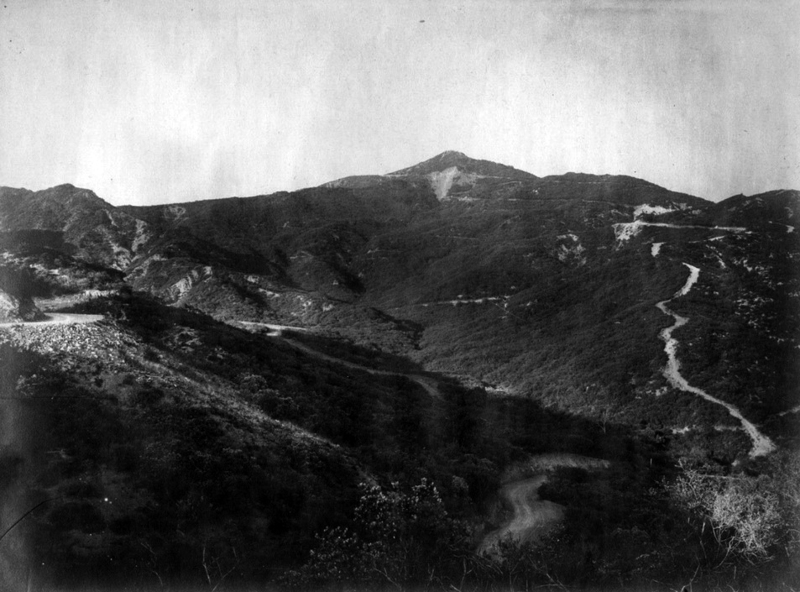 1913)#^* - View showing the road leading up to the Lookout Mountain Inn, also built by Charles Mann to promote his Laurel Canyon properties. (1916)* - View of Lookout Mountain Inn perched high on the Hollywood Hills. It offered spectacular views of the city below. In the distance can be seen oil wells, which makes this view looking south toward the Gilmore Oil Fields. Wide verandas on three sides of the main structure offered 270-degree views of the lowlands below and the ocean beyond. Guests, paid $15 per week for room and board. 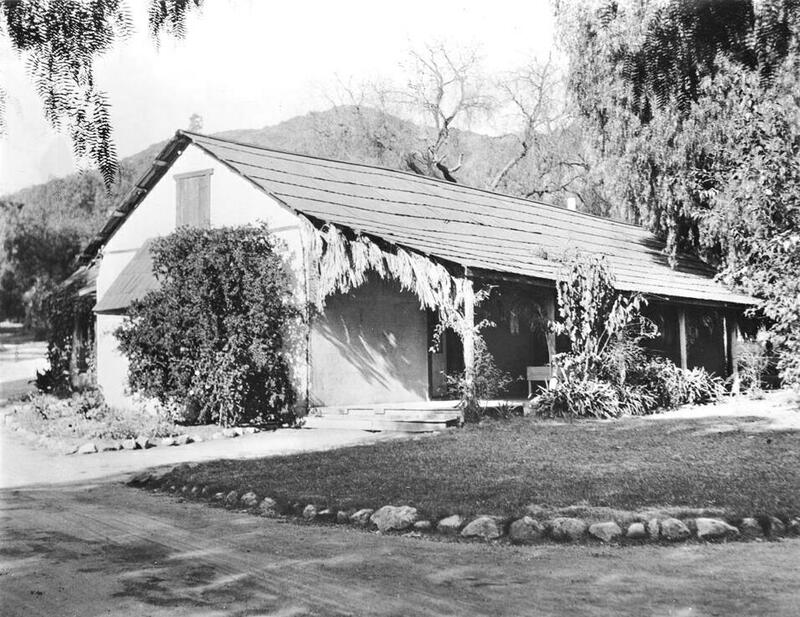 Charles Mann, the original developer of Laurel Canyon, is not the same Charles Mann who founded the real estate office at Kirkwood and Laurel Canyon Blvd, and there is no relation. Just a coincidence of history. (ca. 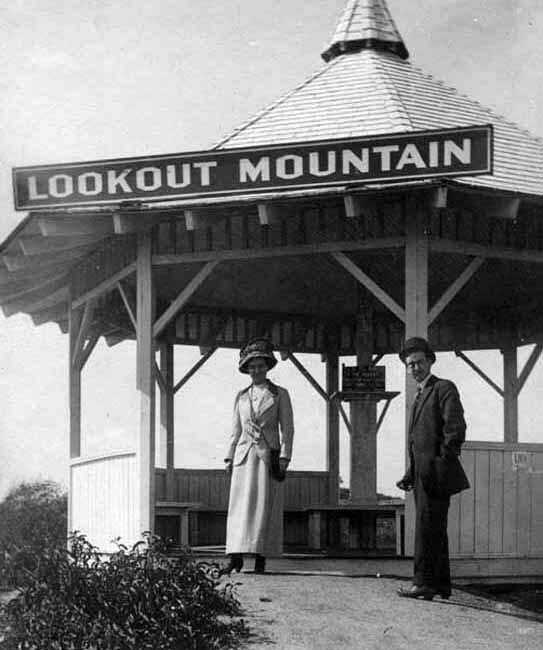 1916)#^* - Once at the top, visitors to the Lookout Mountain Inn could enjoy a broad view of the farmlands and oil fields stretching out to the ocean. (1920s)^^ - View looking down toward the top of a hill where Lookout Mountain Inn once stood. Two early model automobiles are seen parked on an unpaved parking area overlooking the city. 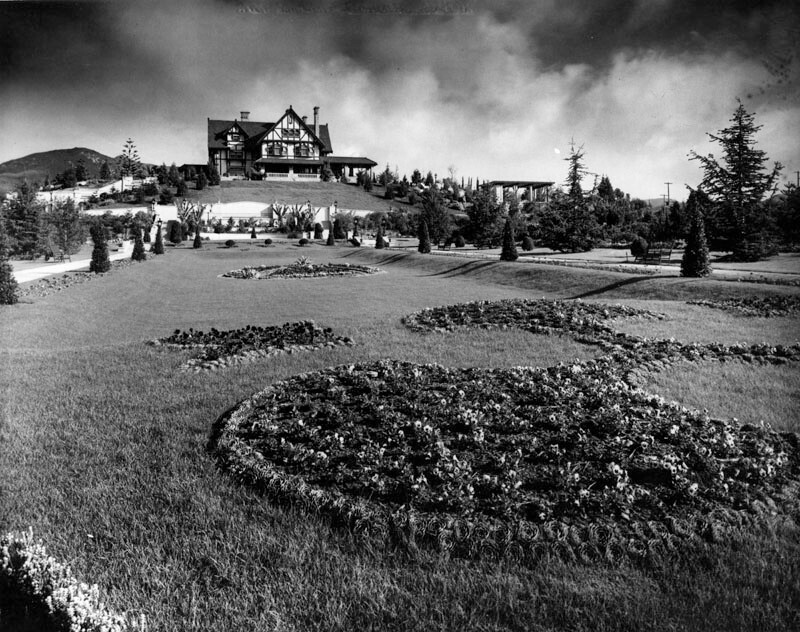 Lookout Mountain Inn burned down in 1918. 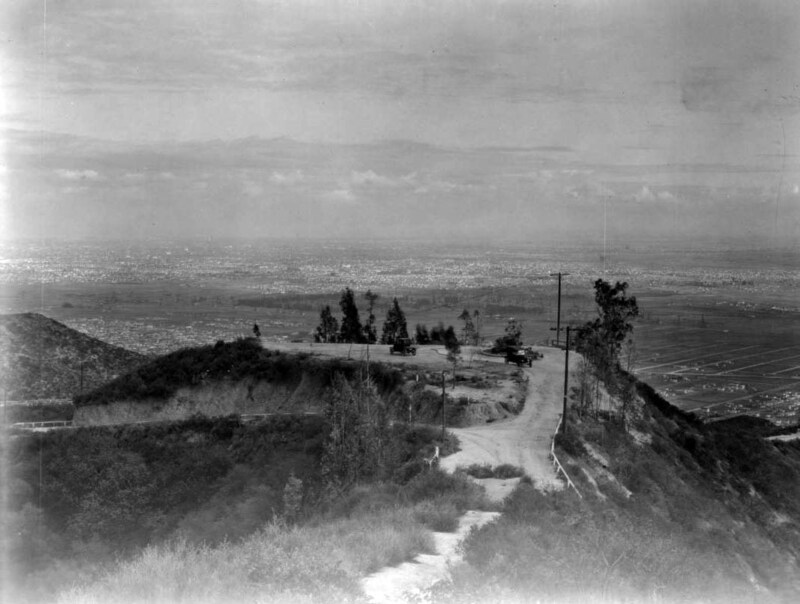 (Early 1900s)^^^ - View looking southeast from Lookout Mountain towards Hollywood. If the camera were turned about 45 degrees to the right, we would be looking almost straight down La Cienega, which "points to" Lookout Mountain from West Hollywood and mid-Wilshire. (ca. 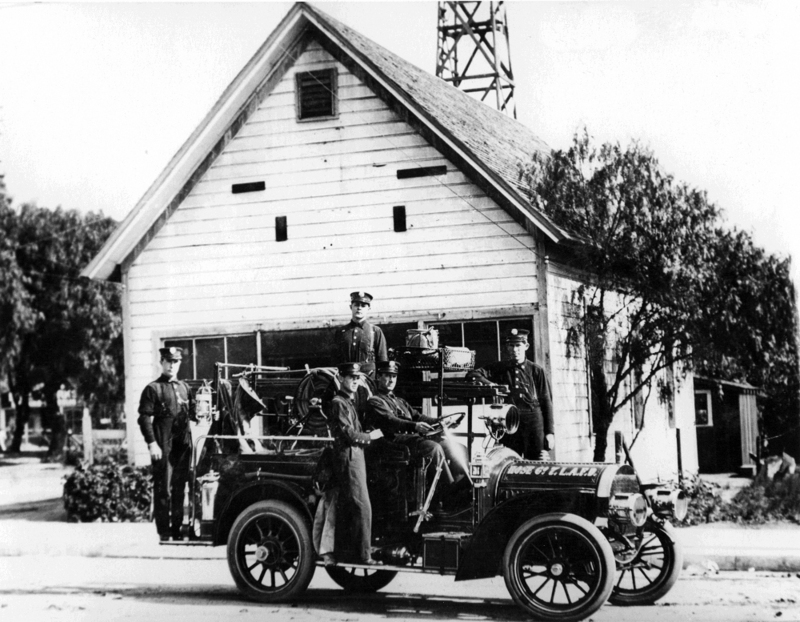 1910)^#* - View of the original Fire house of "City of Hollywood" as annexed in 1910, located at 1560 N. Cahuenga Blvd at Selma. After being taken over by L.A.F.D. it was designated Hose Co #7. The old building had originally been a church. When Eng. Co #27 was established in 1912, Hose Co #7 was abandoned. (ca. 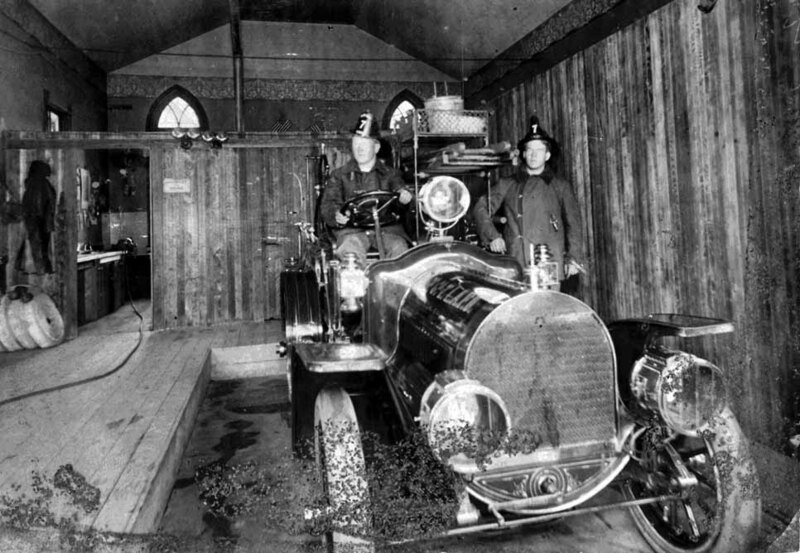 1910)^#* - Interior view of Fire Hose Co. #7 located on the southwest corner of Selma and Cahuenga in Hollywood. The building had once been used as a church. 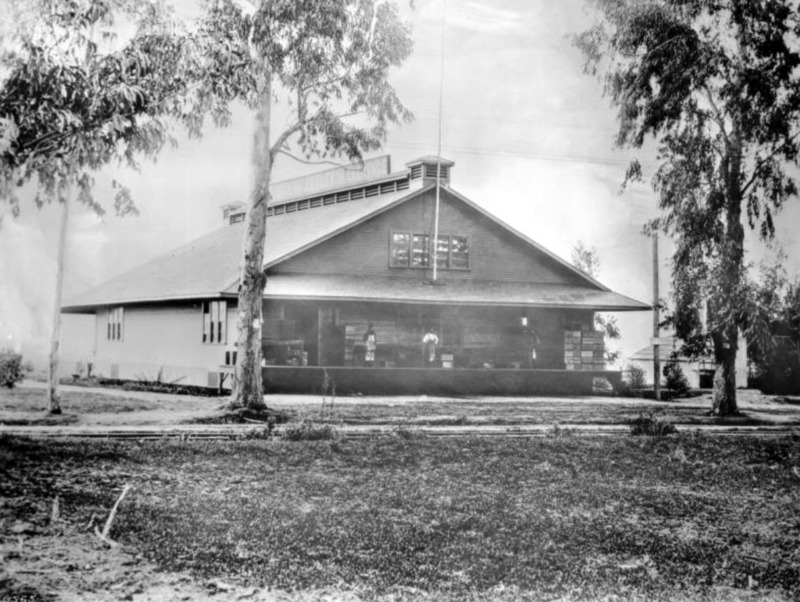 (1916)* - Exterior view of the L.A.F.D. 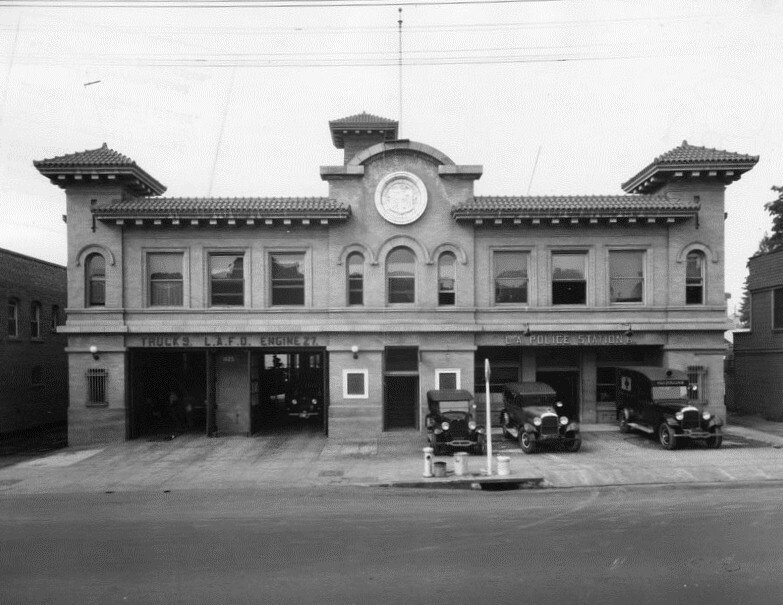 Fire Department, Engine 27, and the L.A. Police station, sharing the same building at 1629 Cahuenga Blvd in Hollywood. 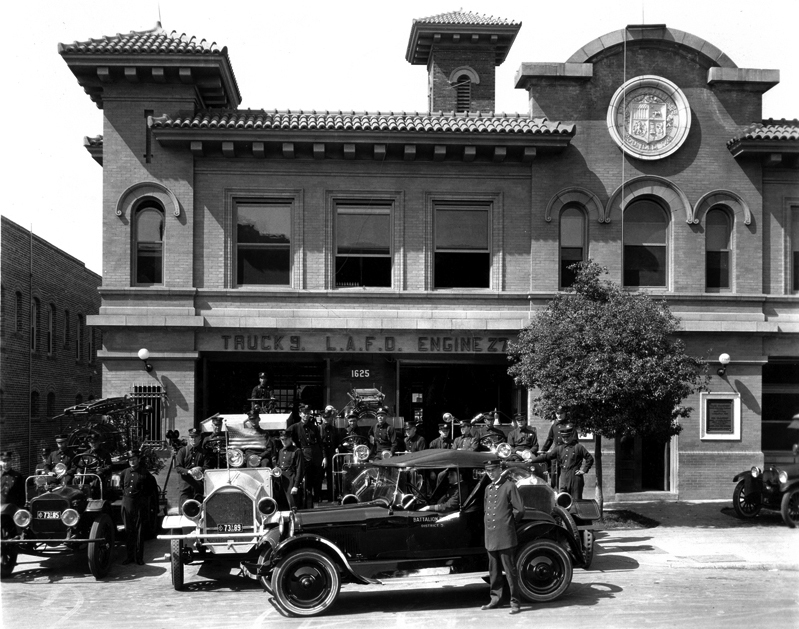 (1923)^#* - View of firemen and equipment in front of the LAFD Engine 27 side of the 1629 Cahuenga Blvd building. The other side of the building was used as the Hollywood Police Station. (1924)* - Police officers stand on the street outside of the Hollywood police station, Division 6, located at 1629 Cahuenga Avenue, just north of Selma Avenue. Neighboring businesses, a hotel (left) and a shoe shop (right), are also captured in the image. 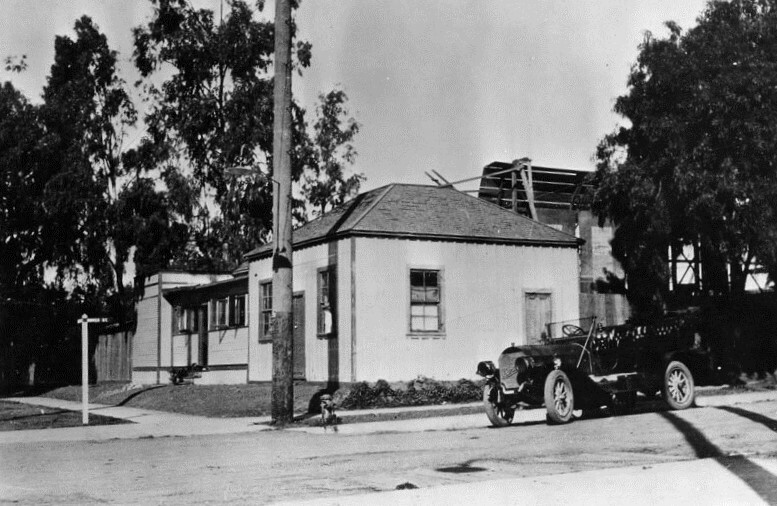 (1916)* – View showing the Cahuenga Branch of the Los Angeles Public Library, located at 4591 Santa Monica Boulevard, with motorcycle and early model cars parked in front. (ca. 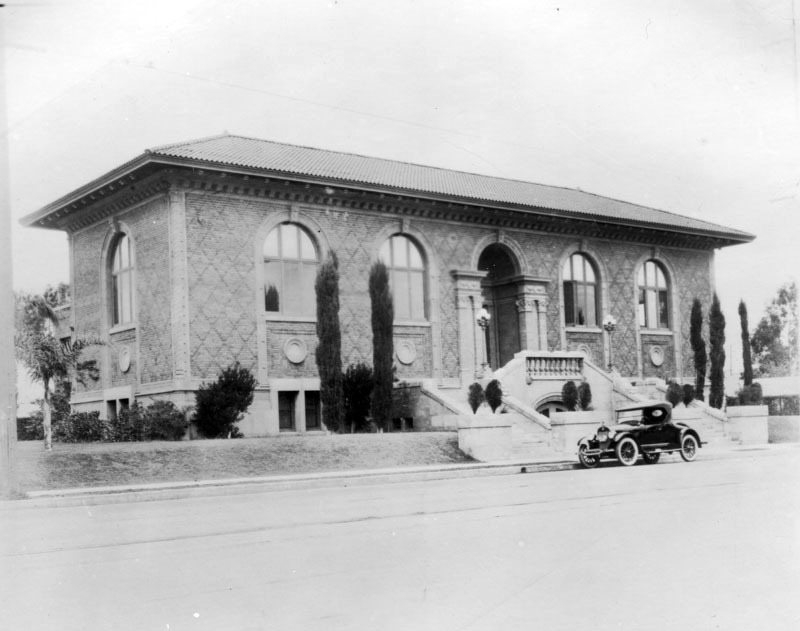 1920)* - View of the Cahuenga Branch of the Los Angeles Public Library, located on the northeast corner of Santa Monica Boulevard and Madison Avenue. The Italian Renaissance style building was designed by architect Clarence H. Russell (1874-1942), who also was associated with Norman F. Marsh in the building of Venice and its canals. (2014)#+ - Front view of the Cahuenga Branch as it appeared located at 45901 Santa Monica Boulevard. Click HERE to see a more contemporary view. 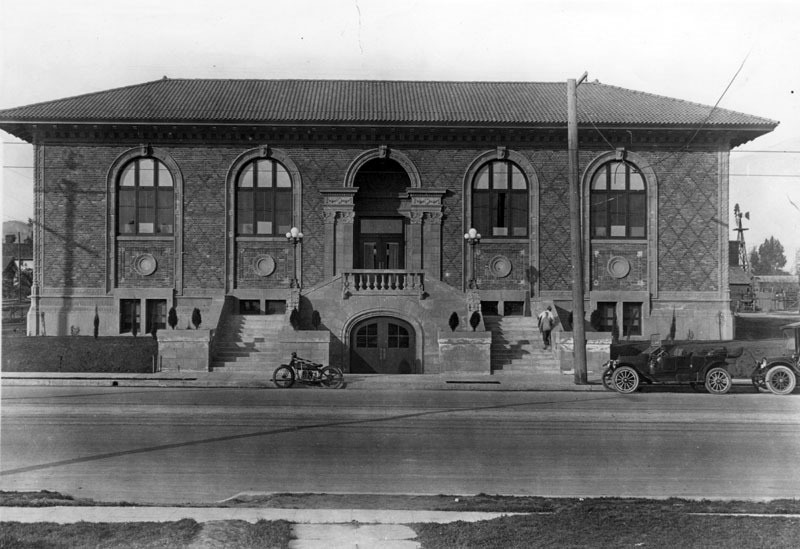 The 1916-built Cahuenga Branch is the third oldest branch library in the Los Angeles Public Library system. It is one of three surviving Carnegie libraries in Los Angeles, the other two being the Vermont Square Branch and the Lincoln Heights Branch. 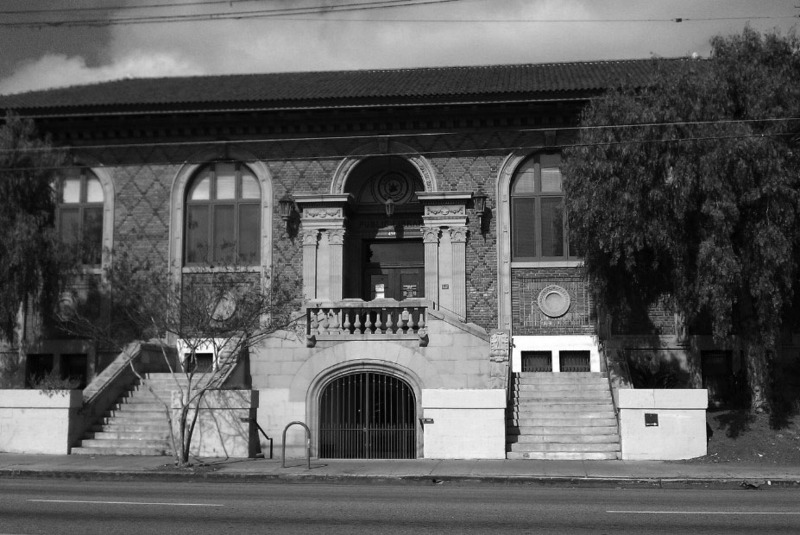 In 1986, the Cahuenga Branch Library was designated as LA Historic-Cultural Monument No. 314. It is also listed in the National Register of Historic Places. Click HERE to see the complete list of LA Historical Cultural Monuments. (ca. 1916)* - Entrance to the Famous Players-Lasky Corporation West Coast Studios located at 5555 Melrose Avenue before Paramount was added. 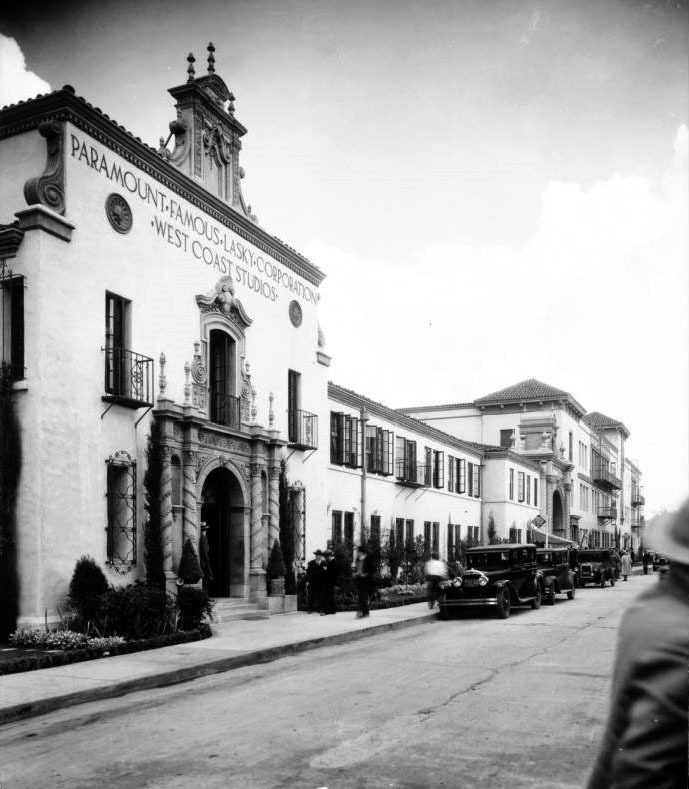 (1930)^^ - View of the Paramount Famous Lasky Corporation Studios at 5451 Marathon Street in Hollywood. The main entrance is through an elaborately carved stone archway in the foreground at left, and a sign above the entryway bears the name of the studio. A line of dark vehicles is parked along the side of the street in front of the building, and many pedestrians can be seen as well. Click HERE to see more Early Views of Paramount. (1916)## - Panoramic (Left Panel) view showing the Beachwood Canyon Outdoor Theatre being set up for a performance of Julius Caesar. 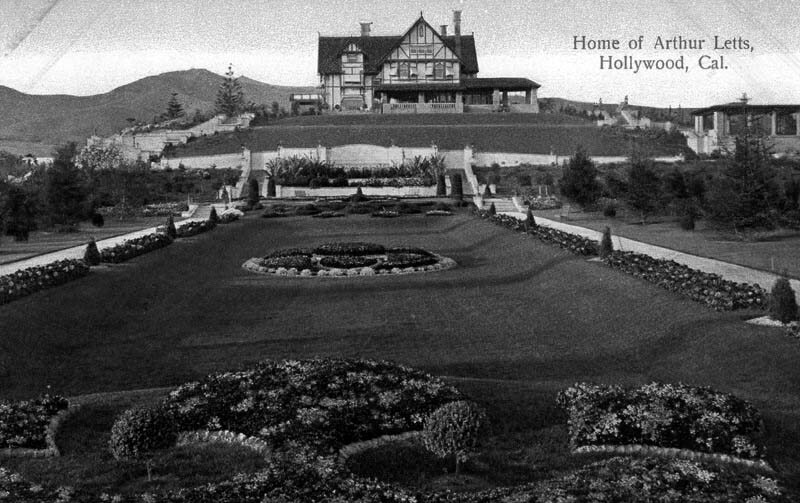 In 1911, Albert Beach paved the way to the Hollywood Hills and named "Beachwood Drive" after himself. (1916)## - Panoramic (Right Panel) view showing the Beachwood Canyon Outdoor Theatre being set up for a performance of Julius Caesar. 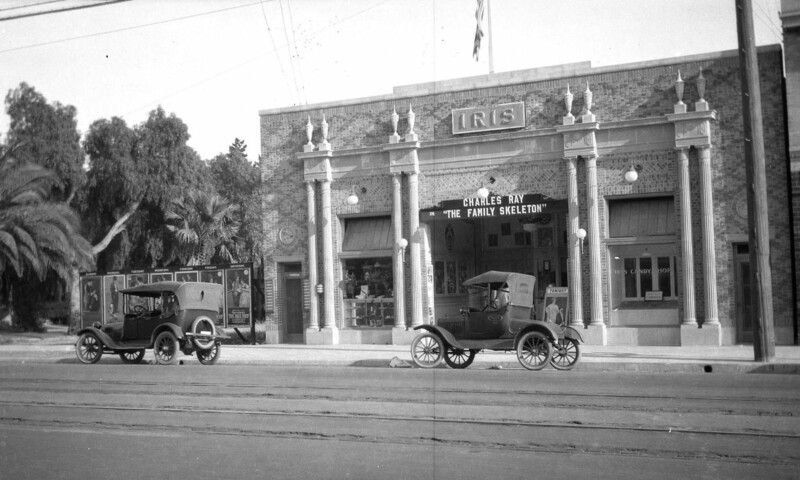 (1918)^^^ - View of the Iris Theatre located at 6508 Hollywood Boulevard, Hollywood. Now showing: Charles Ray in "The Family Skeleton". 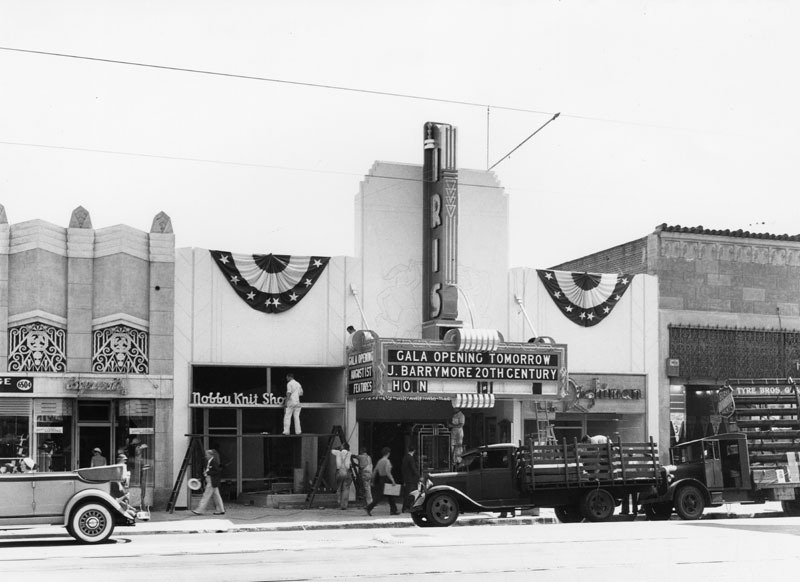 (1934)* - Exterior view of the Iris Theater on July 31, 1934, located on Hollywood Blvd. west of Wilcox. Its marquee announces an opening of J. Barrymore. The Iris theatre was redesigned by architect S. Charles Lee in July 1934 and was given an Art Deco style. Fox Theater took over in 1965, and they remodeled the Streamline Moderne facade in 1969 into what we still see today. (ca. 1917)* - Aerial view of Hollywood, looking south on Western. Two orchard fields are seen in the foreground. 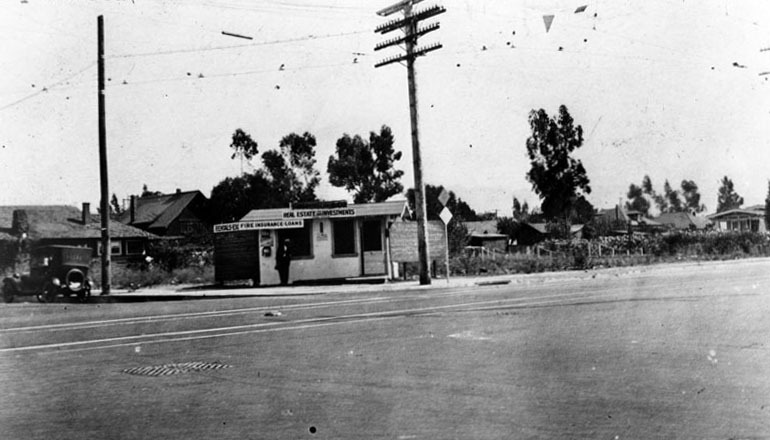 (1919)* - Northeast corner of Santa Monica Boulevard and Western Avenue. S. Robinson & Co. real estate and investments office is located on the corner. A man with a dark suit and hat can be seen leaning against the building next to one of the widows. It appears that a small field of flowers is to the right, and houses in the background. A lone automobile is parked along Western Avenue. (ca. 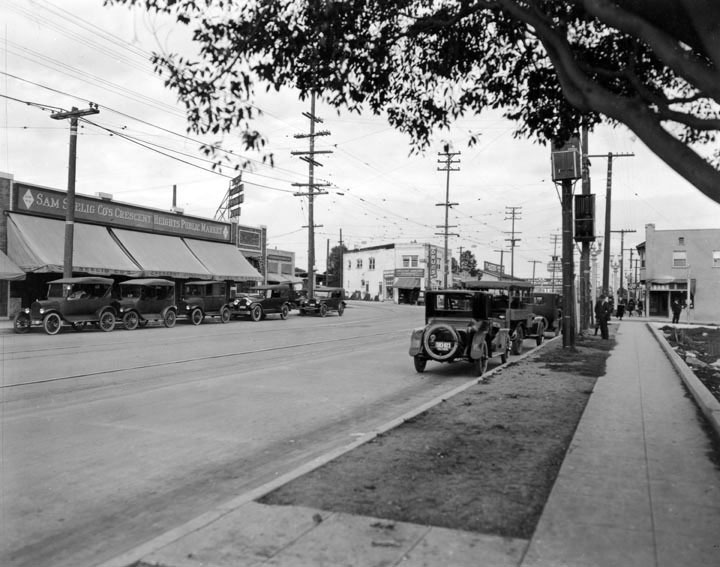 1920)* - Photograph of stores, shops and street traffic near intersection of Crescent Heights and Santa Monica Boulevard in West Hollywood. Sam Seelig Co.’s Crescent Heights Public Market on left. Sam Seelig Company was founded in April 1912 by Sam Seelig, who had come to California from Arizona in 1911. 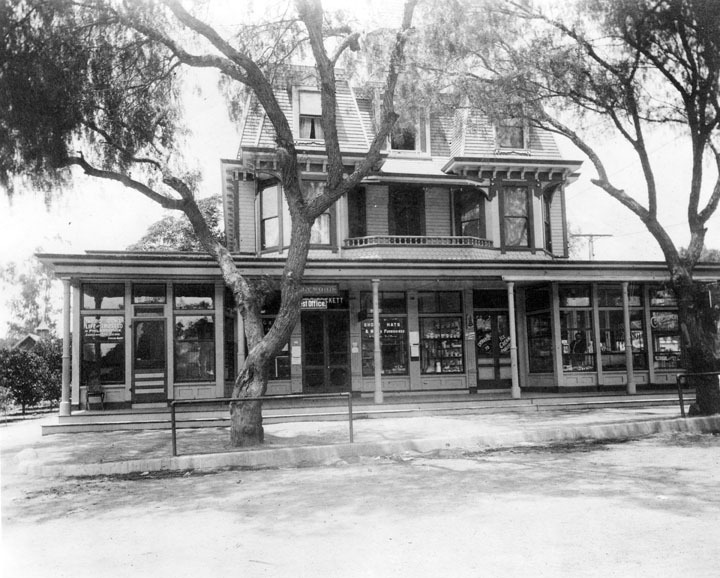 Seelig opened a single grocery store in Los Angeles at the corner of Pico and Figueroa streets. The chain had grown to 71 stores by 1922. After World War I, the firm became deeply indebted to its main grocery wholesaler, a firm owned by W.R.H. Weldon. In a swap of stock for debt, Weldon assumed control of the chain, leaving Seelig in charge of retail operations. Seelig then left the company in 1924 to enter the real estate business, forming Sam Seelig Realty. (ca. 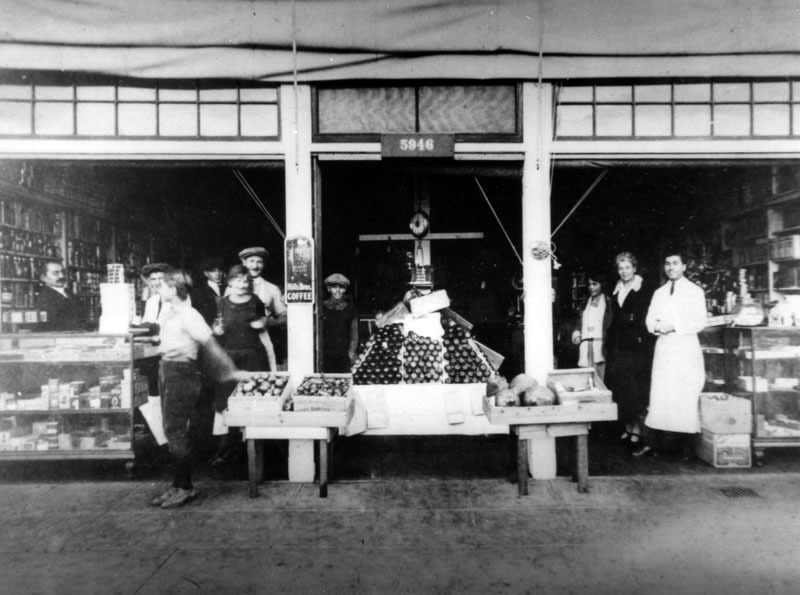 1919)* - Exterior view of the Linardos Bros. Market where customers are seen shopping. Two family employees are present in the image: Takis Linardos (left), who helps customers at the counter and John Linardos (right in white apron). The market is located at 5946 Sunset Boulevard in Hollywood. (ca. 1919)* - Interior view of the well-stocked Linardos Bros. Market, located on Sunset Boulevard in Los Angeles, California. John Linardos, is standing behind counter. (ca. 1920s)* - A view of Hollywood Blvd., west from Vine St. Rails are in the middle of the street, cars parked at the curb and establishments along the street include W. P. Fuller Co., the Witzel Studio housing Hollywood Art Galleries and J. Van Den Akker Jeweler. 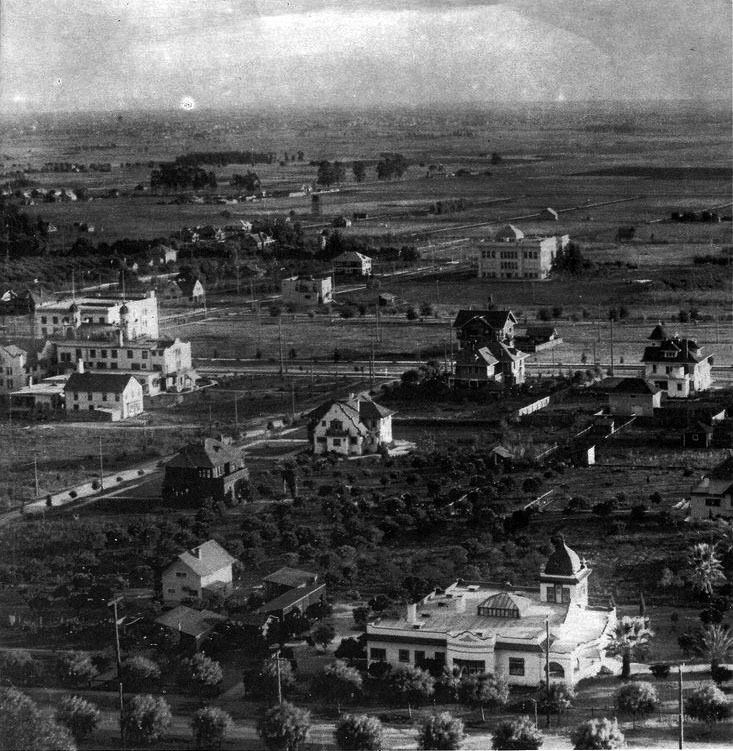 (1918)^^ - Aerial view of Hollywood looking north. Highland Avenue runs straight up from center-bottom and then snakes its way to Cahuenga Pass. The intersection of Hollywood Boulevard and Highland Avenue is at center of photo. The Japanese estate and gardens of brothers Charles and Adolph Bernheimer is perched high on a hill in the upper-left corner. 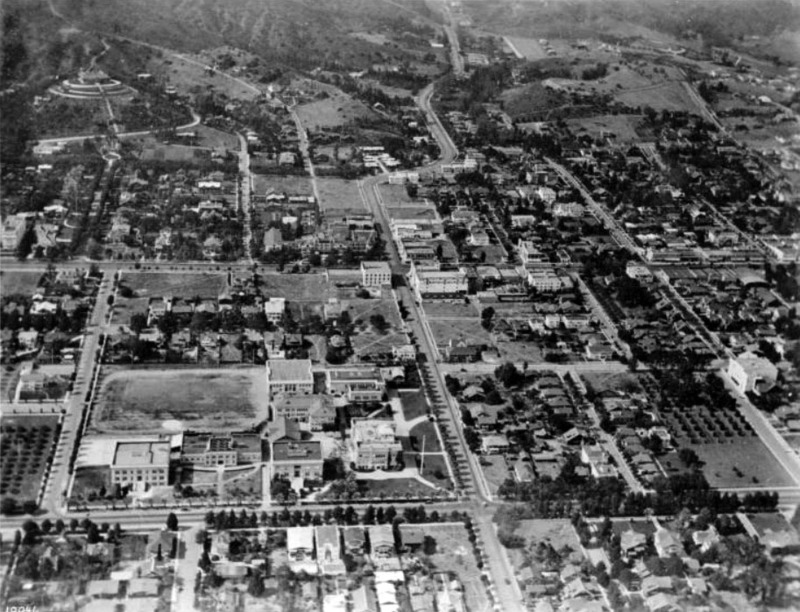 Hollywood High School is seen at lower center-left , on the northwest corner of Sunset Boulevard and Highland Avenue. 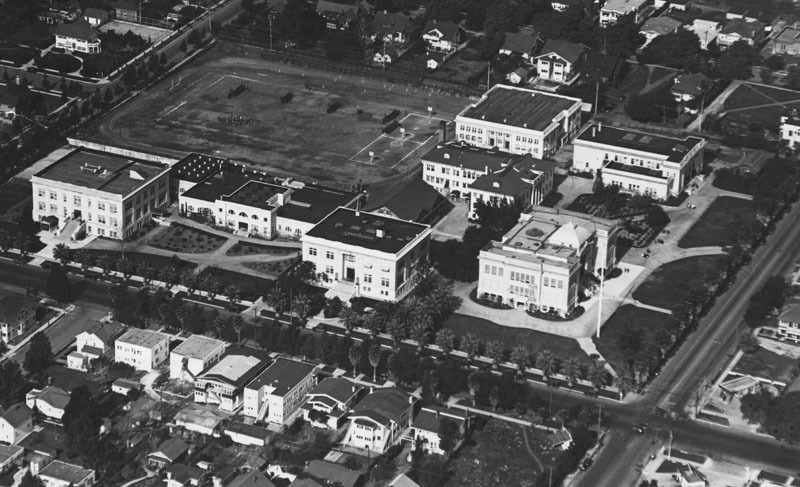 (1921)* - Aerial view of Hollywood High School and surrounding area in 1921. 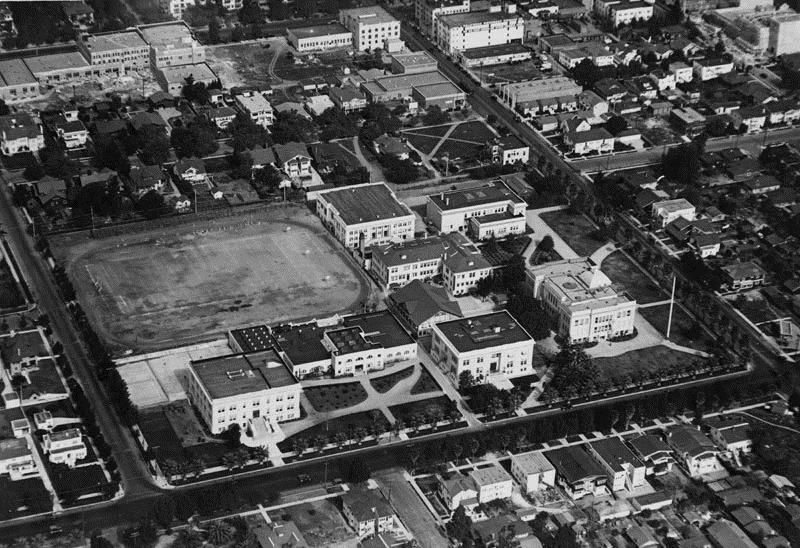 (1922)* - An aerial view of Hollywood High School from the southeast. There is practice of some kind on the athletic field where two basketball courts have also been marked off. 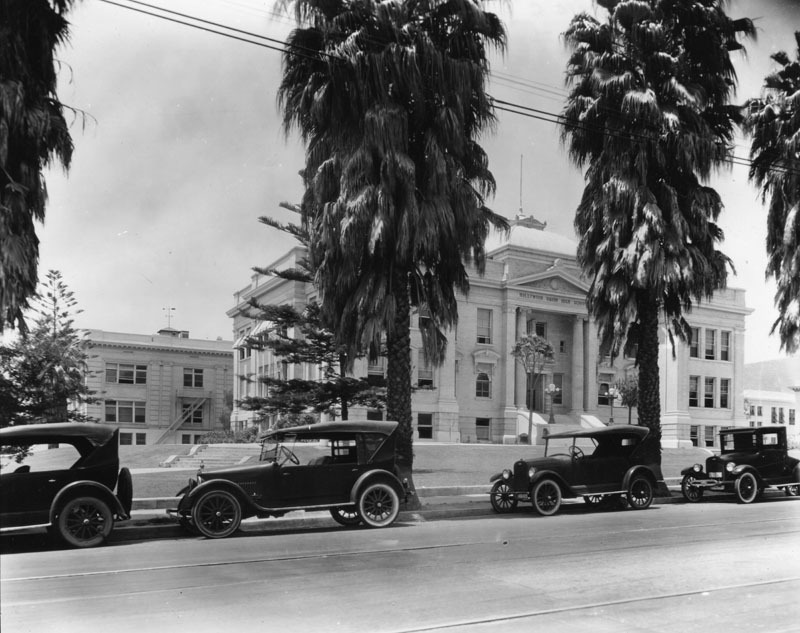 (1920)* - A view of Hollywood High School campus, or quadrangle, looking northwest from Highland Ave. Cars are parked in front of fan palms that need to be trimmed. Yucca trees grow by the stairs leading to the entrance of the original 1905 building. "Hollywood Union High School" is chiseled over the entrance. (ca. 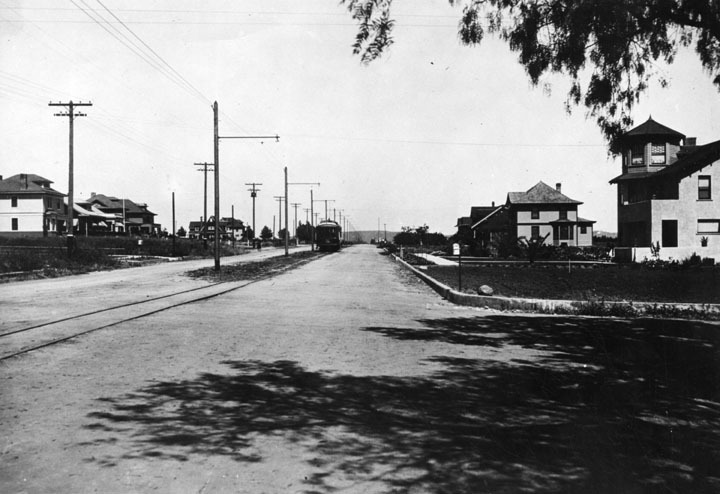 1922)* - Looking west from Sunset Boulevard where it meets Highland Avenue. Hollywood High School can be seen on the northwest corner to the right. (ca. 1900)* - Large rural area with a few houses and trees. 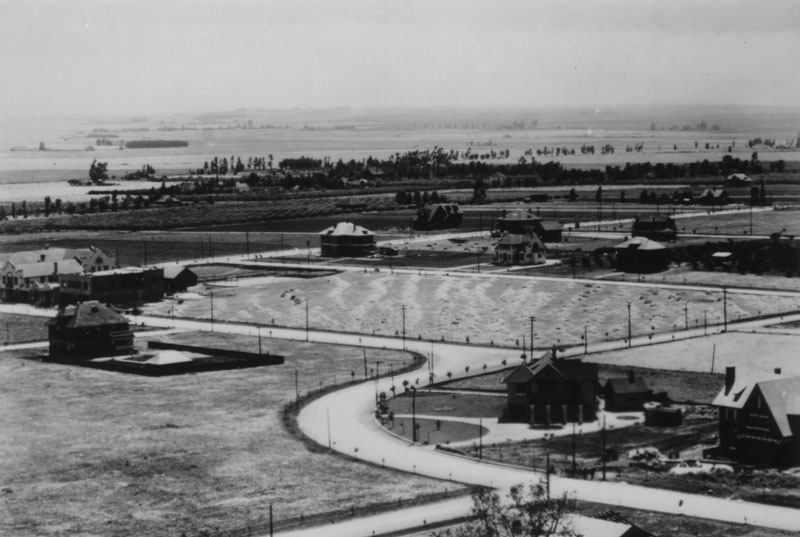 The future site of Melrose and Normandie, 1906. Mt. Hollywood peak can be seen in the upper right of the photo. 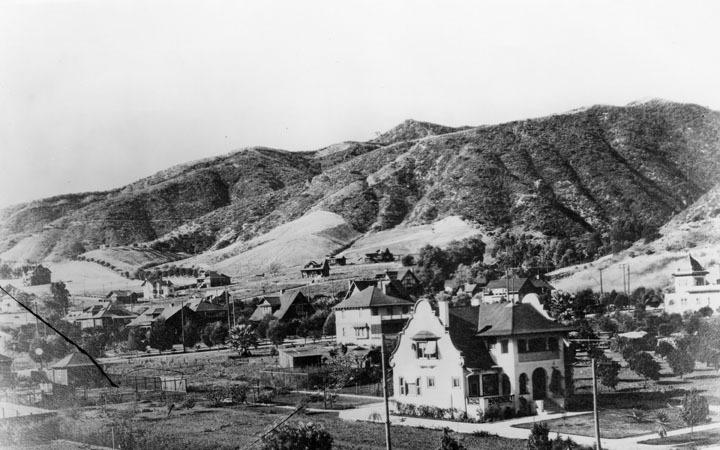 (1915)^^ - A view of the Hollywood Hills (part of the Santa Monica Mountains), taken near the present-day Paramount lot on Melrose Avenue. Photo, Courtesy of the USC libraries - California Historical Society Collection. (ca. 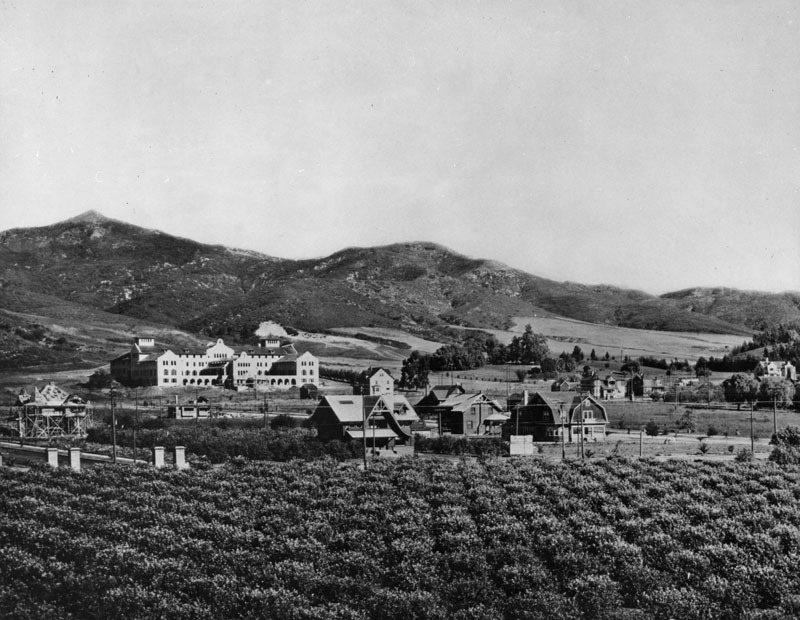 1915)^^ - View from the E. A. McCarthy ranch showing the Hollywood Hills in the background. (ca. 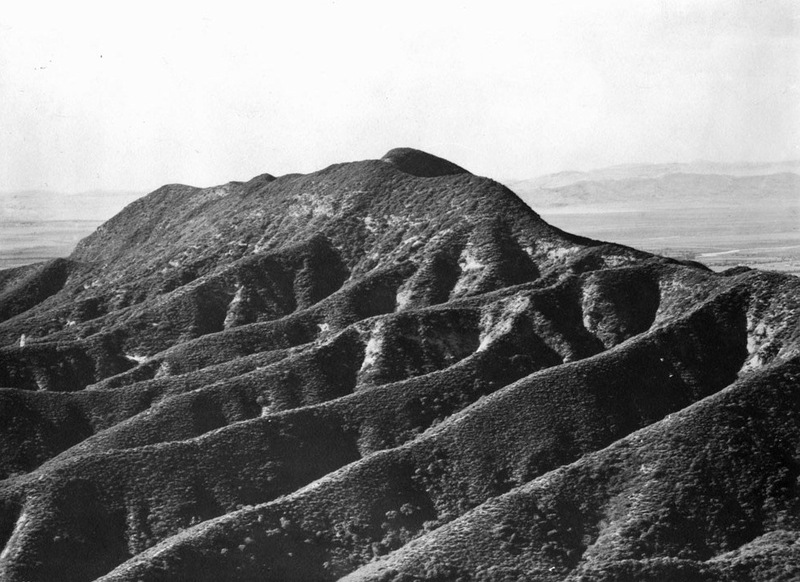 1905)^^ - View of the Cahuenga Peak near Hollywood, ca.1905. The lush mountain terrain looks like ripples (or waves) along the mountainside. Other mountain ranges are visible in the distance. (ca. 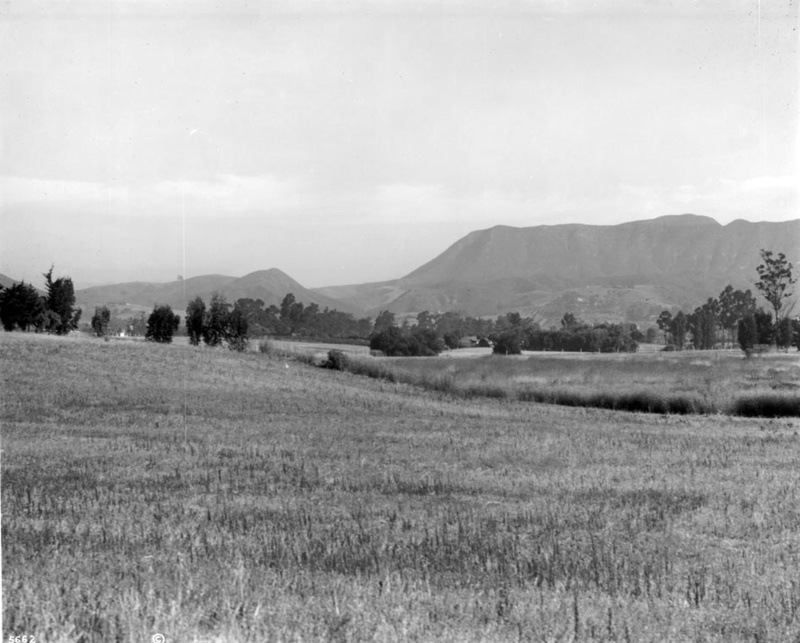 1938)* - Panoramic view of the Hollywood HIlls from Mount Lee. 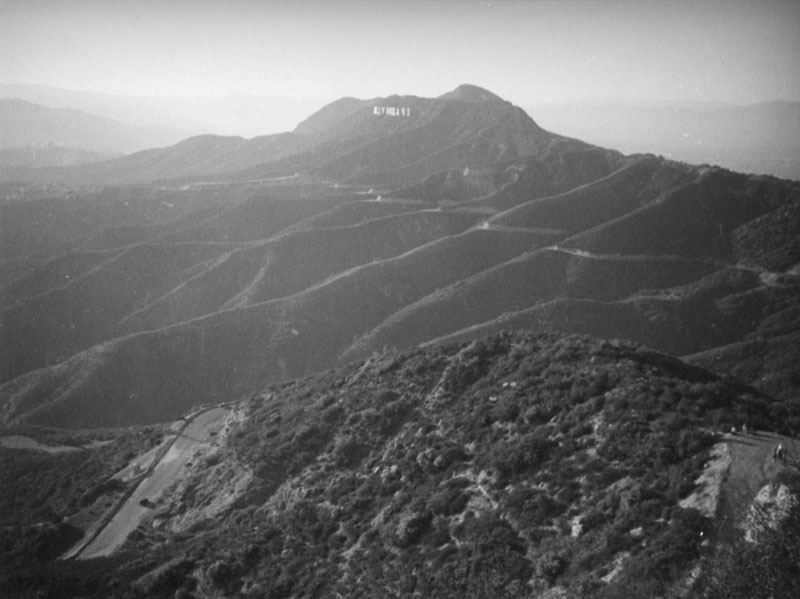 Cahuenga Peak, Mount Lee, and the Hollywoodland sign are seen in the distance. 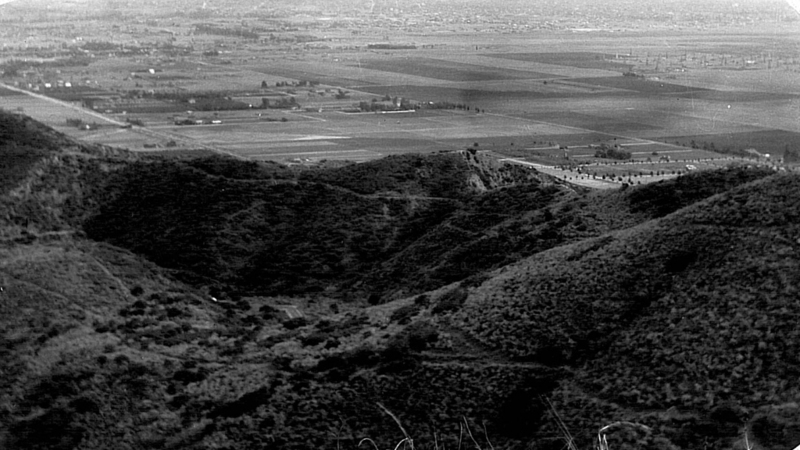 Howard Hughes acquired the Cahuenga Peak and surrounding acreage in the 1940 with plans to build a house for his love interest, actress Ginger Rogers. Rogers broke up their engagement, so the area was left undeveloped. In 2002, a group of Chicago-area investors named Fox River Financial Resources purchased the 138 acres parcel along the ridge including Cahuenga Peak from the Hughes Estate for $1,675,000 according to Los Angeles County property records. The investors considered constructing five luxury estates on the property. 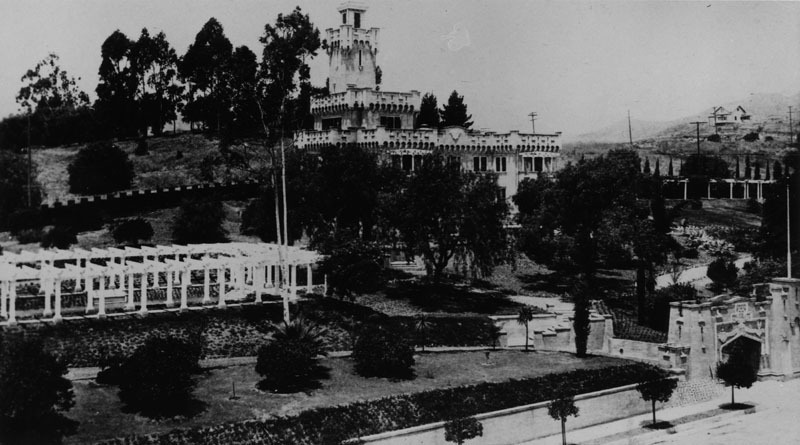 Los Angeles city officials said City Hall had received hundreds of letters pleading for the peak's protection, which prompted a campaign by city leaders and conservationists to raise $6,000,000 which they thought would be sufficient to buy Cahuenga Peak and turn it into an extension of nearby Griffith Park. (ca. 1905)^^ - View of Mt. Lee circa 1905. (2013)*^^* - View of Mt. Lee as it appears today. (ca. 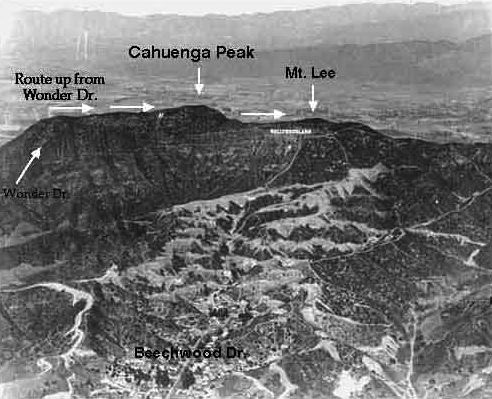 1920s)^**^ - Aerial view of the Hollywood Hills annotated to show the mountain peaks in relationship to the Hollywoodland Sign. 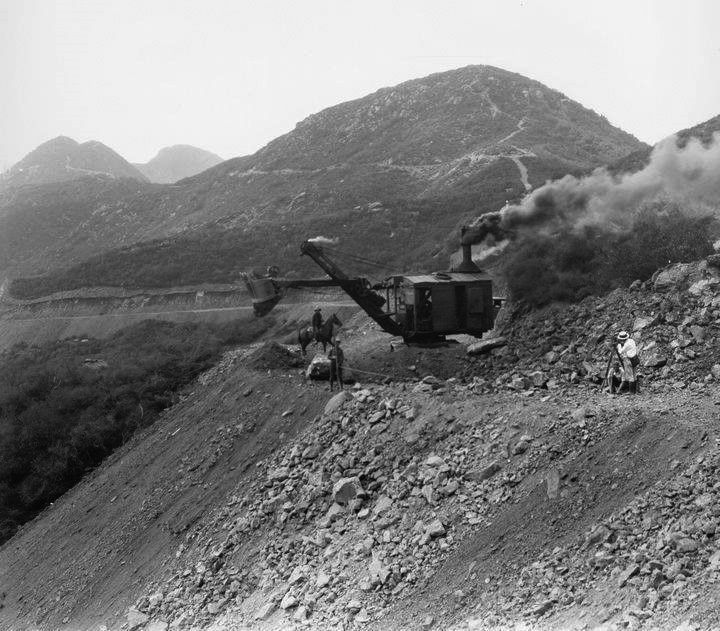 (1923)#**# – View of the Hollywood HIlls being excavated showing a steam shovel, a couple of workers, and a man on a horse. These men are working for the Crescent Sign Company and are erecting a very large sign that will advertise a new hillside housing development called - HOLLYWOODLAND. 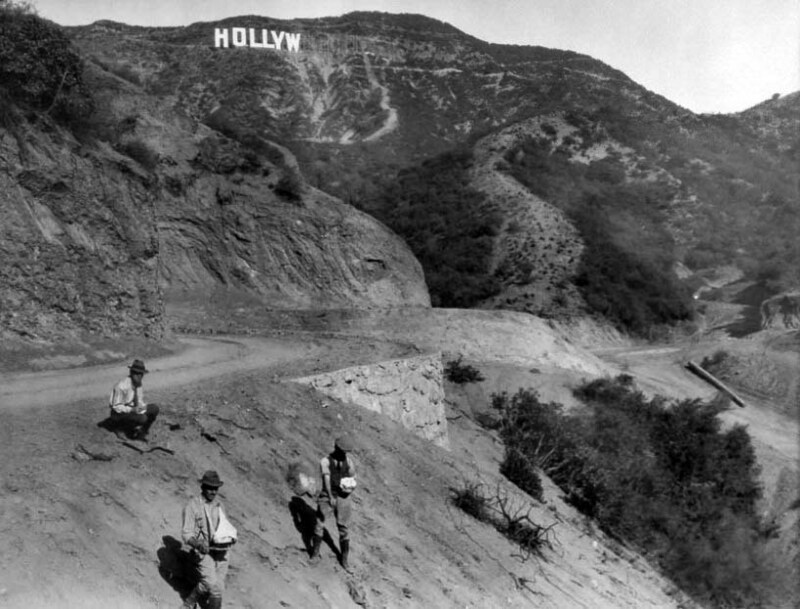 (1923)^##* – View showing the HOLLYWOODLAND sign making her appearance on Mt. Lee.